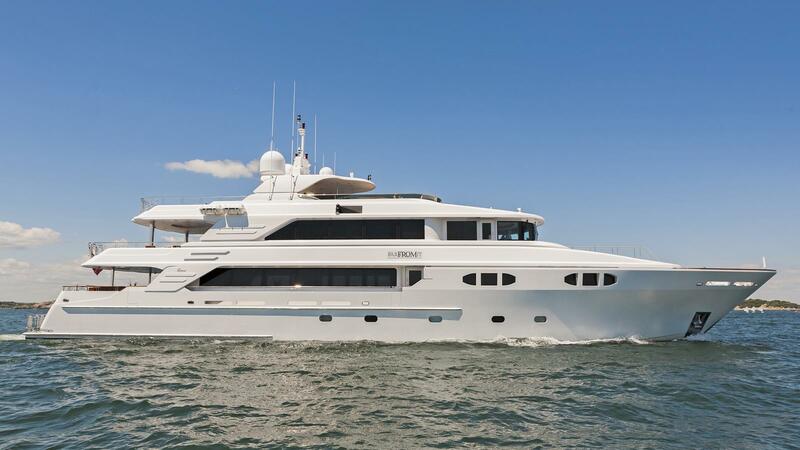 Motor yacht FAR FROM IT (previously Natita II, Richmond Lady) is a 43.30m (142') superyacht built by Richmond Yachts in 2008 with a refit in 2016. 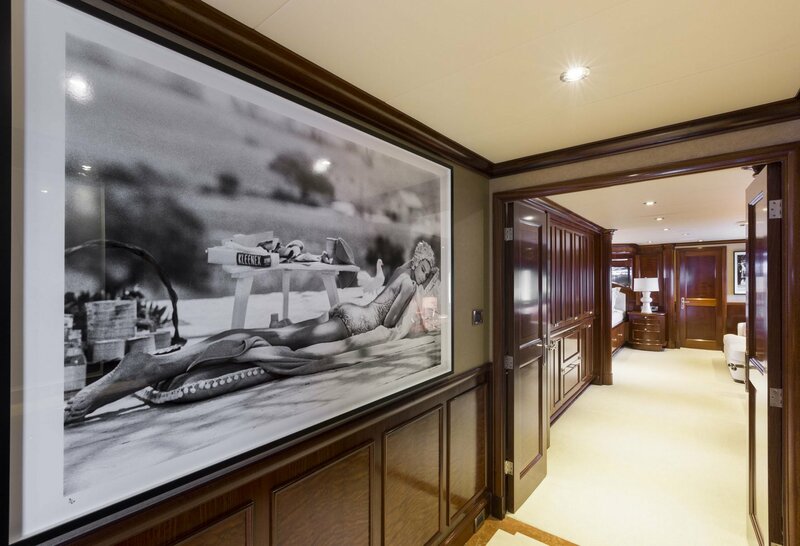 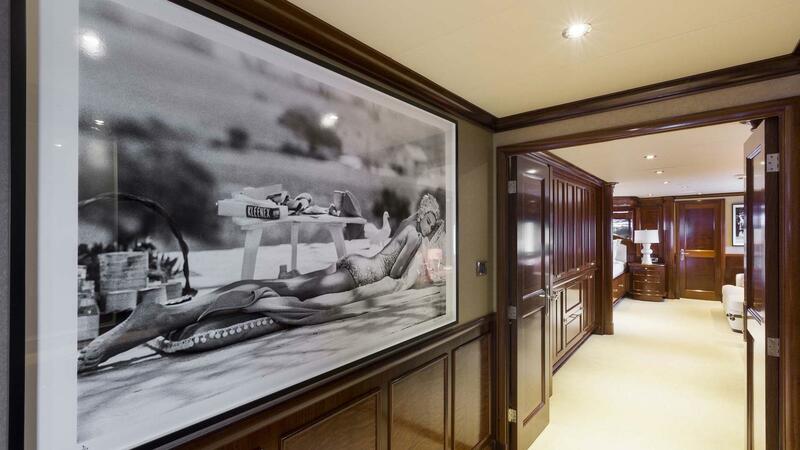 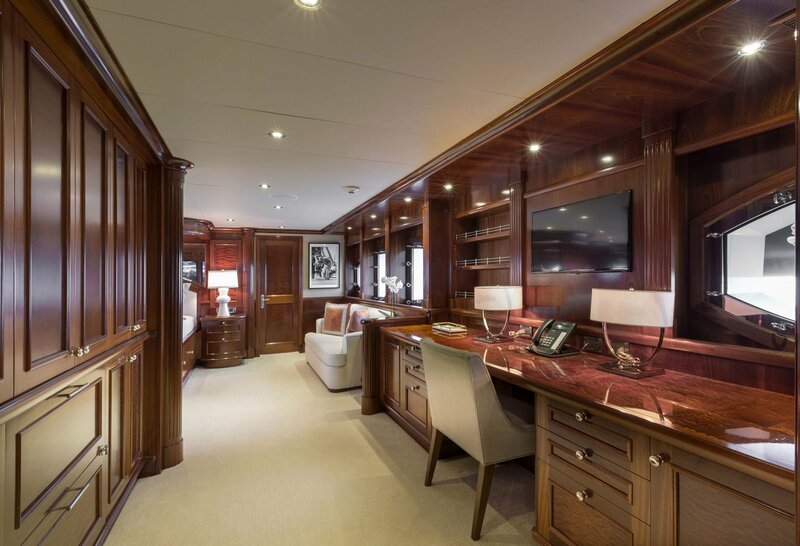 Her naval architecture is by Ward Setzer, and she offers accommodation for up to 10 charter guests. 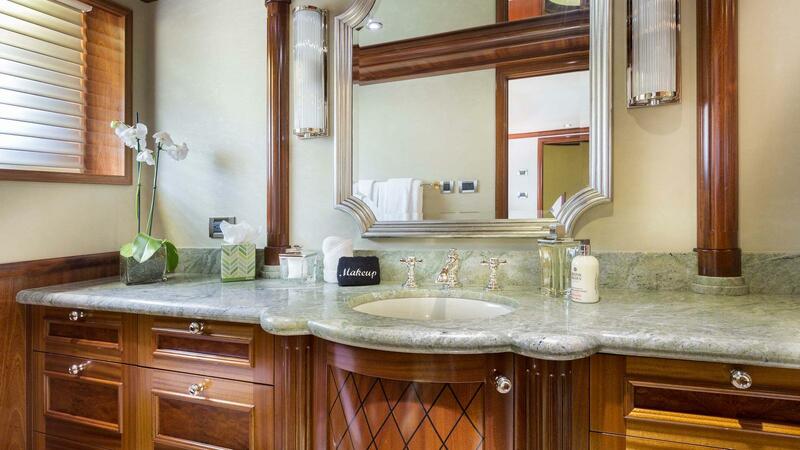 The main salon is stylish and timeless. 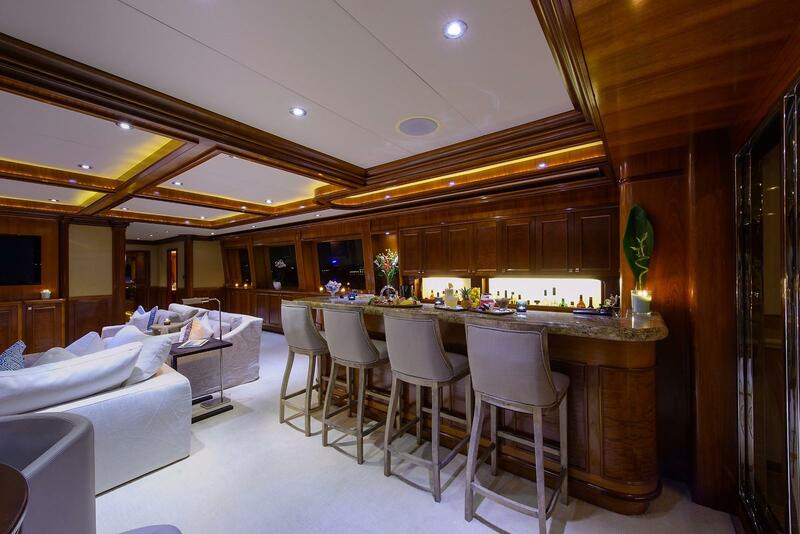 The lounge area features two sumptuous sofas, custom designed cocktail tables, and an occasional plush chair. 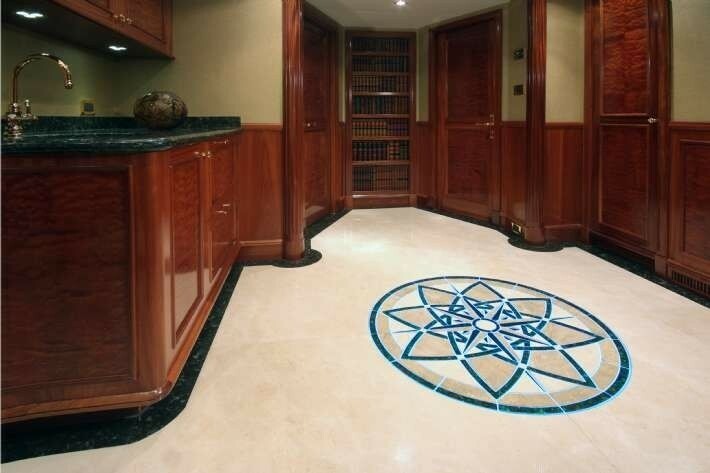 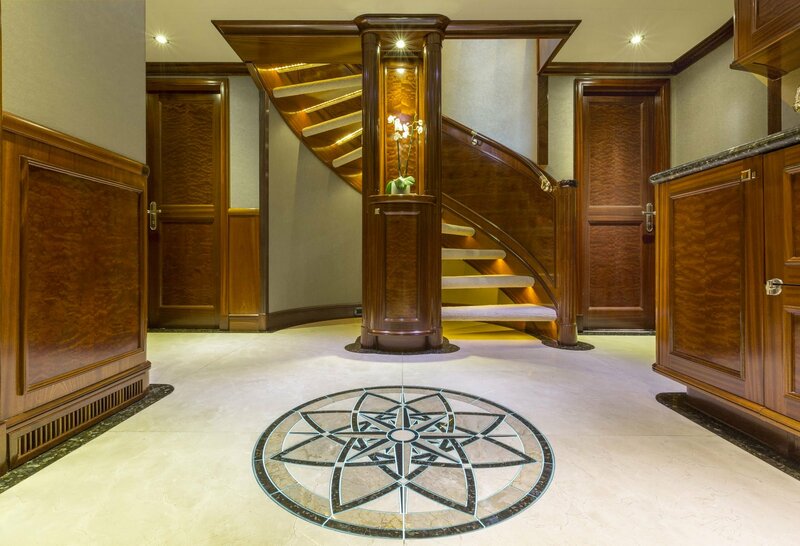 A bespoke etched compass rose on the ceiling above provides elegant lighting, while power drapes ensure optimum privacy. 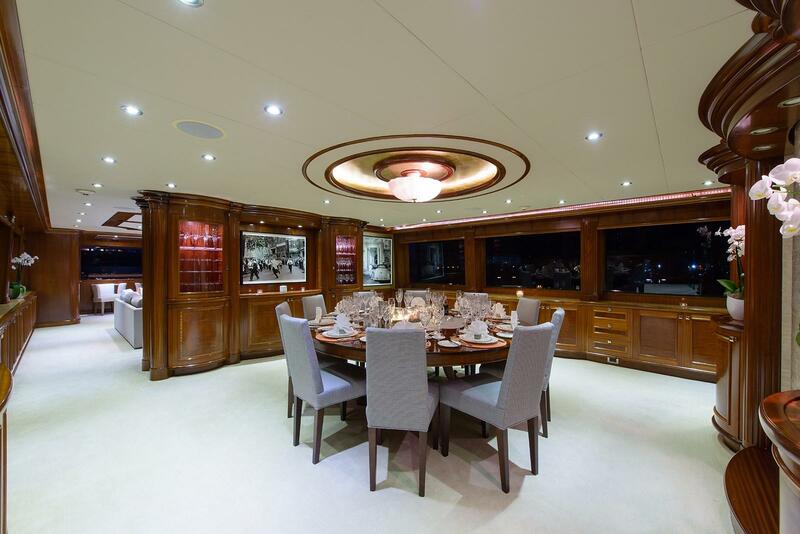 A state of the art entertainment center separates the formal dining area from the main salon. 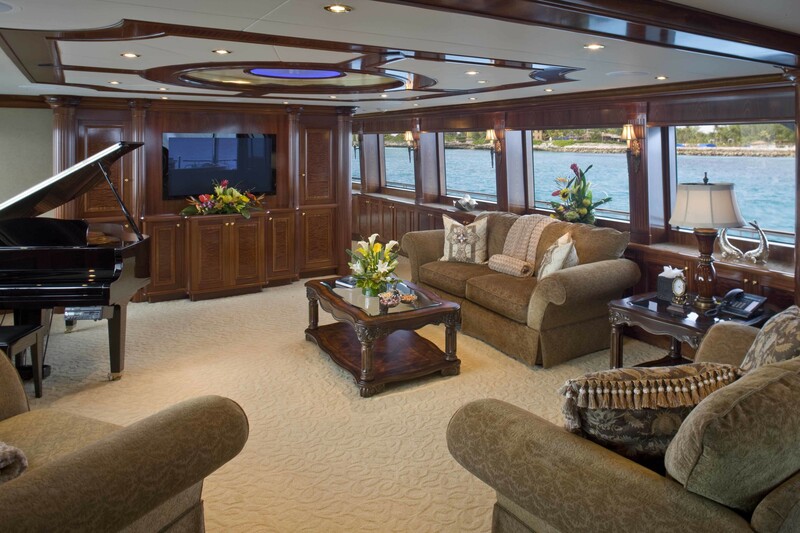 This system includes a fixed 52' LCD TV, Denon tuner/amplifier, DVD player, media music center and Satellite Receiver. 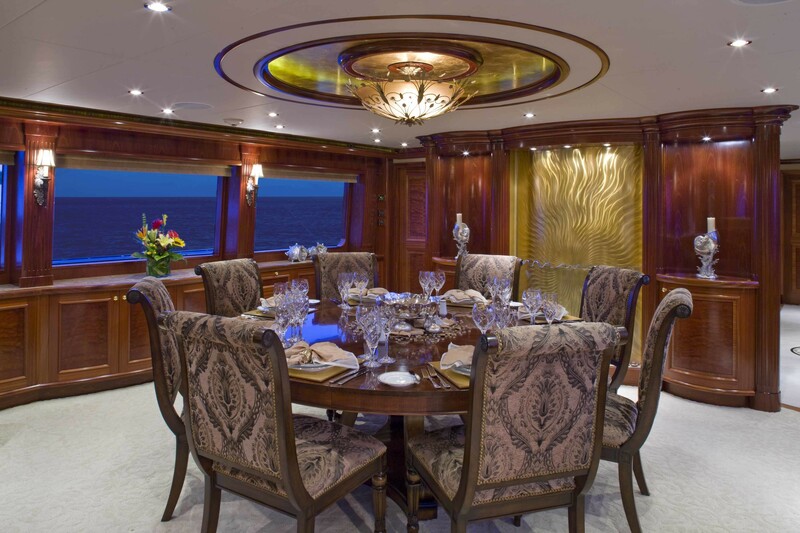 Her formal dining area is forward of the salon and features a mahogany dining table with seating for ten guests; space is complemented by superb Sapele and Pomele woodwork. 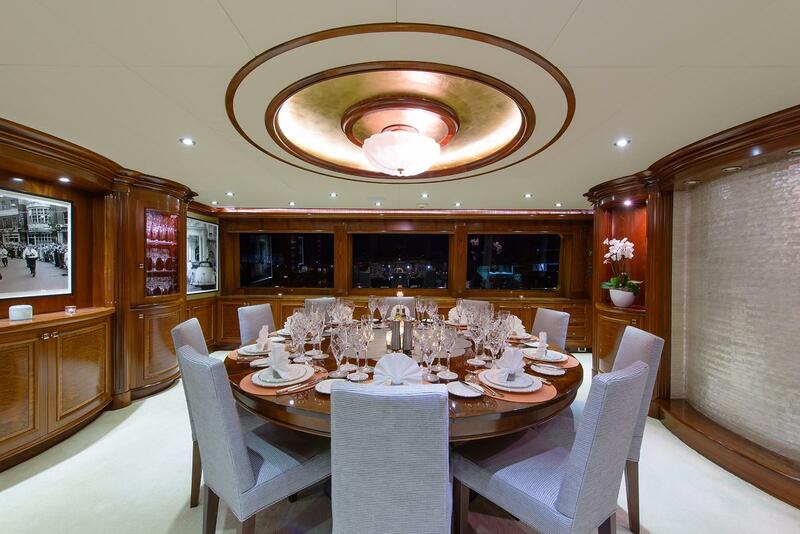 Overhead of the formal dining table, is a stunning French Gold Finish and White Murano Glass chandelier, while a beautiful curved gold and sapphire glass water wall is a beautiful feature, offering ambient lighting. 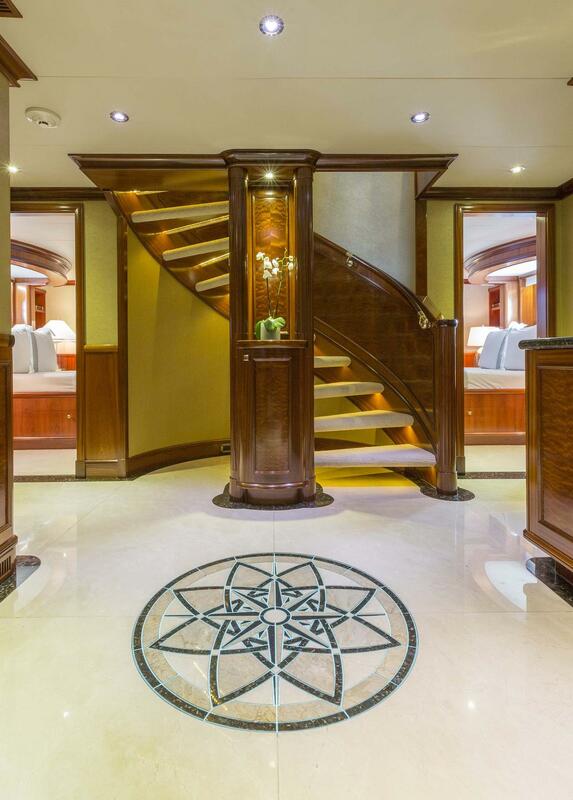 Winding stairs lead from the main salon up to the sky lounge foyer with access to another day head, pilothouse, and VIP stateroom. 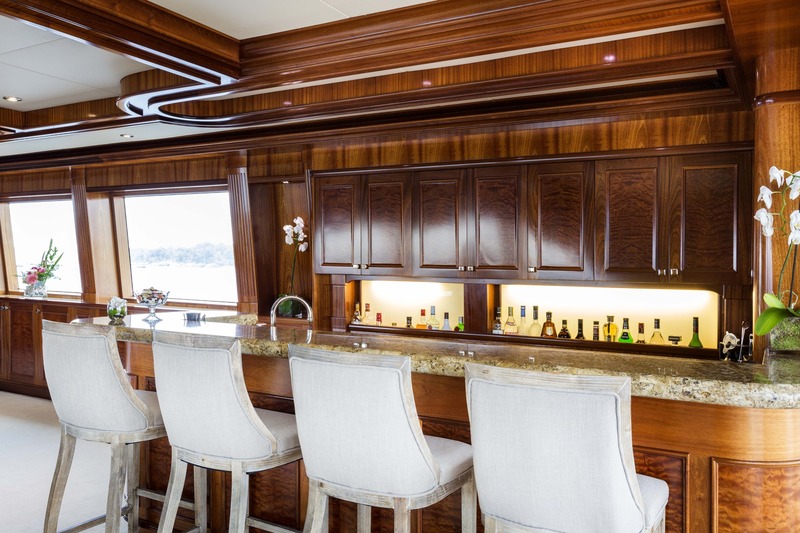 The sky lounge is capacious and has two large leather sofas, occasional leather chairs, an impressive granite wet bar with stool seating. 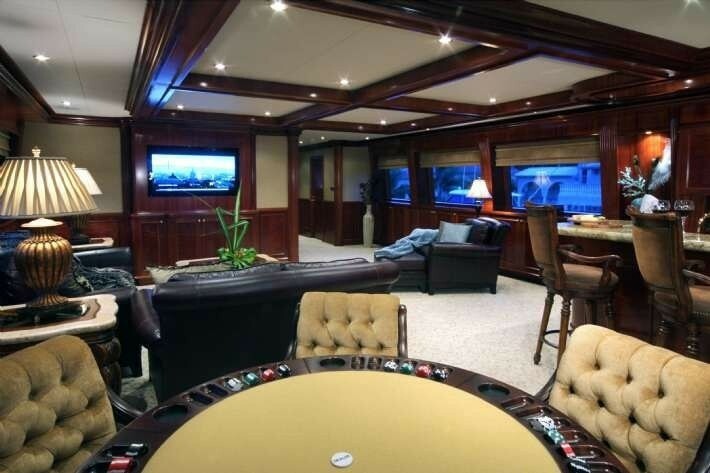 The entertainment center includes 52" LCD TV, Denon receiver-amplifier, DVD, CD, media computer center and Karaoke. 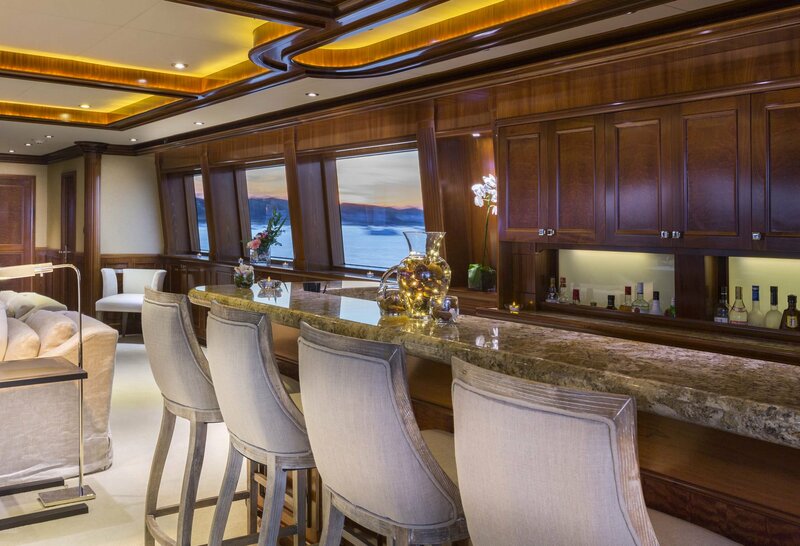 The sky lounge also features power drapes. 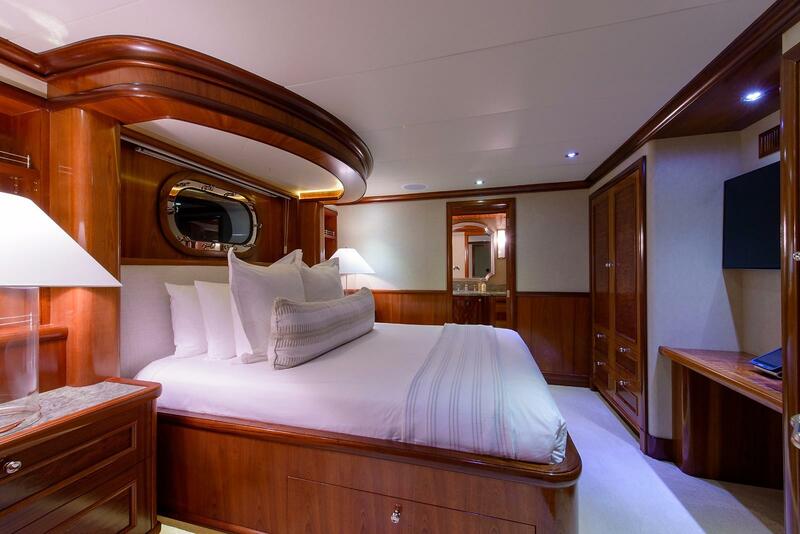 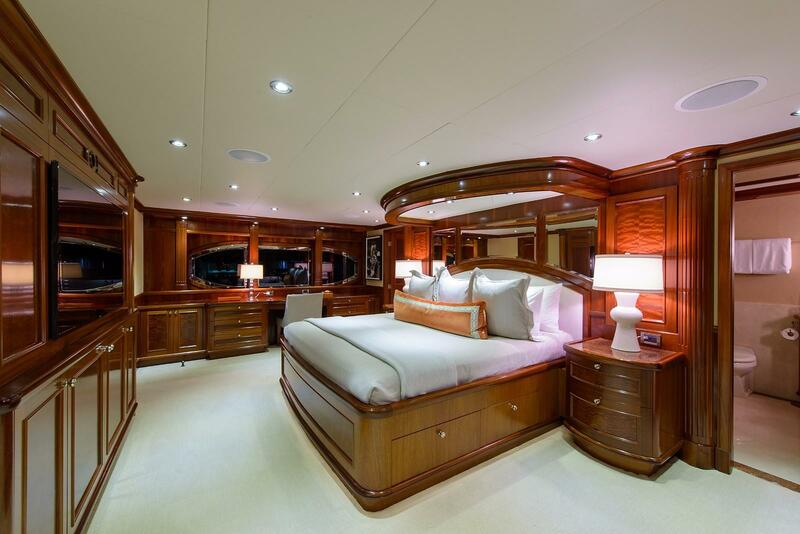 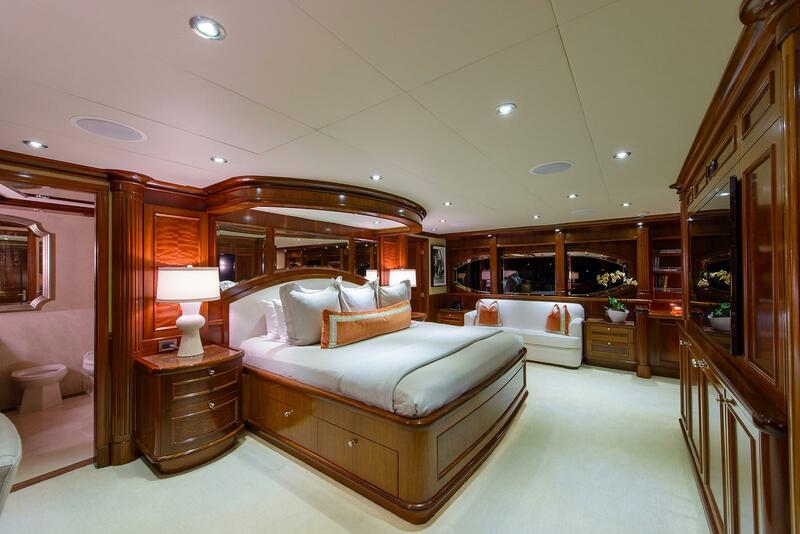 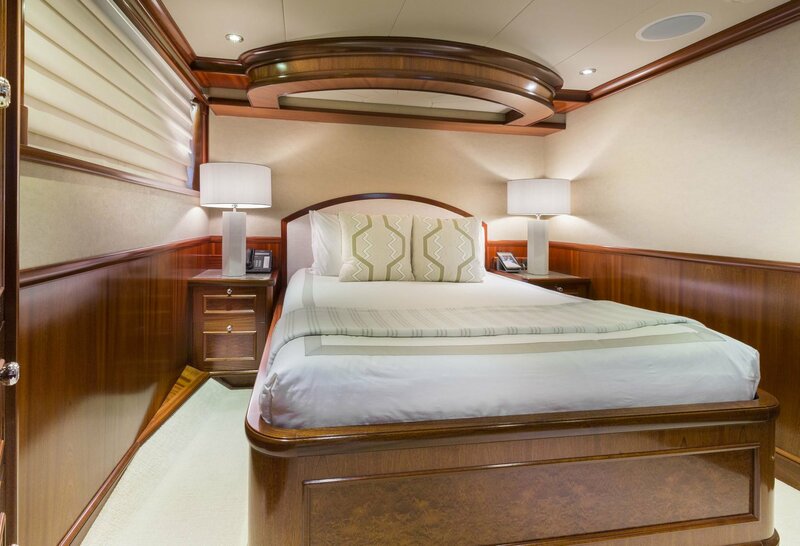 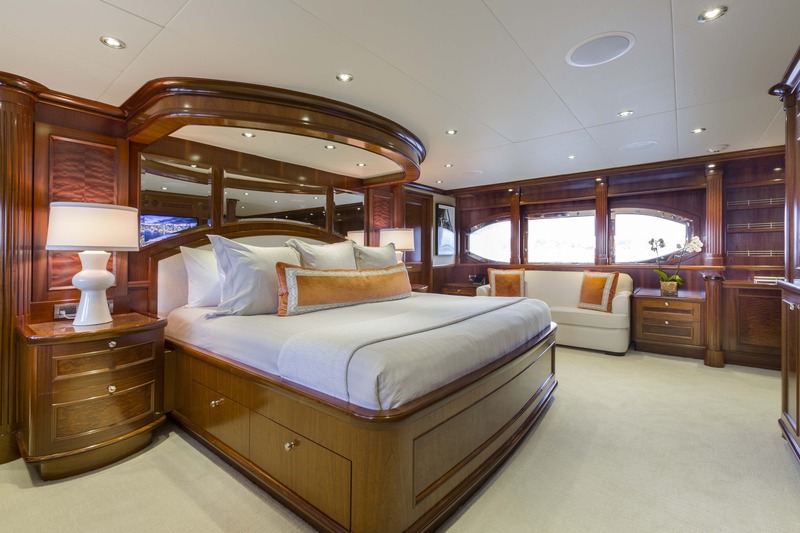 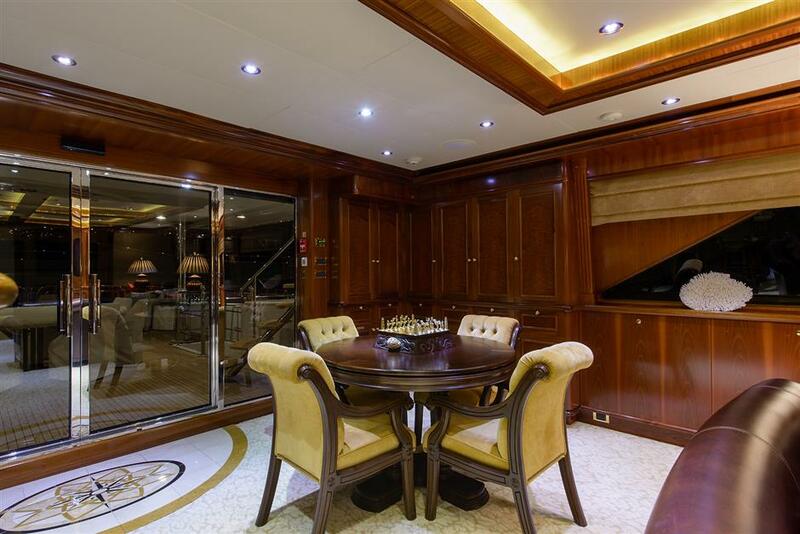 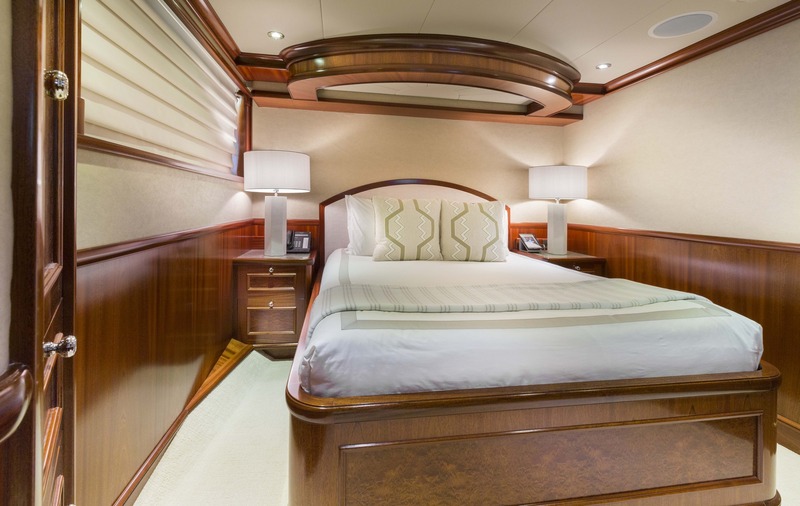 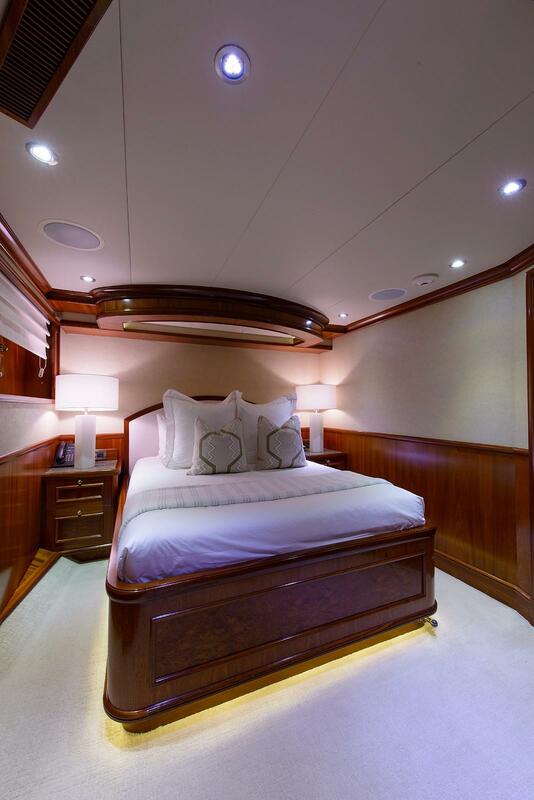 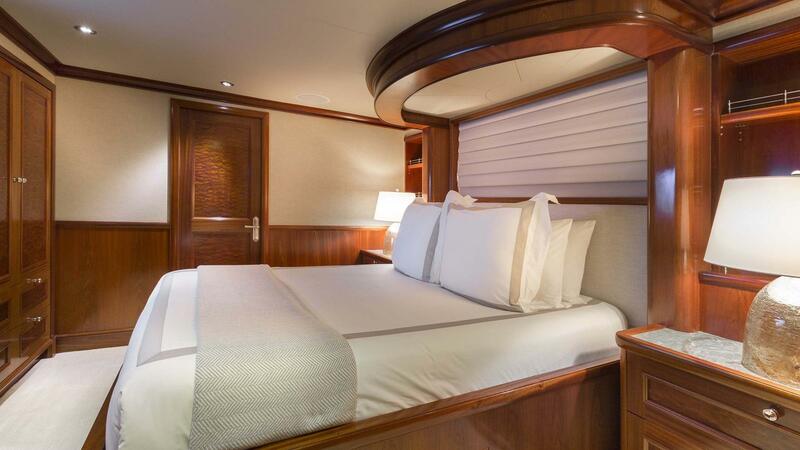 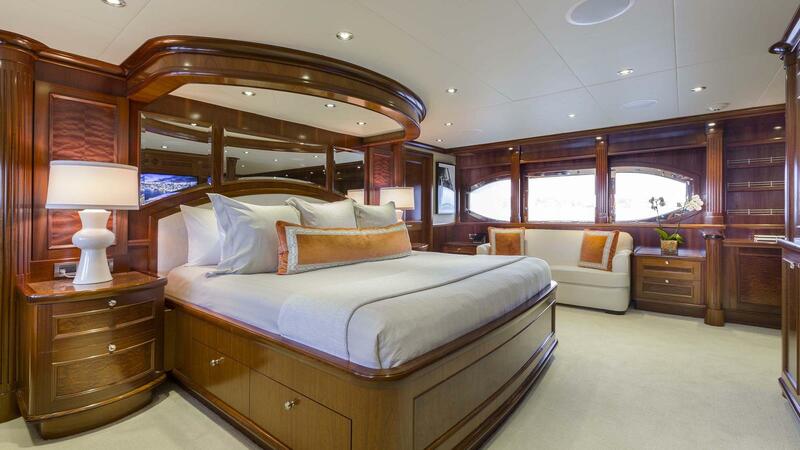 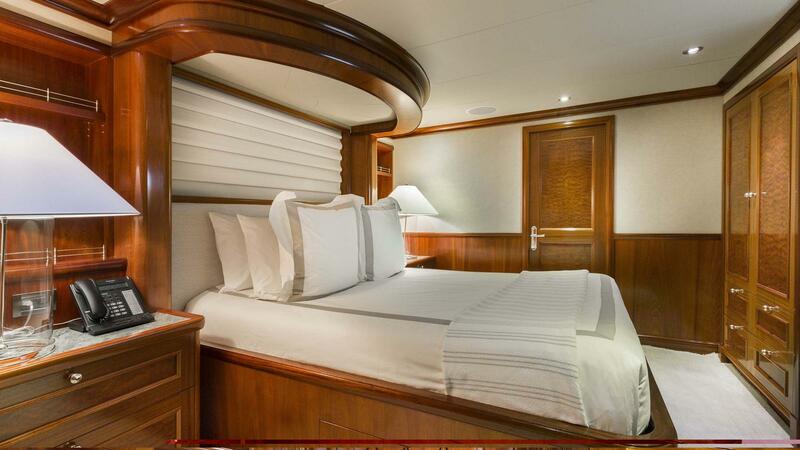 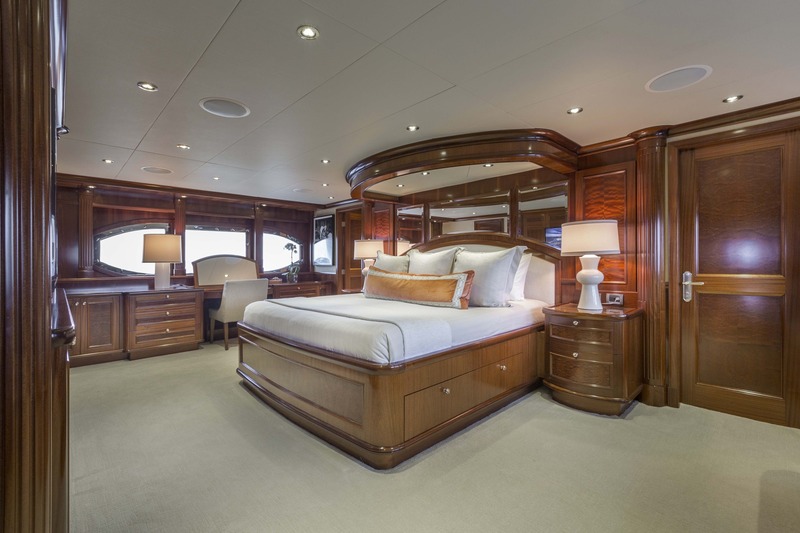 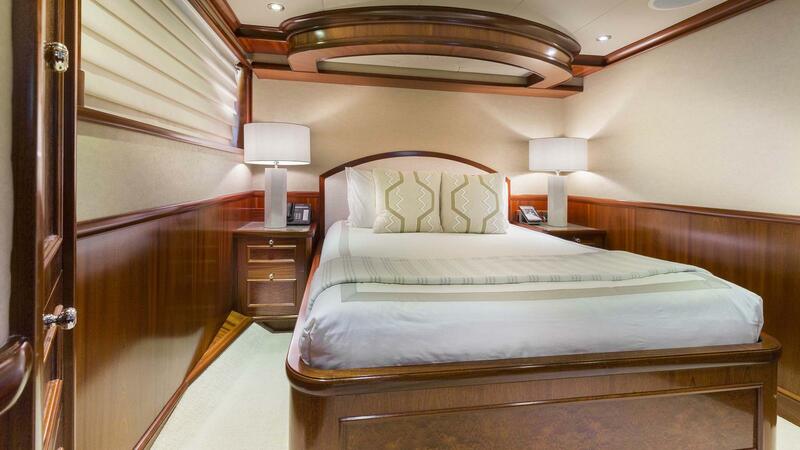 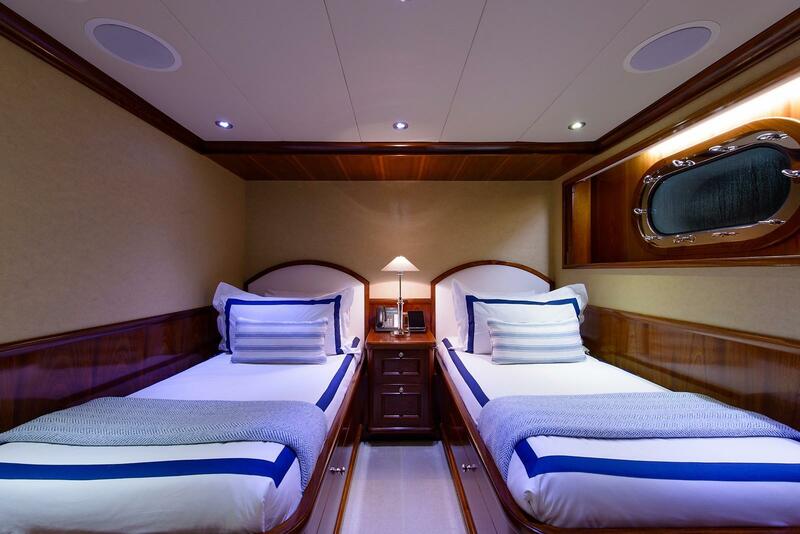 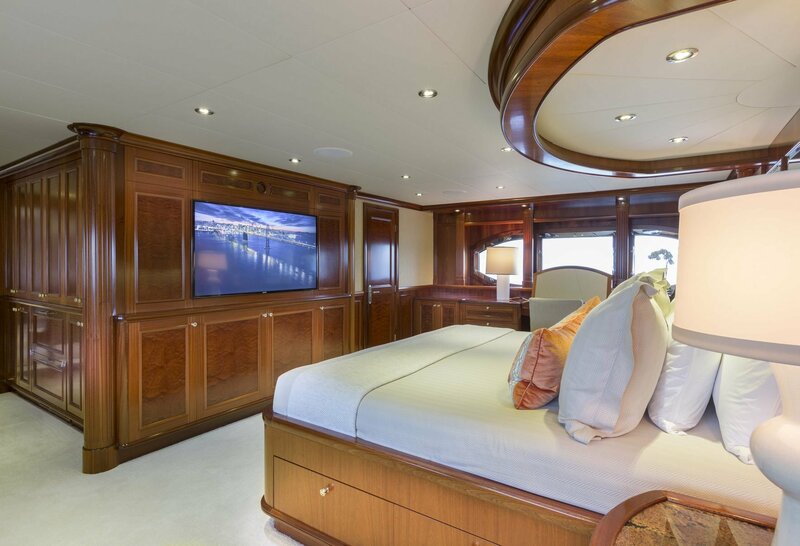 The FAR FROM IT yacht can accommodate up to 10 guests in 5 cabins including a full beam Master suite located on the main deck with King Sized bed. 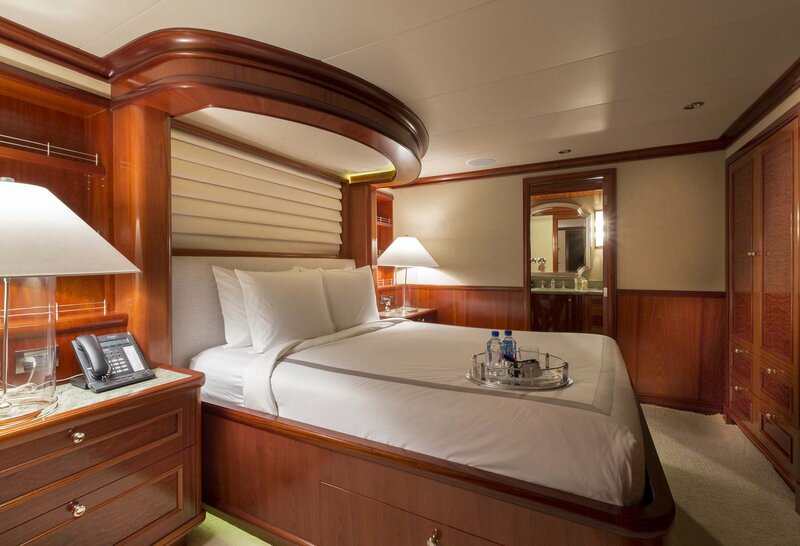 Plus 4 Guest rooms lower deck, comprised of 3 queens sized cabins. 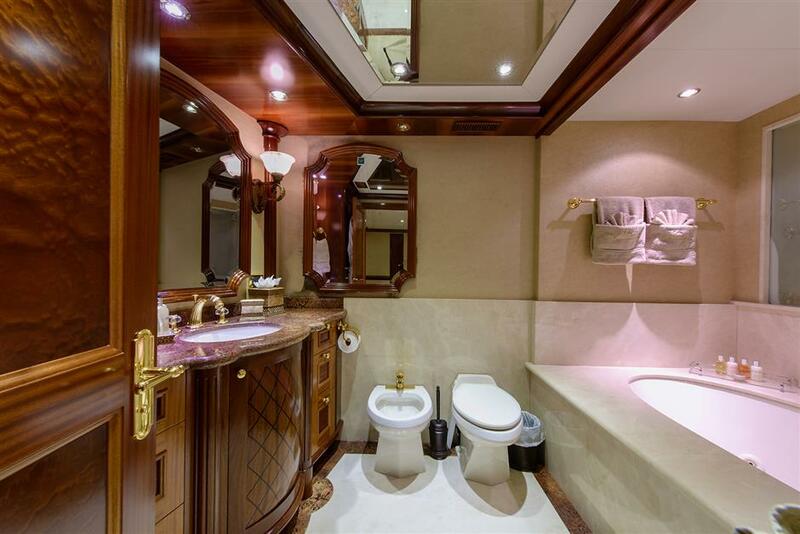 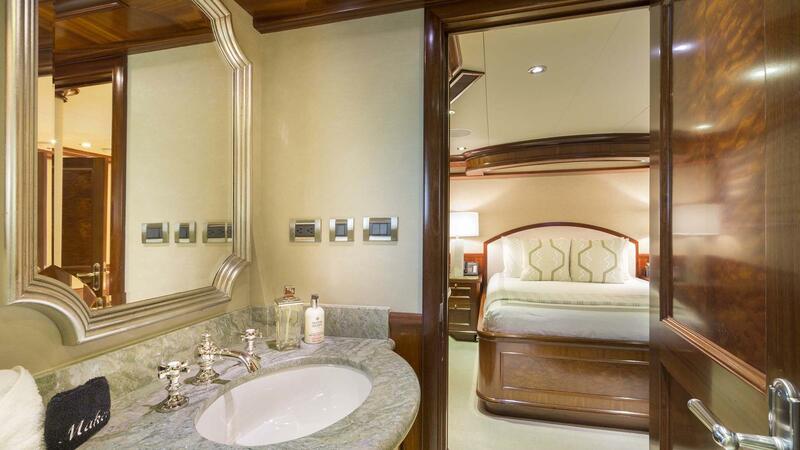 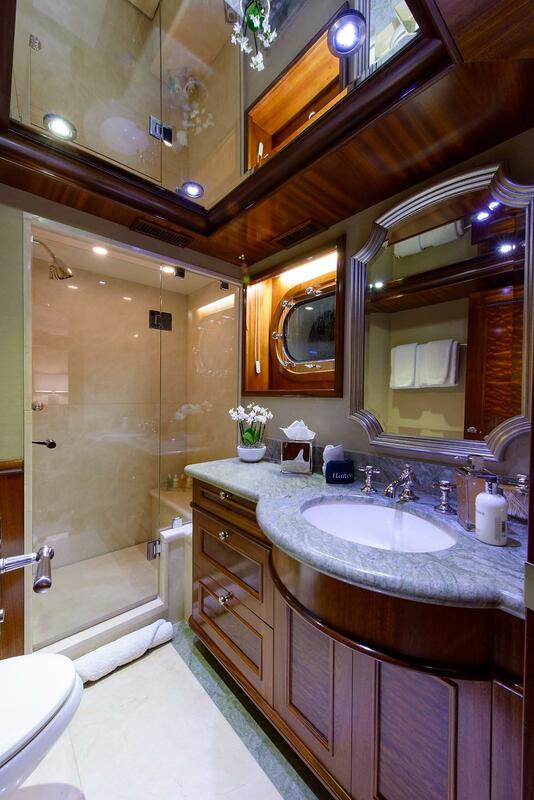 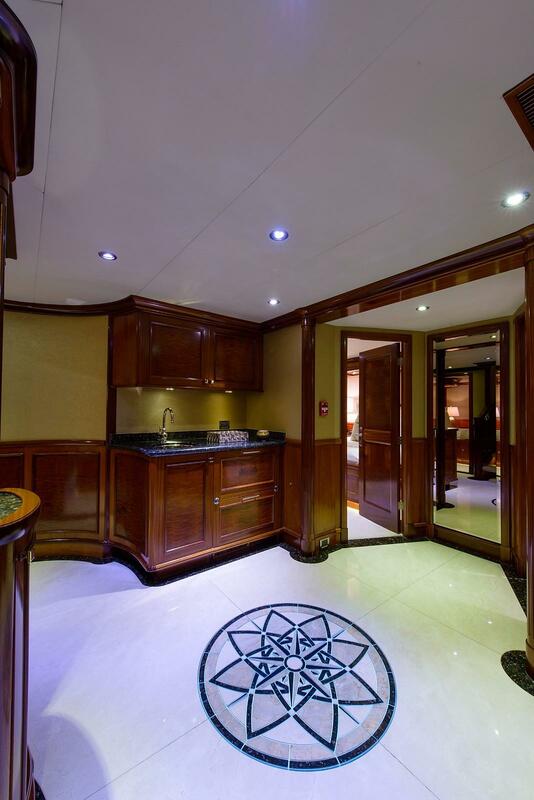 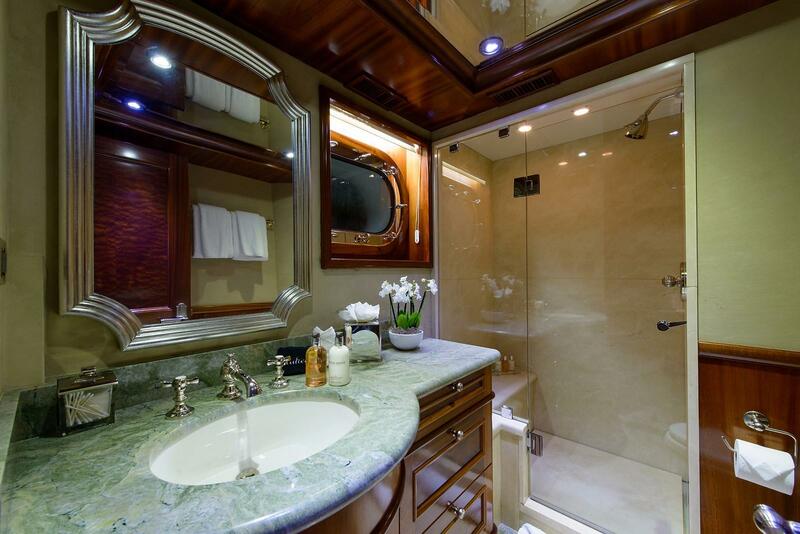 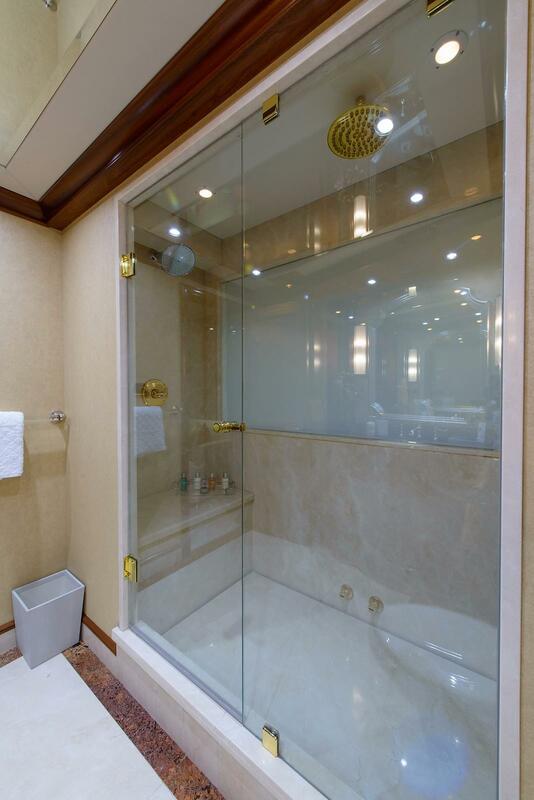 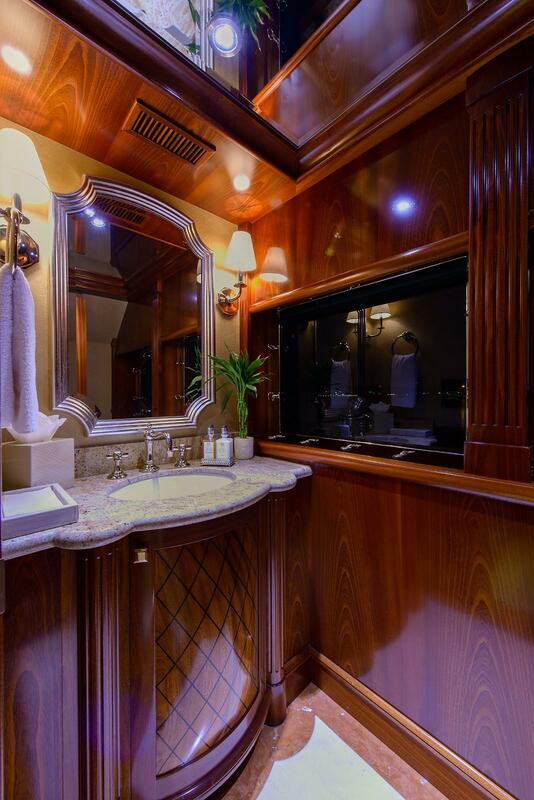 Two of which are a mirror image and offer a shower room and bathroom ensuite, one queen cabin has a shower room. 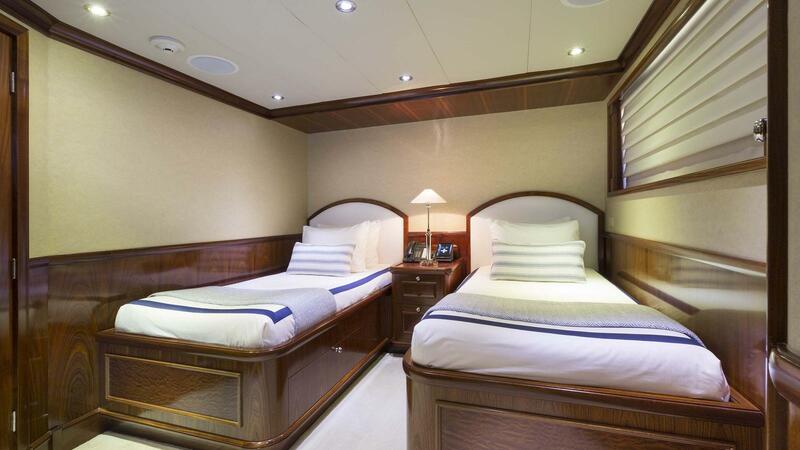 The twin cabin has single beds and a shower room ensuite. 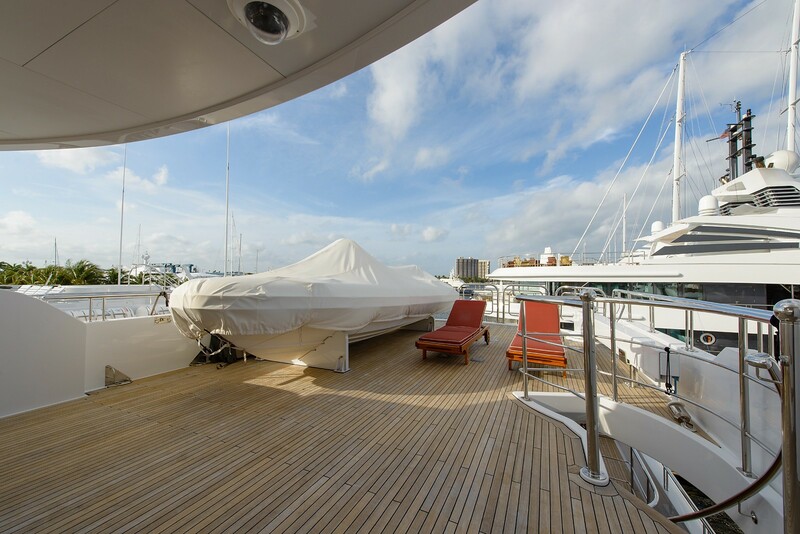 The exterior living is well-appointed over three generous decks. 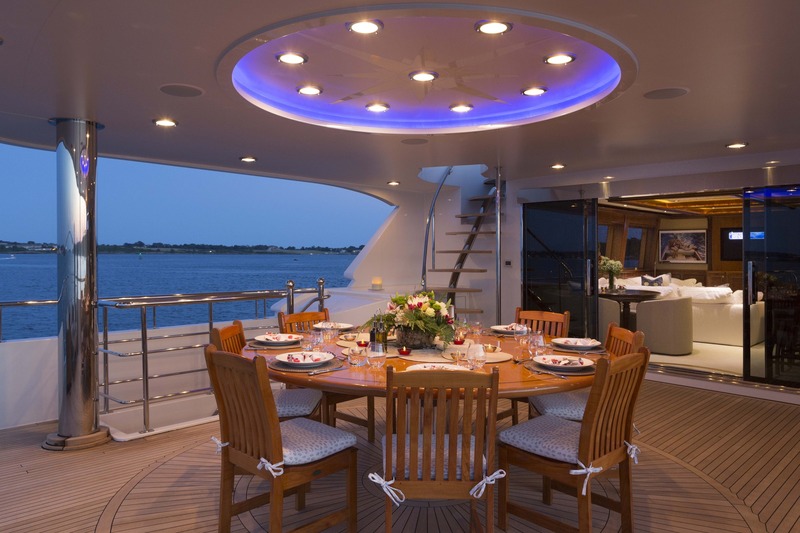 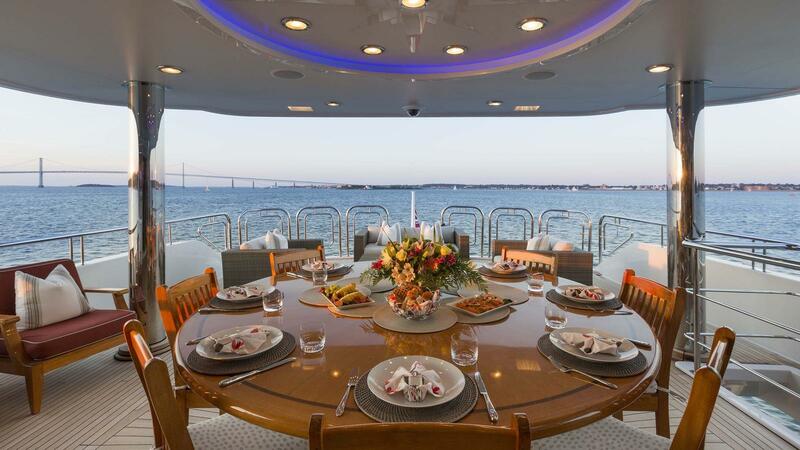 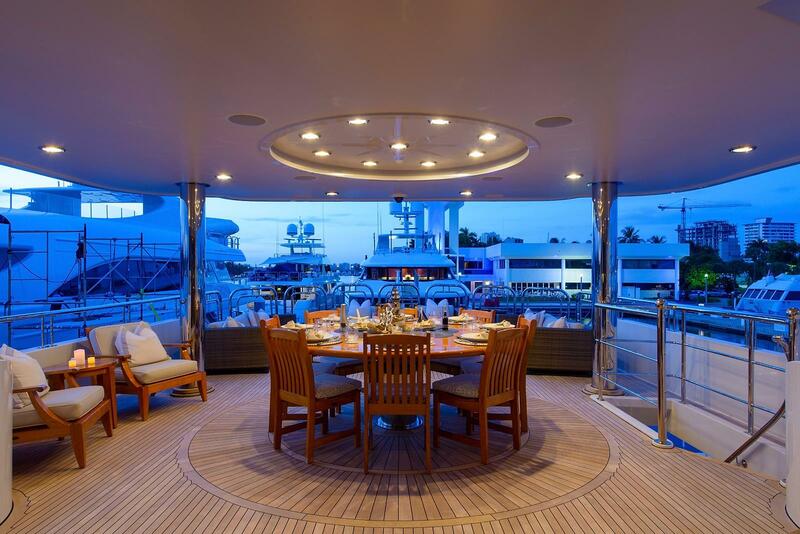 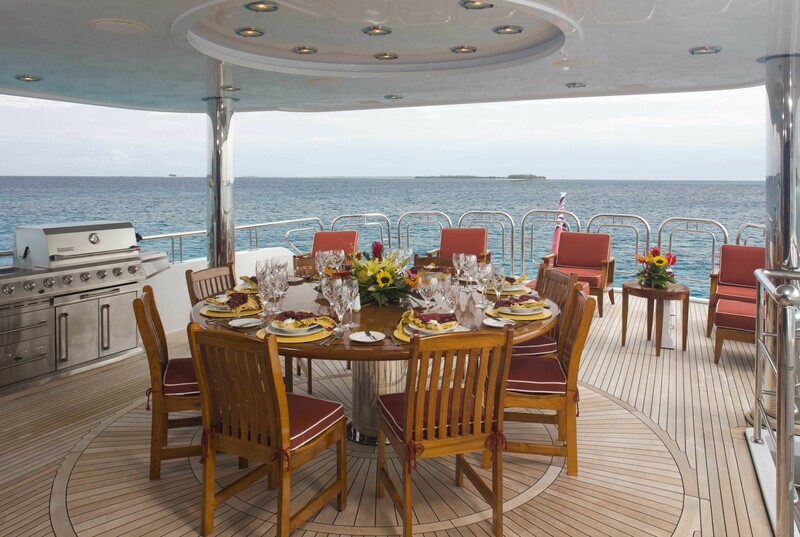 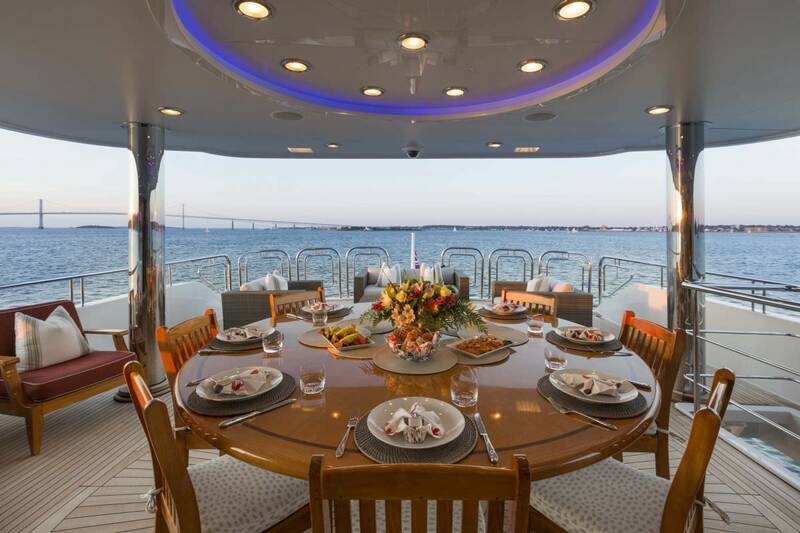 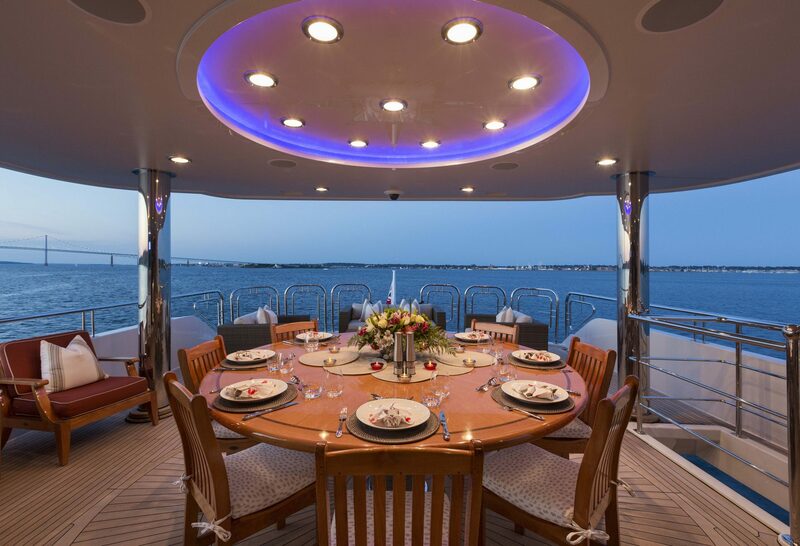 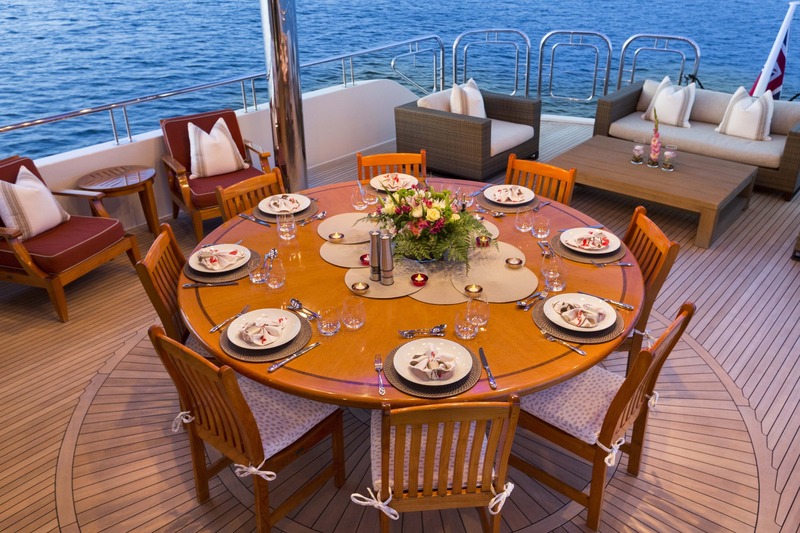 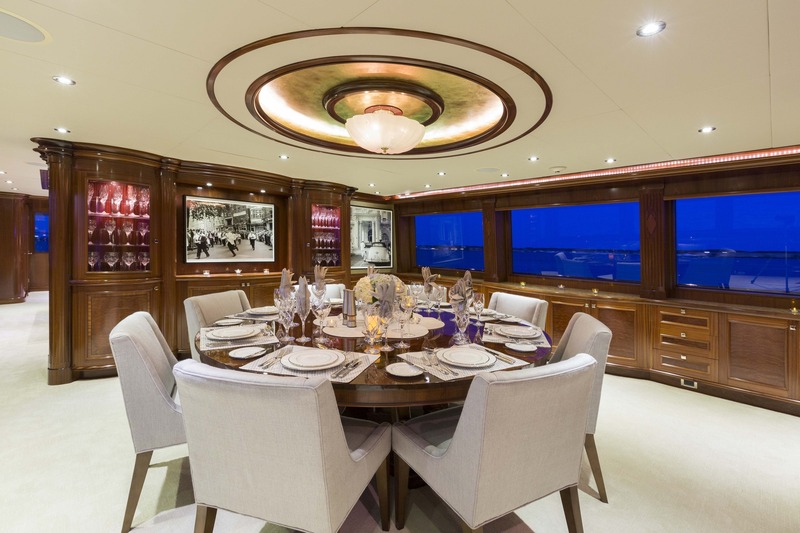 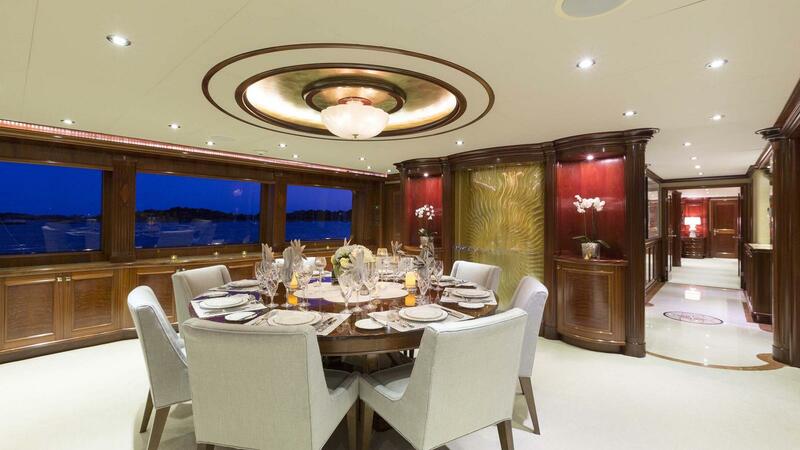 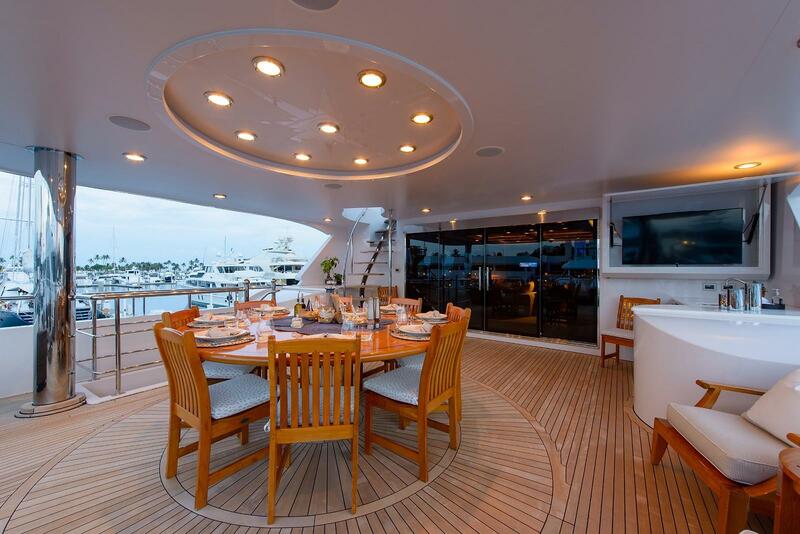 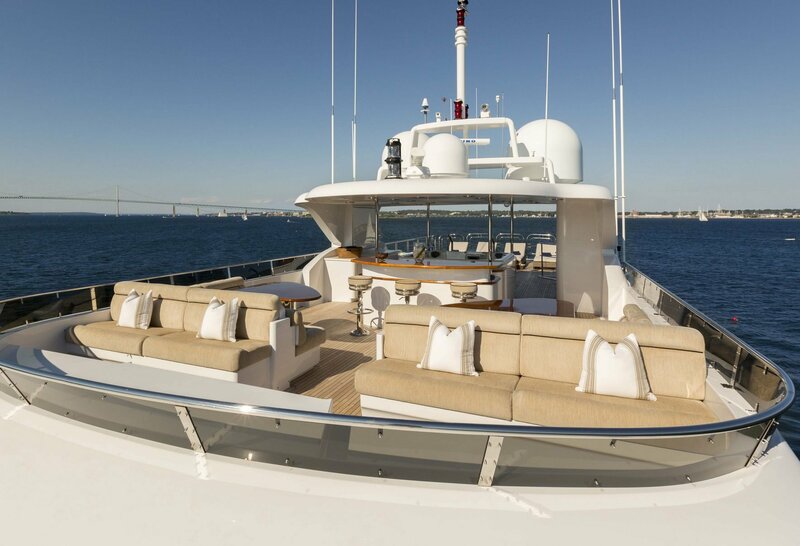 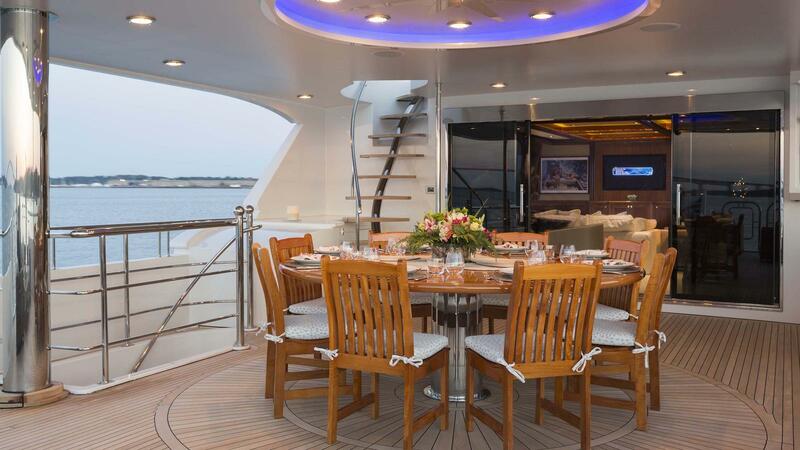 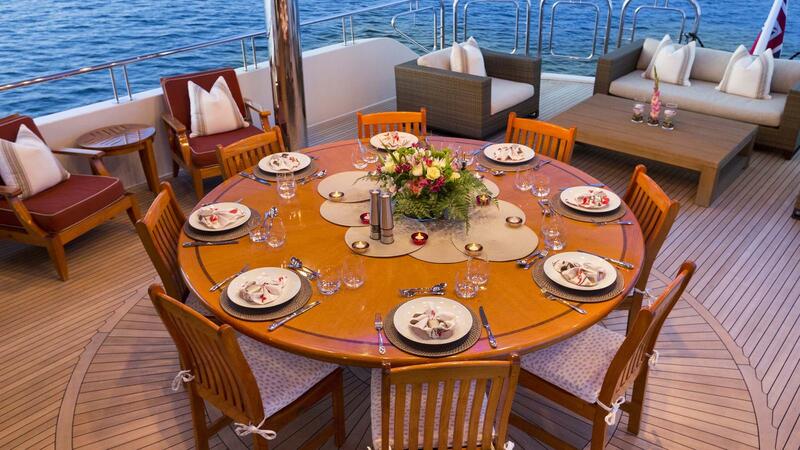 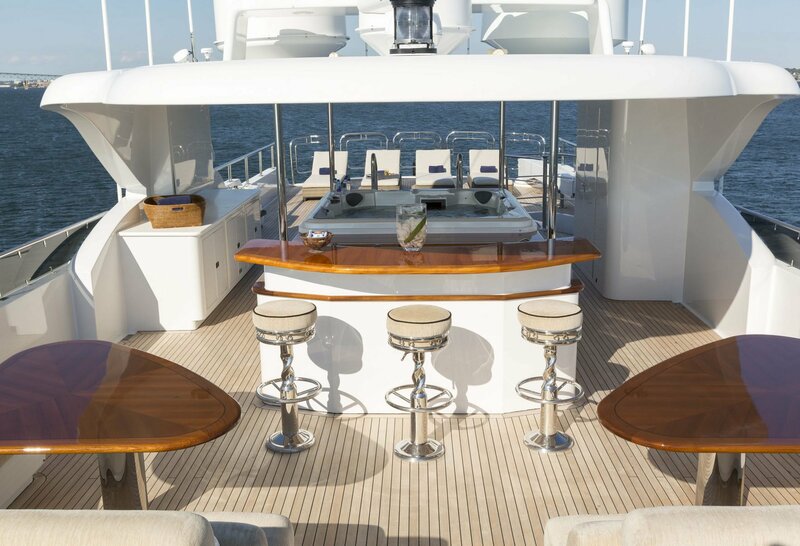 The main aft deck offers ample seating and convertible cocktail to the alfresco dining table, perfect for any occasion. 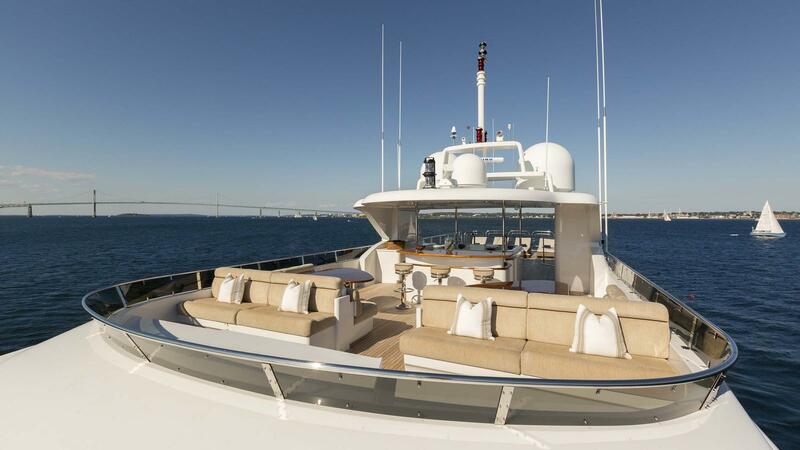 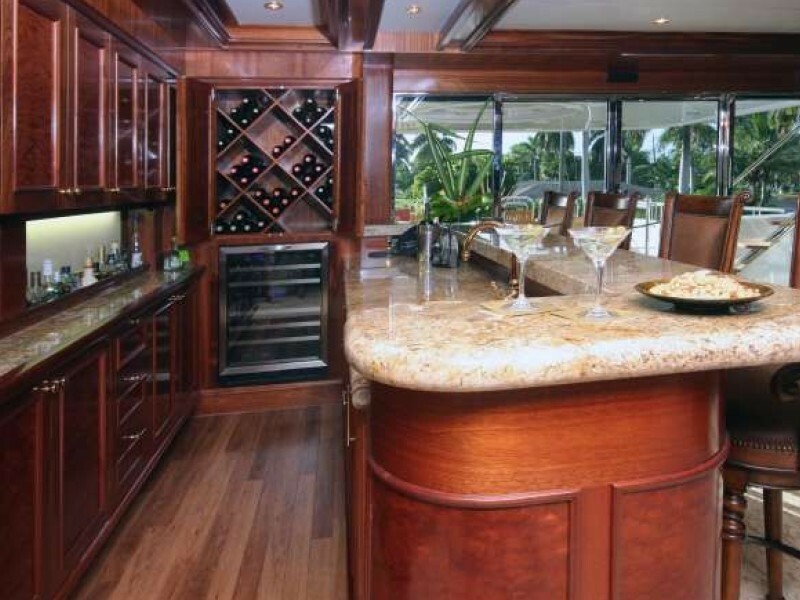 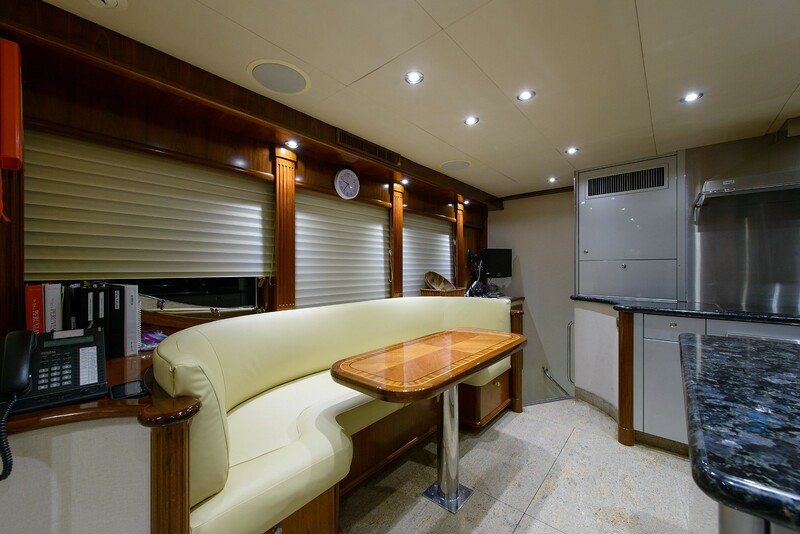 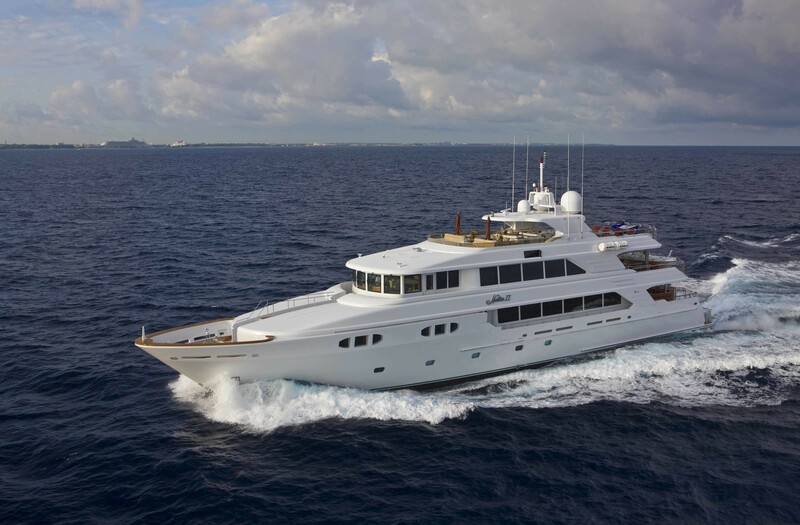 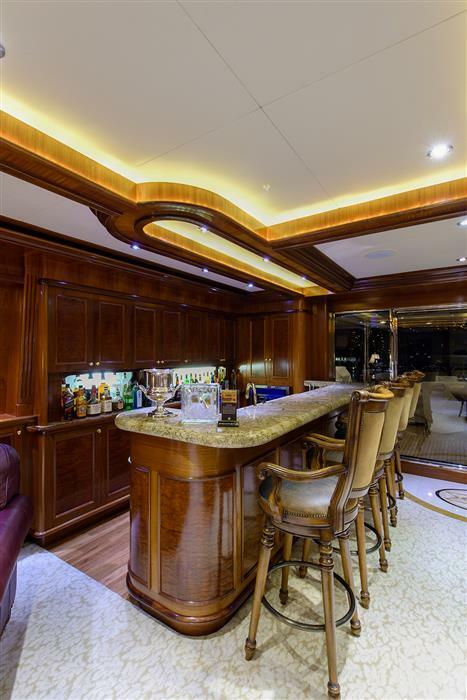 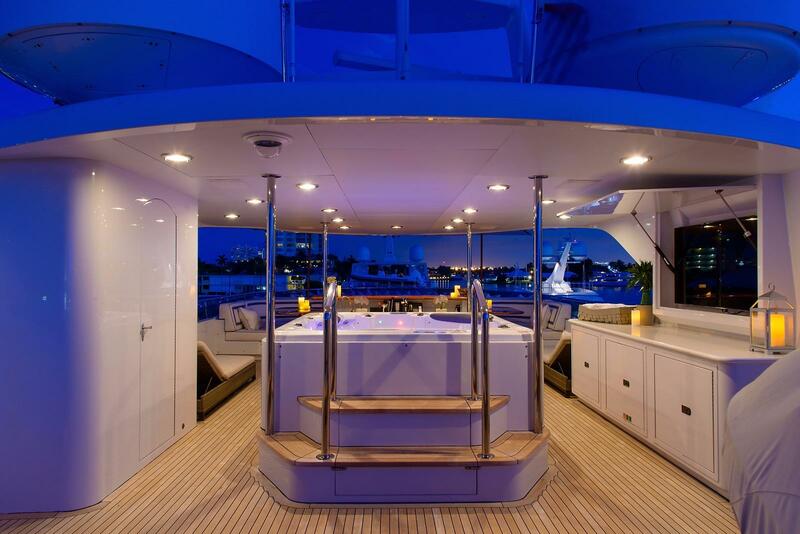 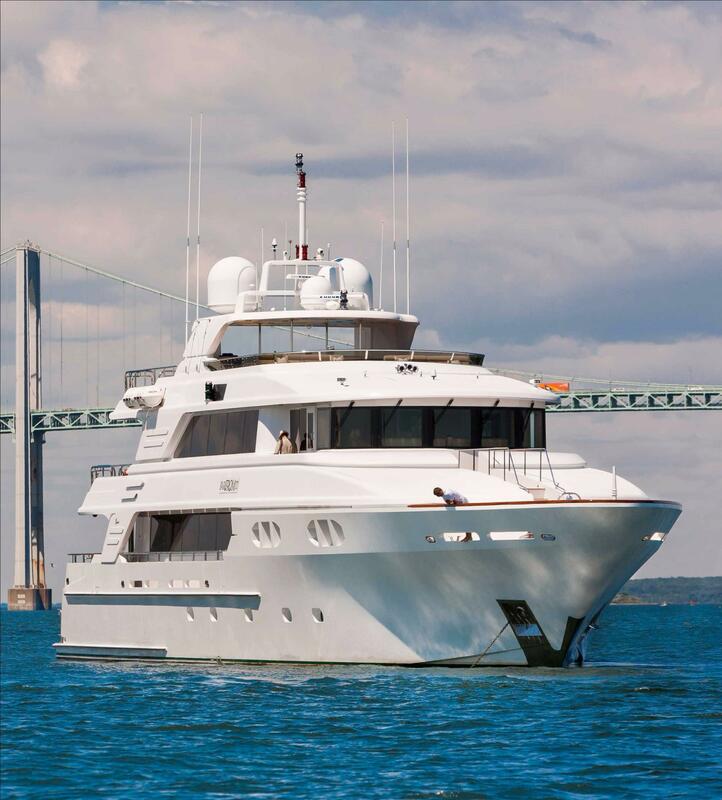 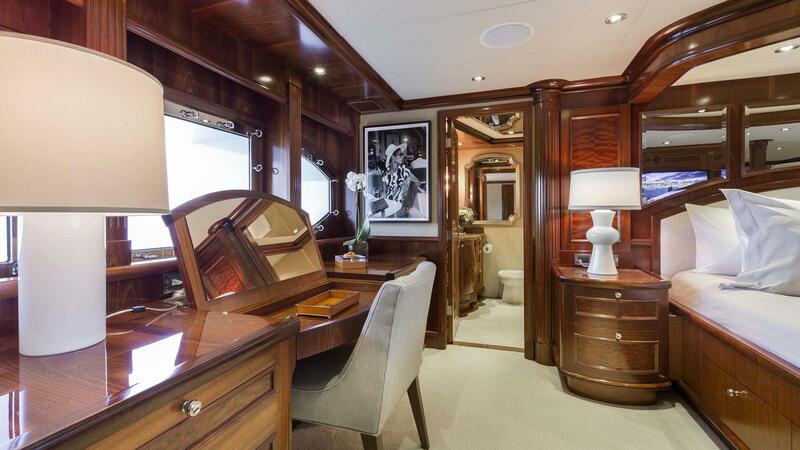 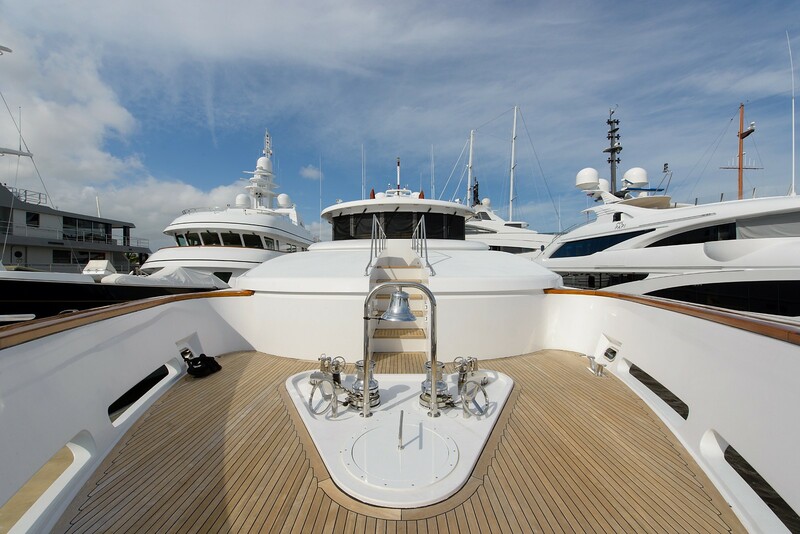 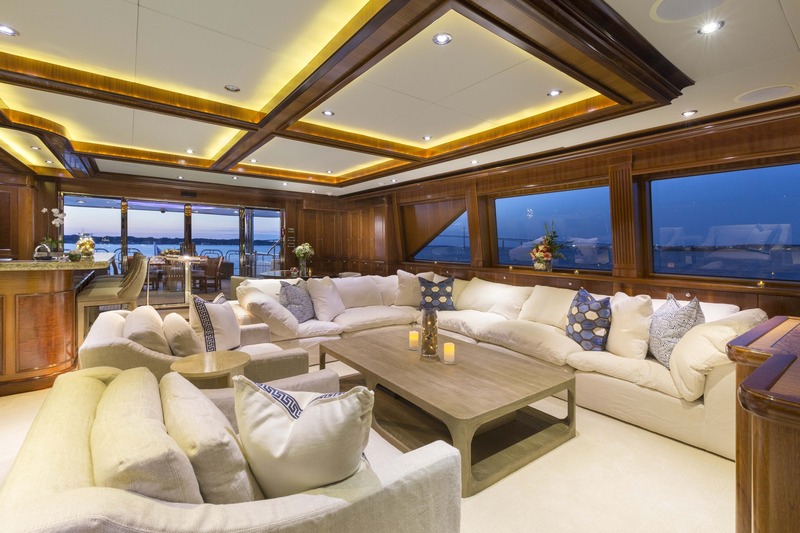 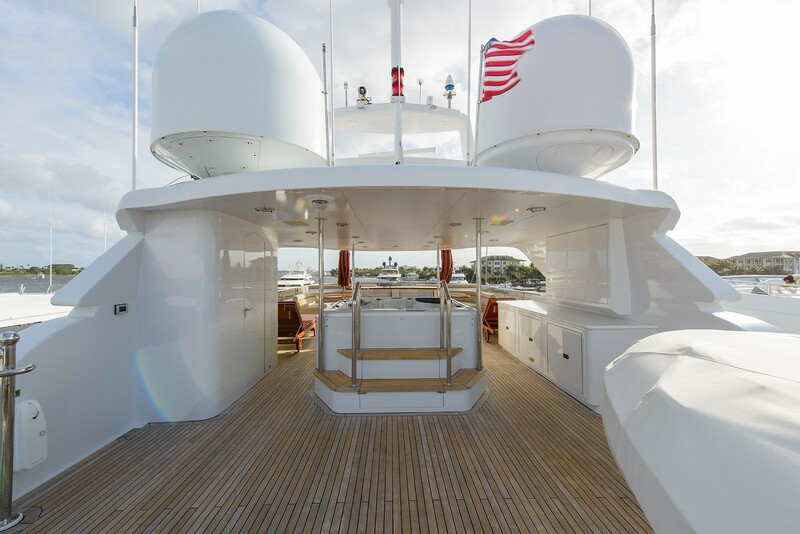 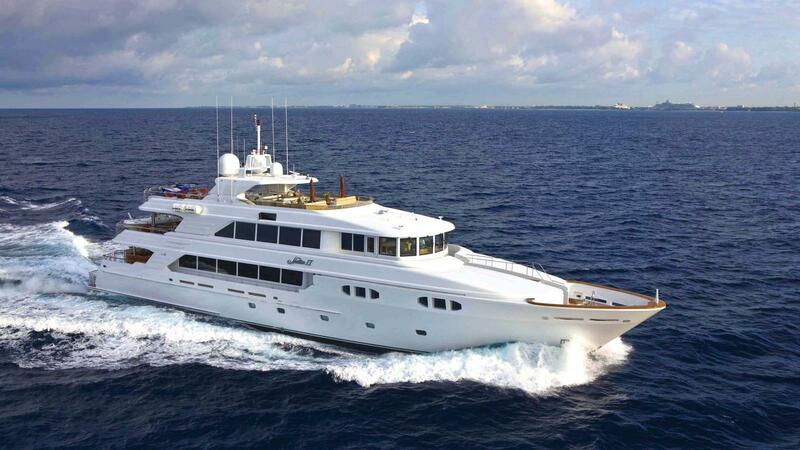 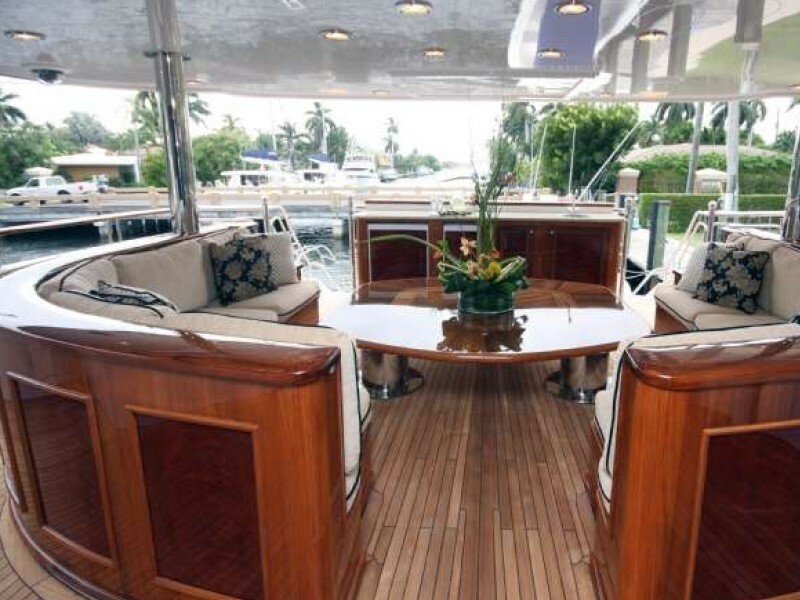 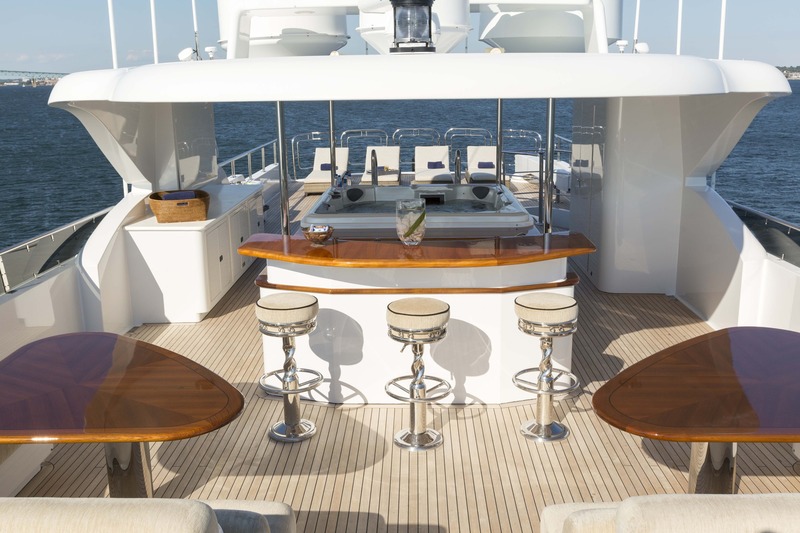 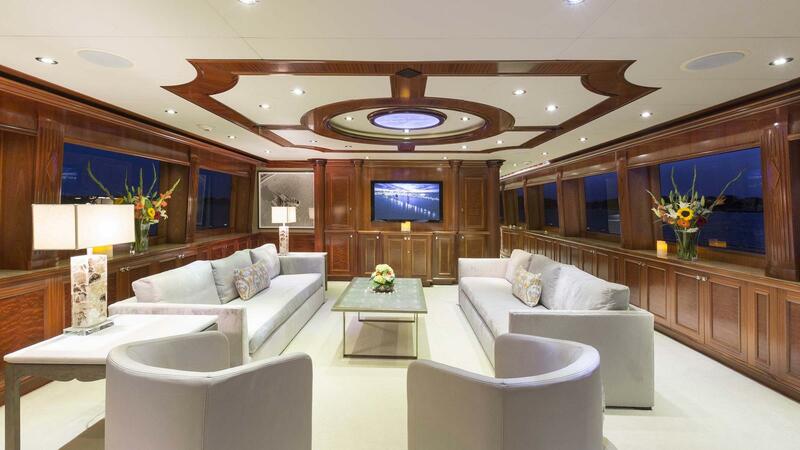 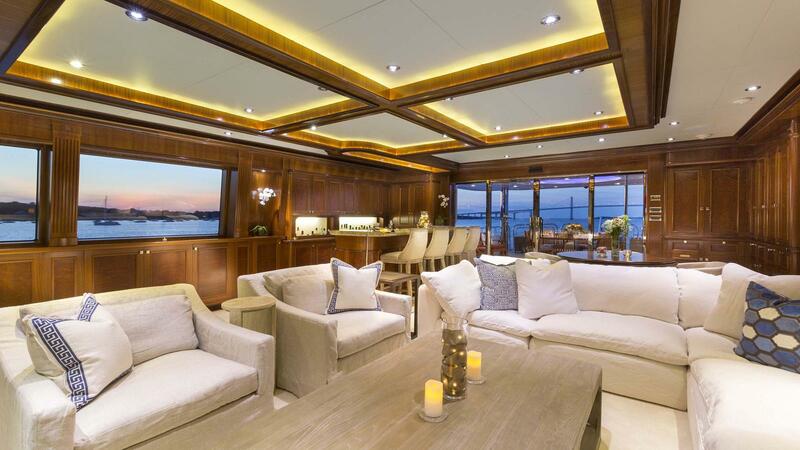 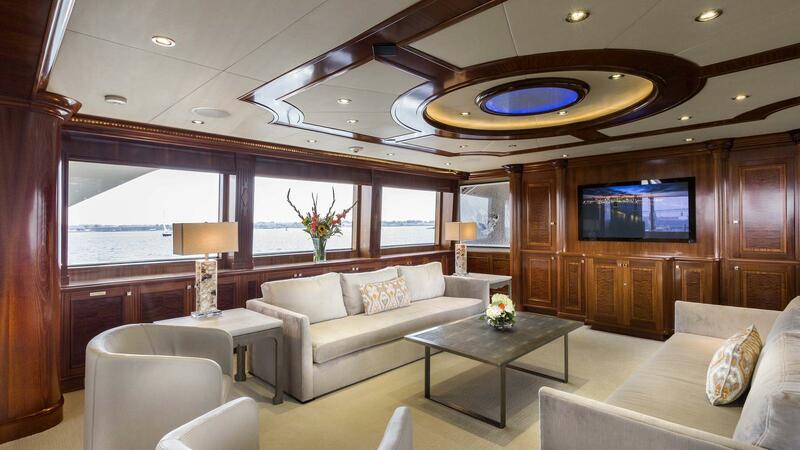 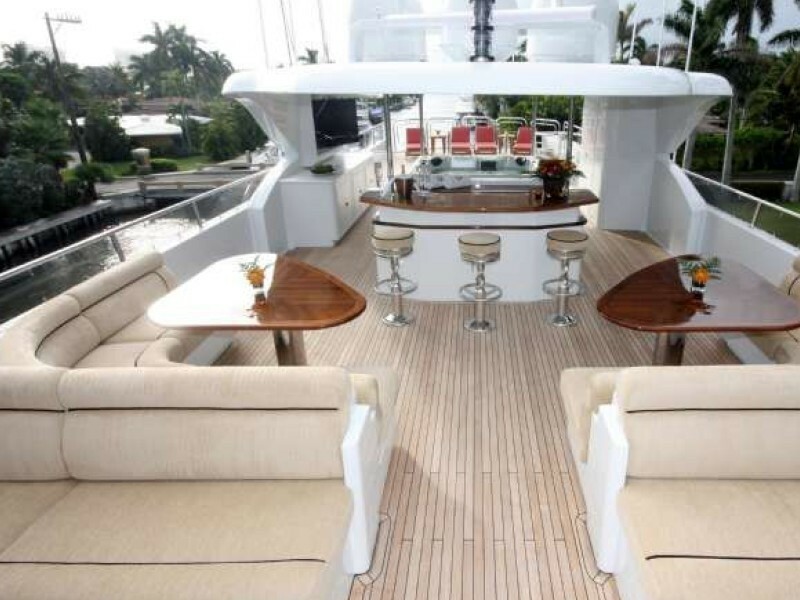 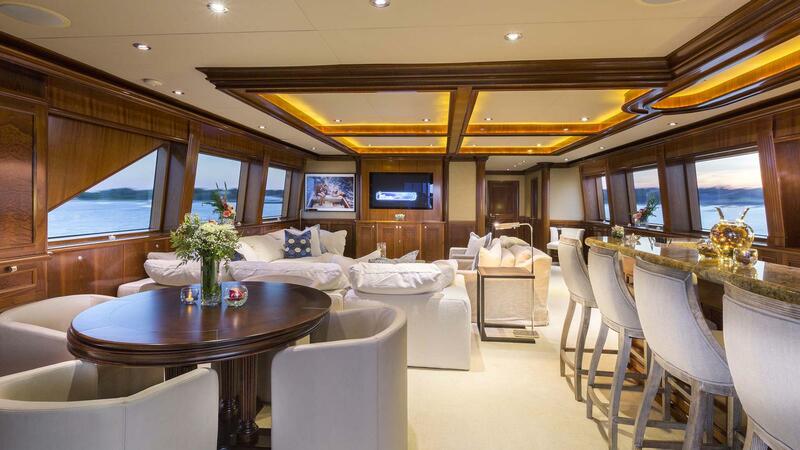 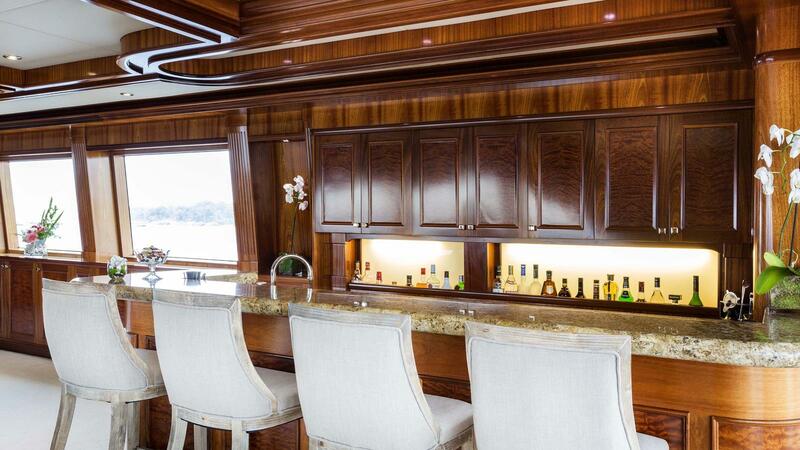 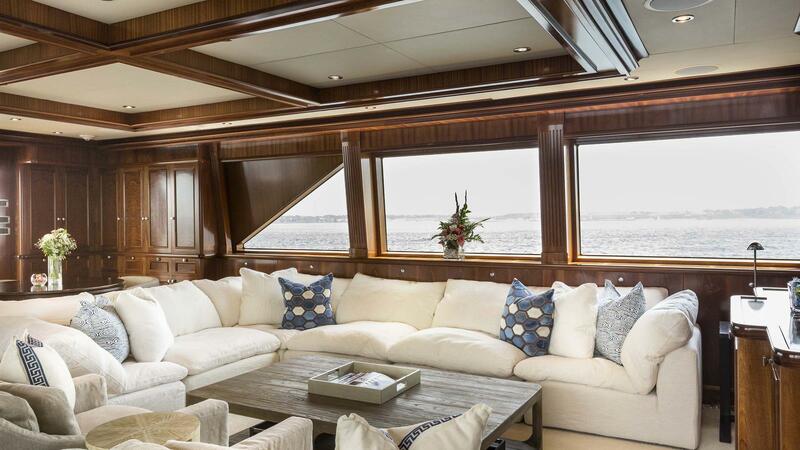 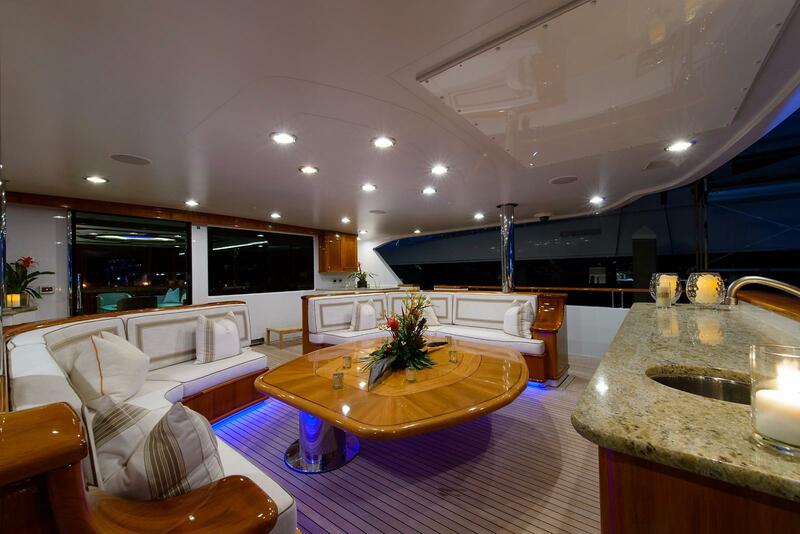 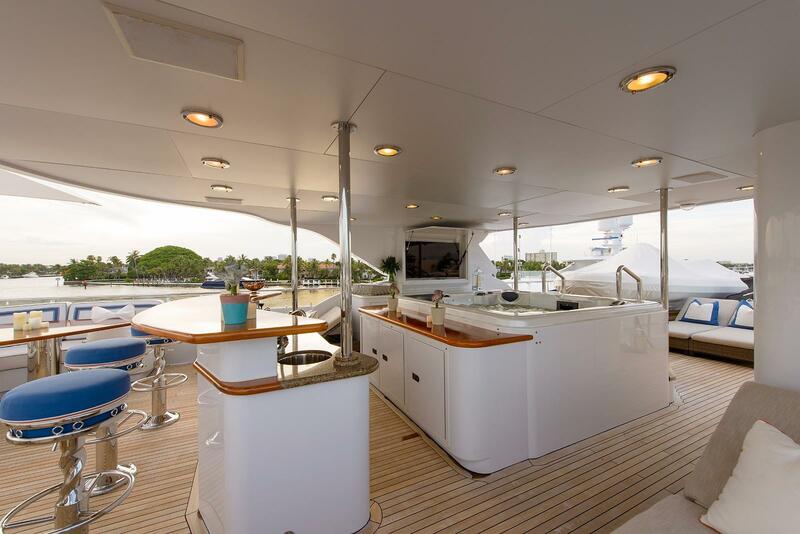 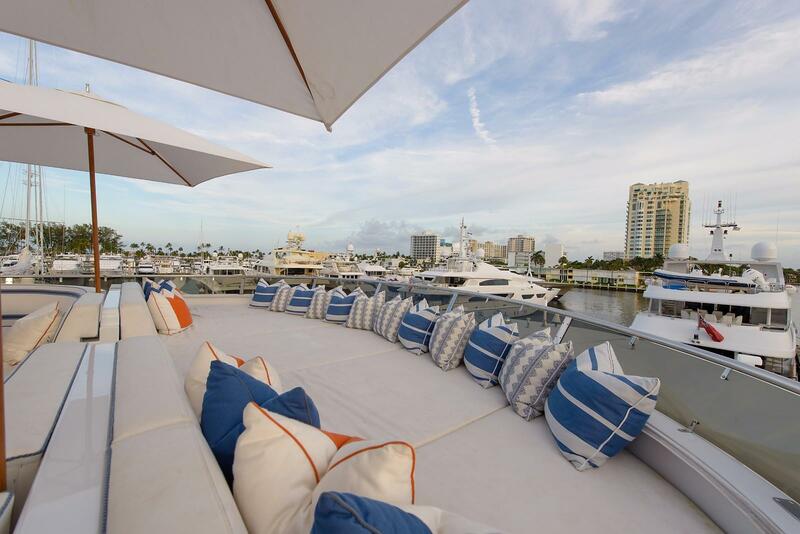 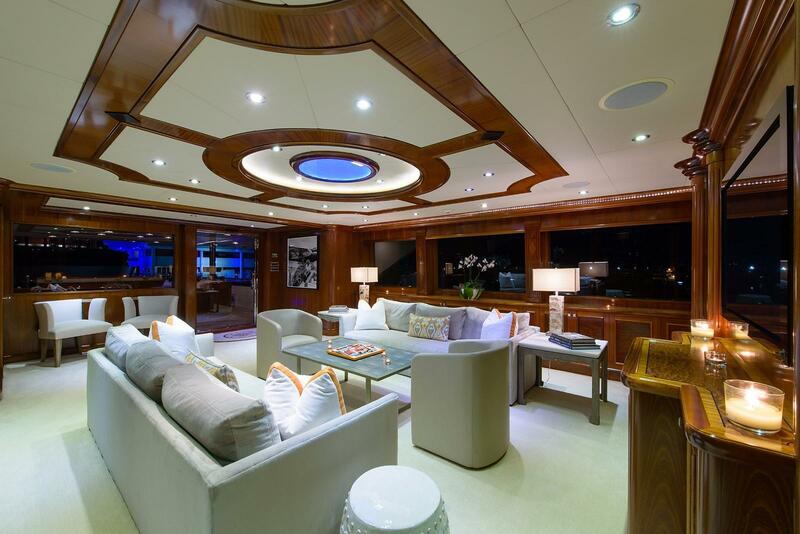 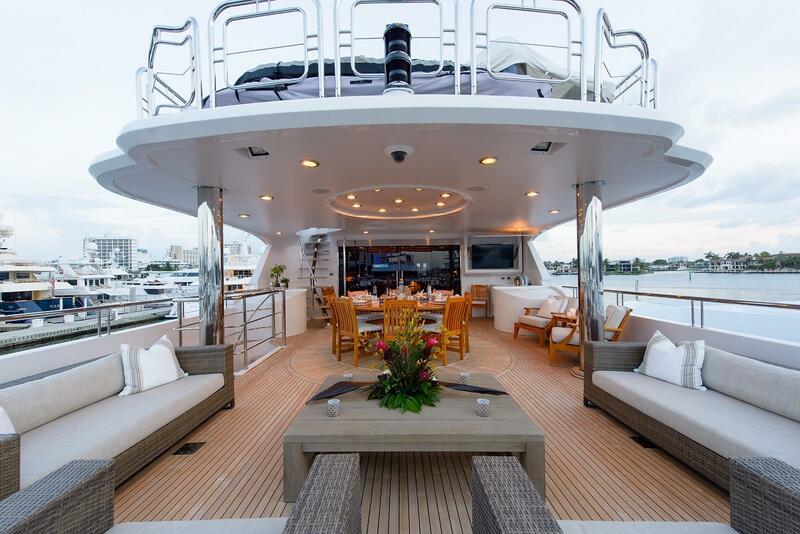 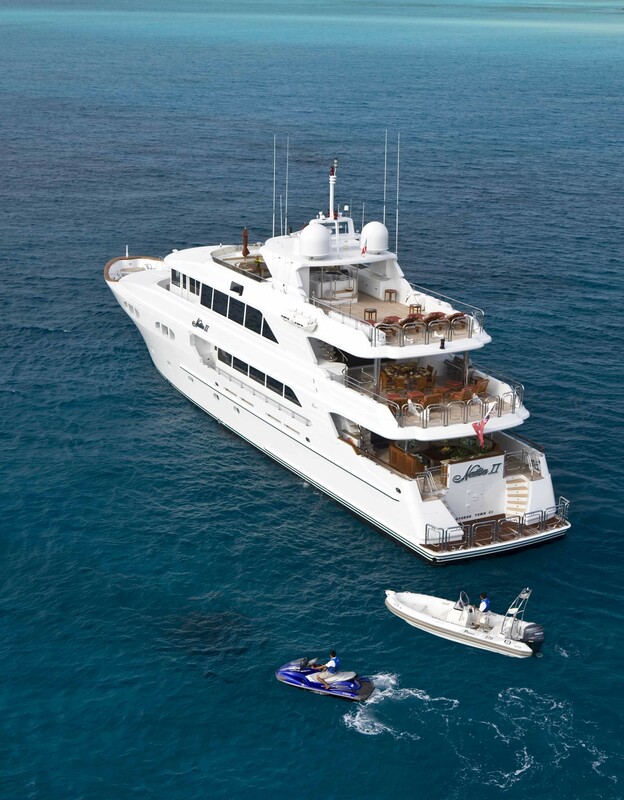 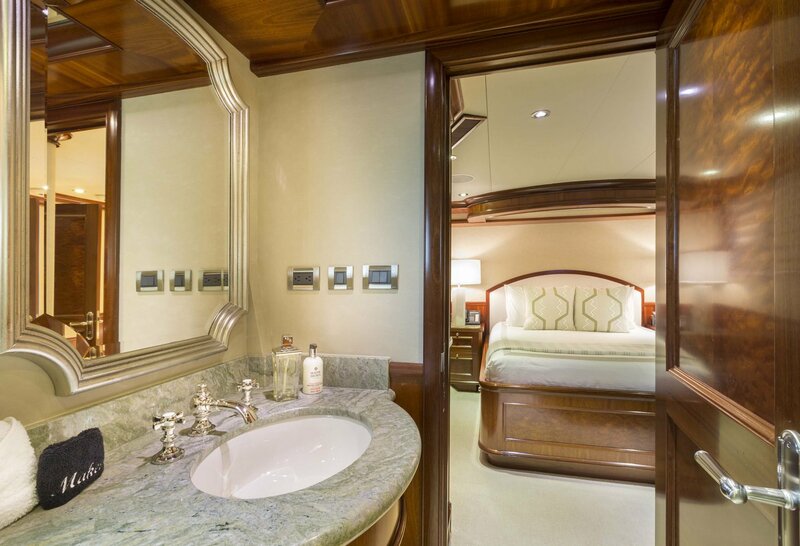 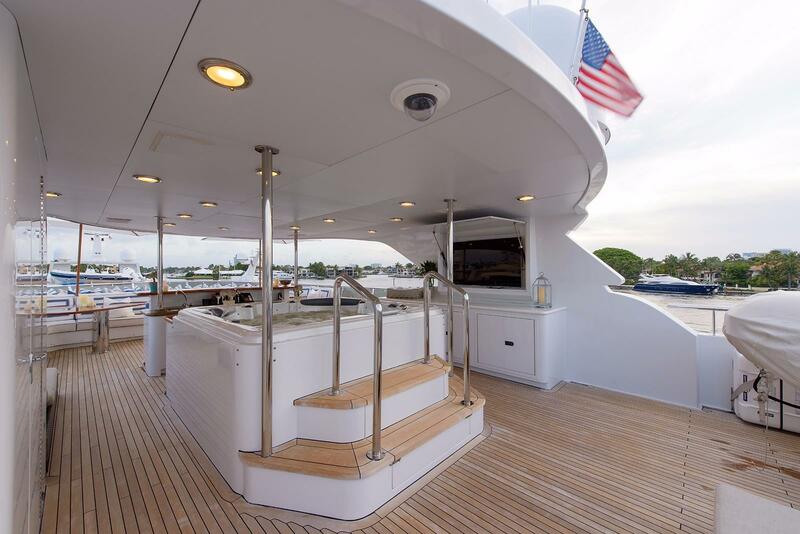 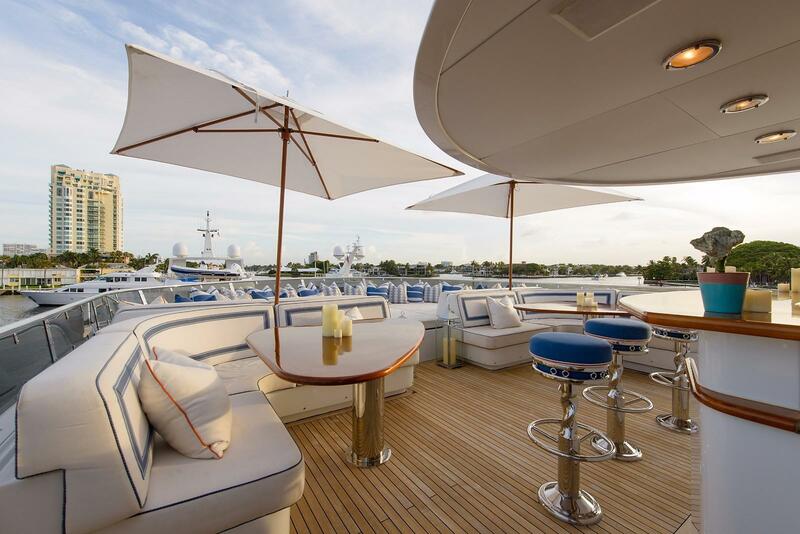 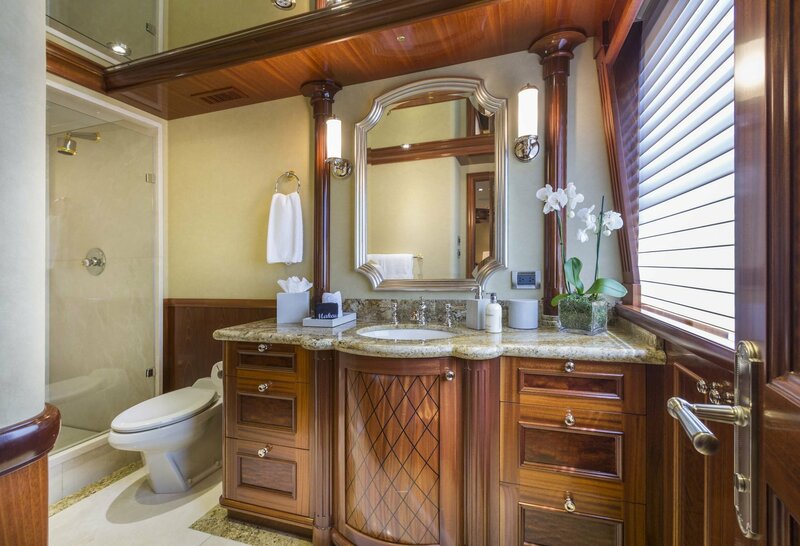 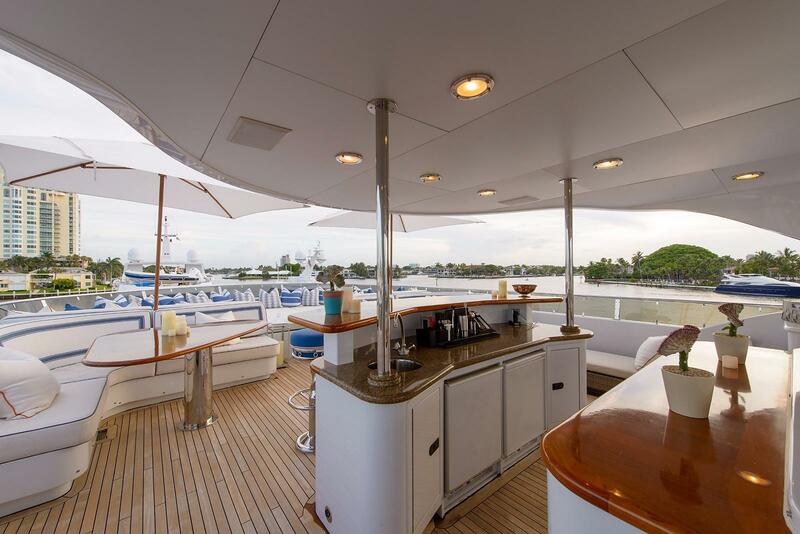 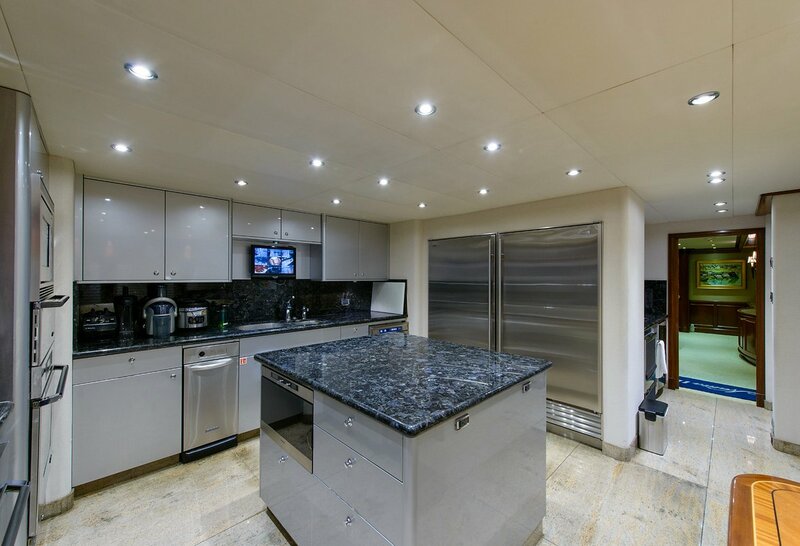 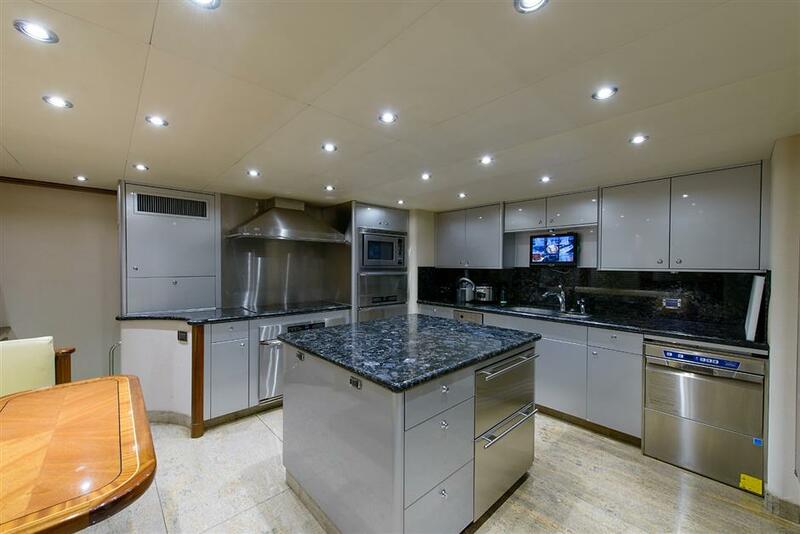 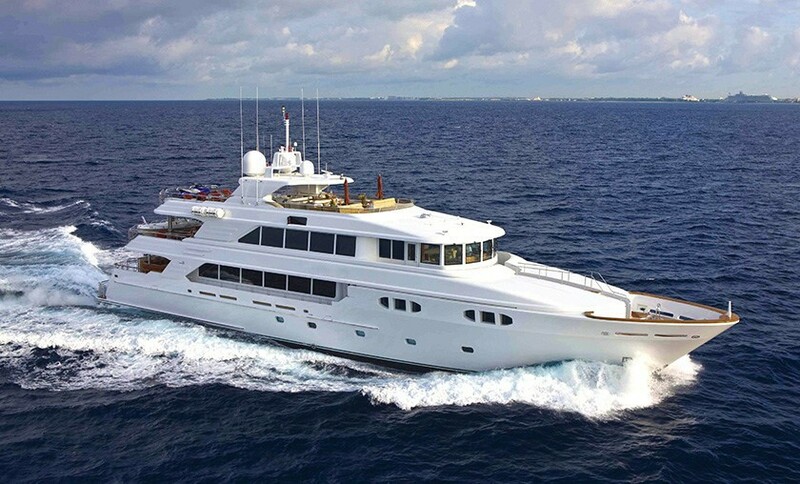 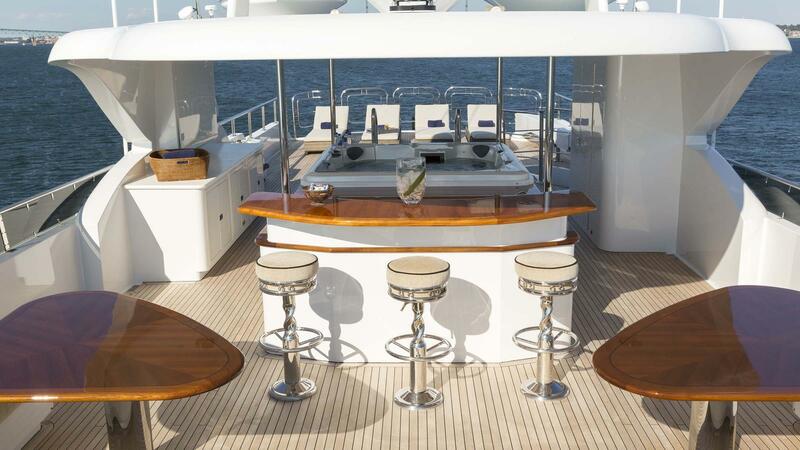 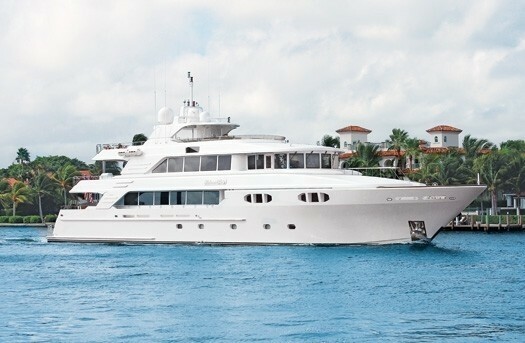 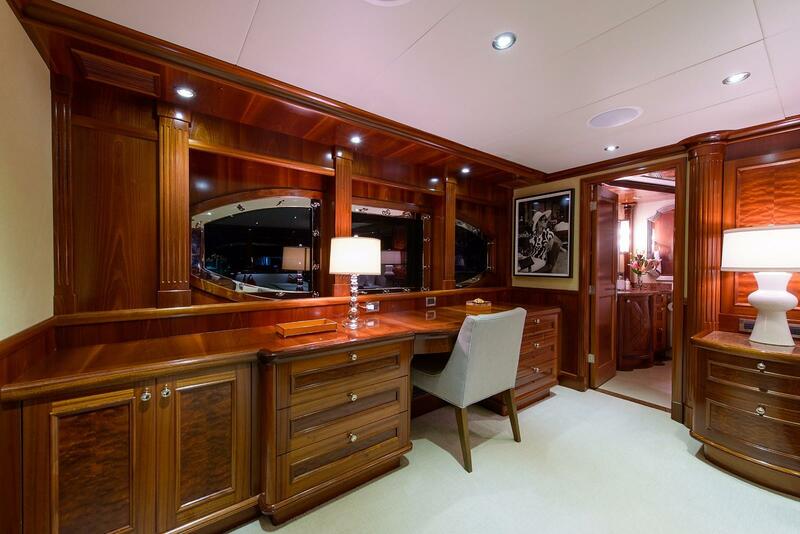 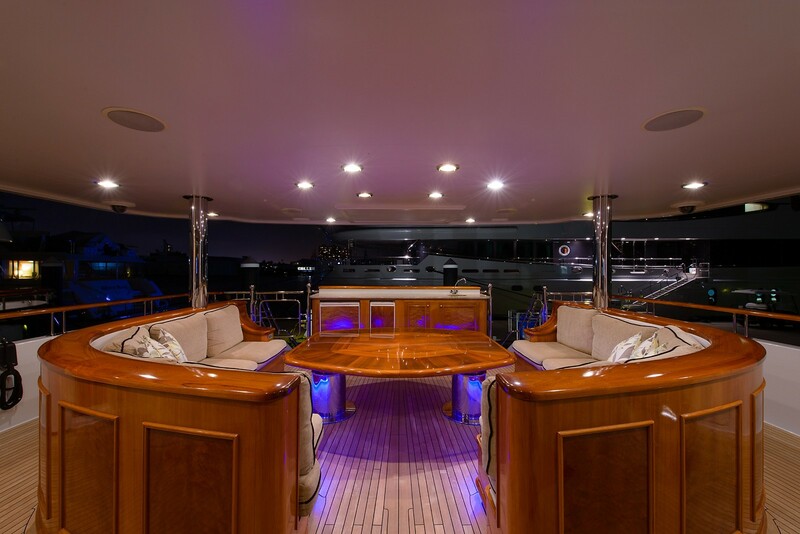 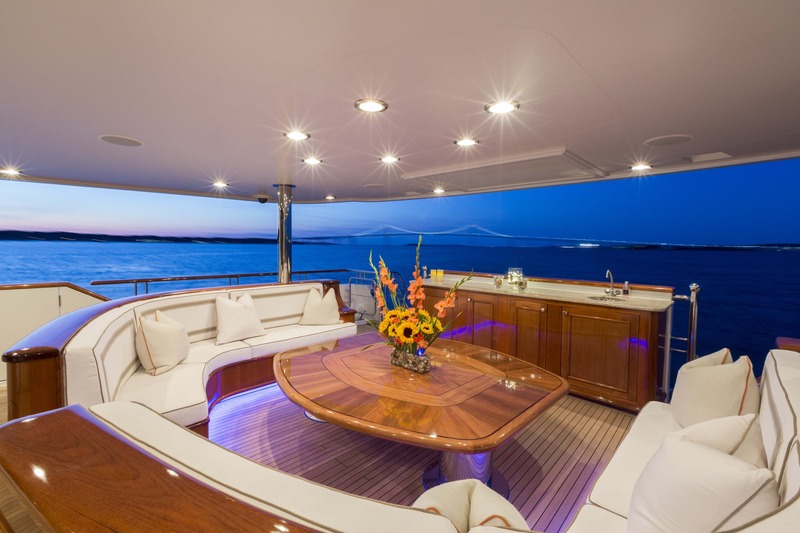 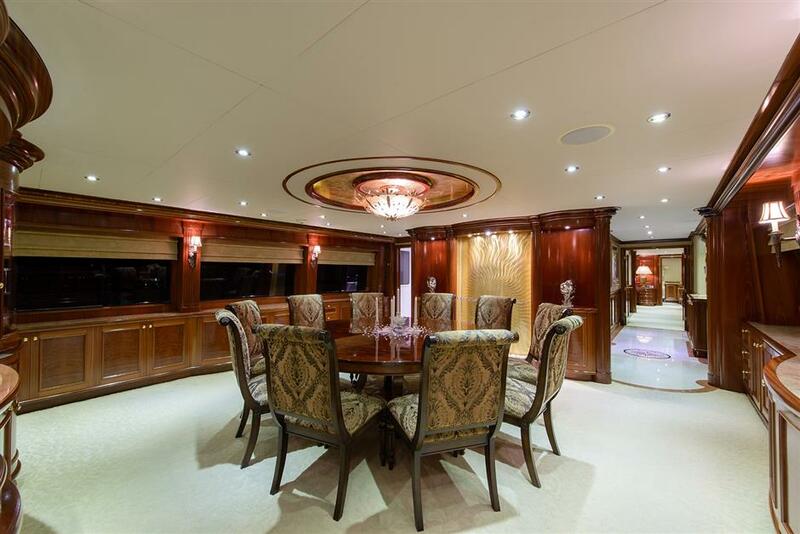 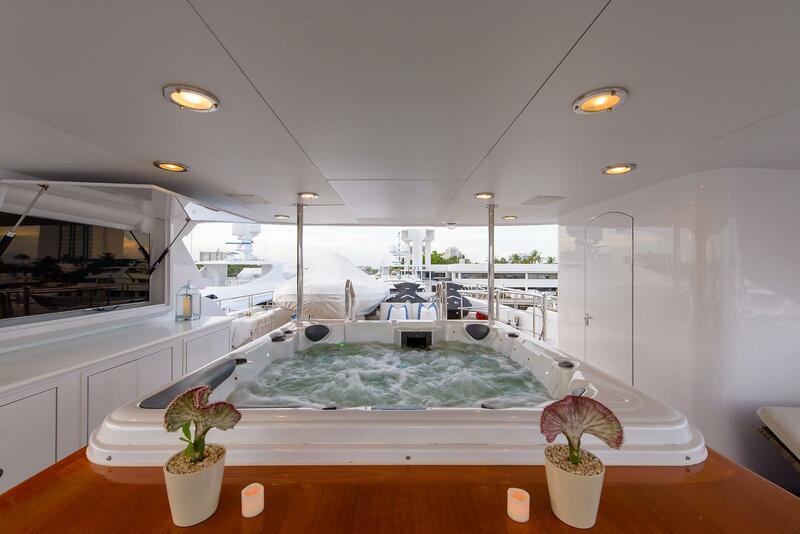 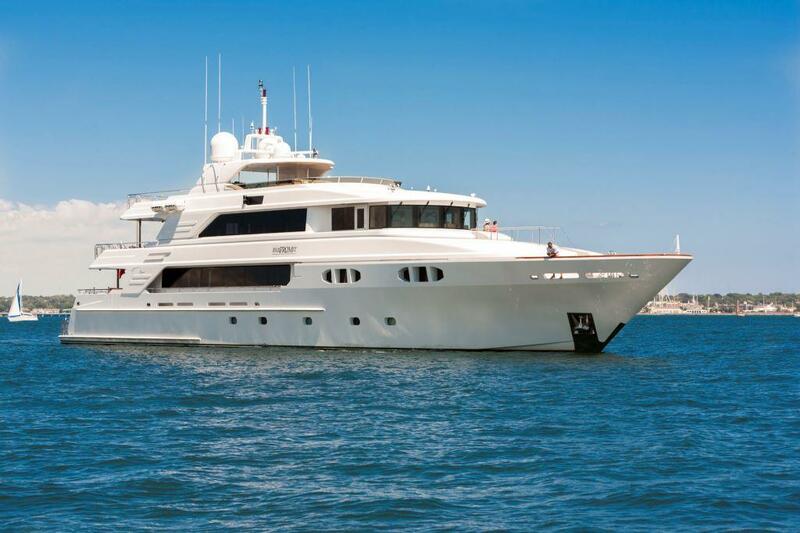 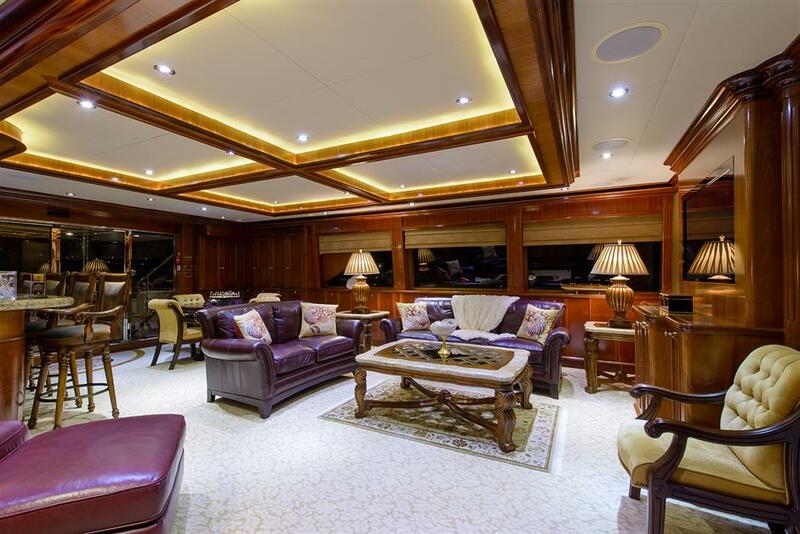 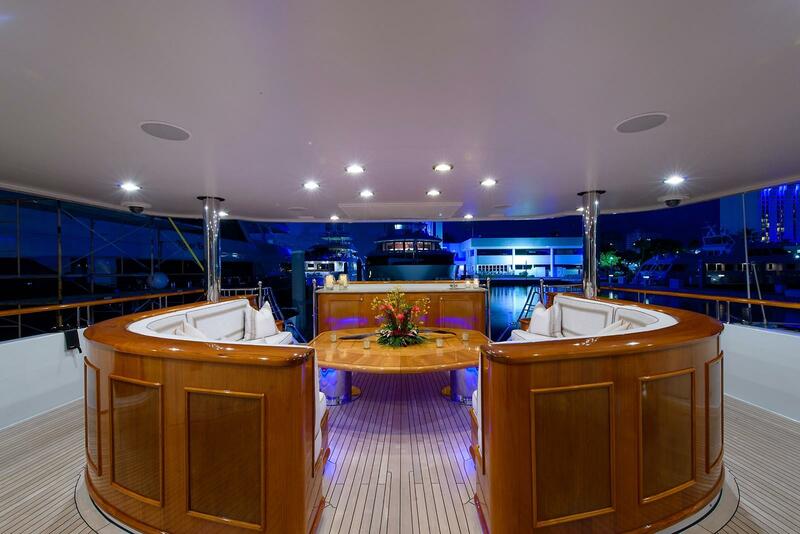 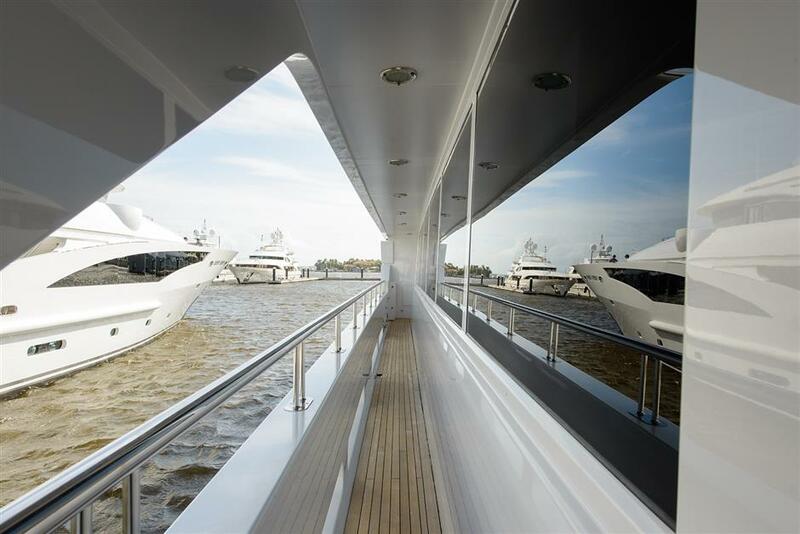 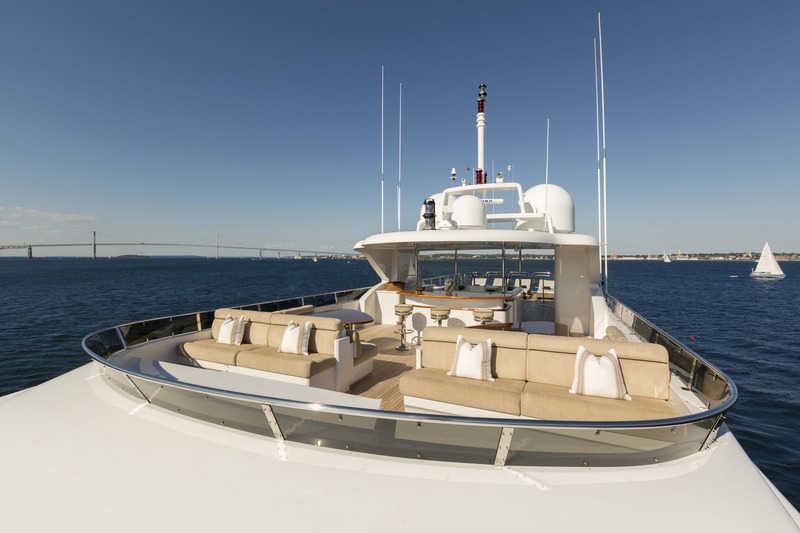 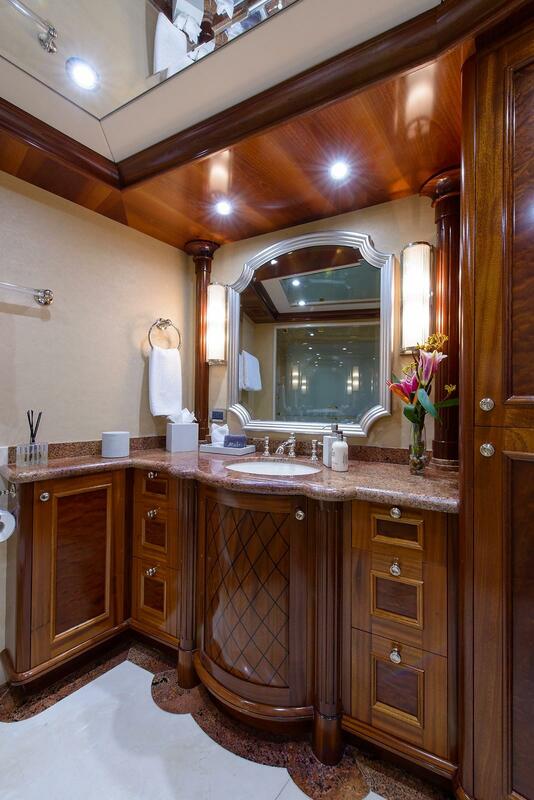 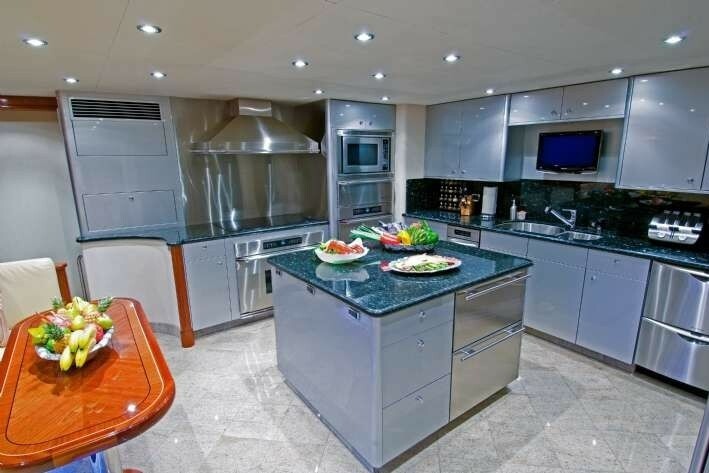 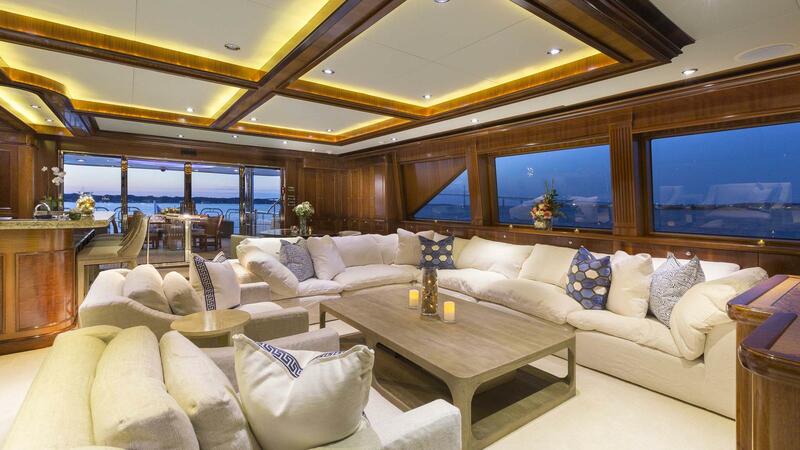 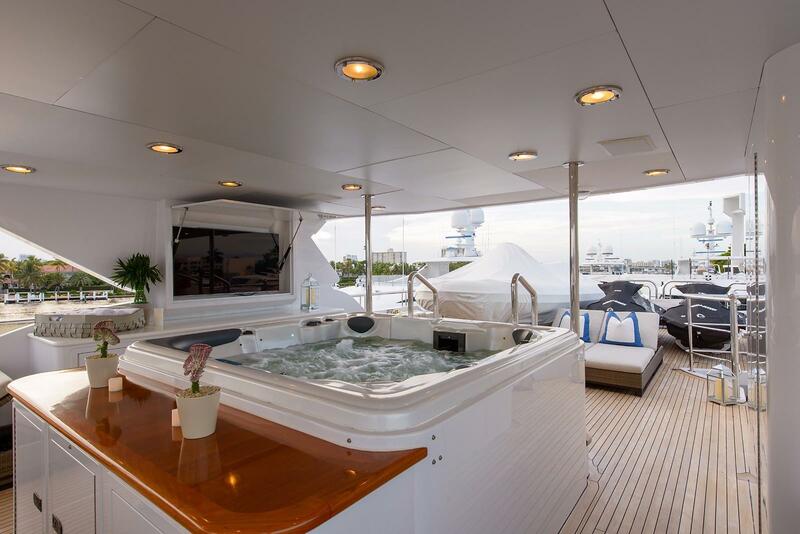 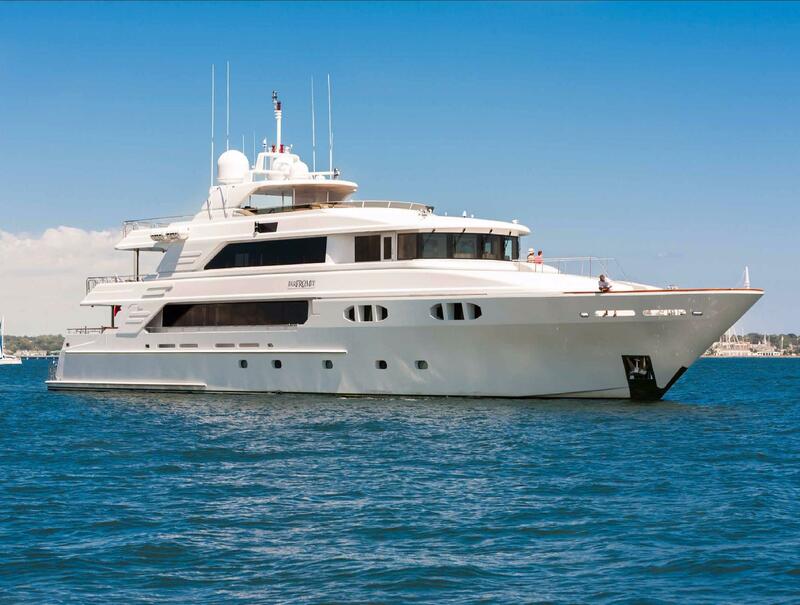 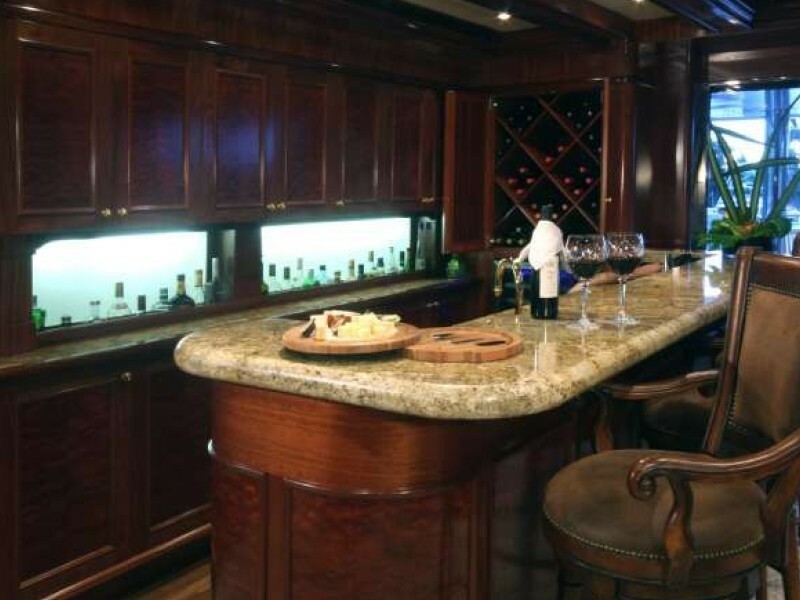 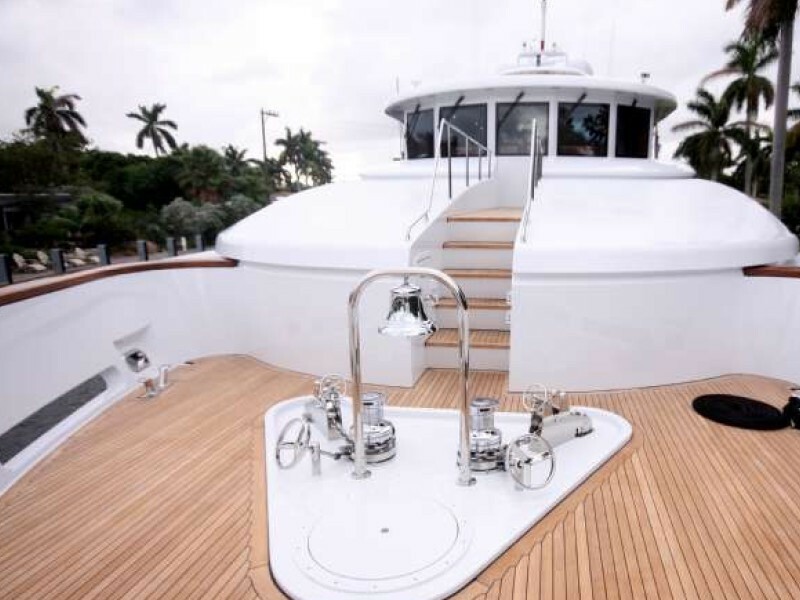 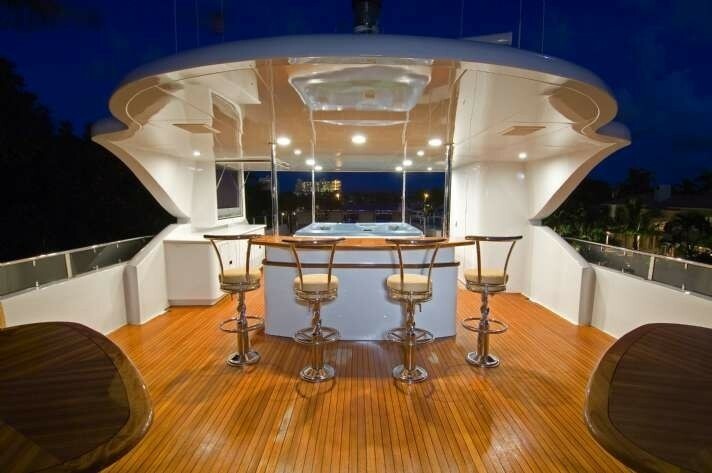 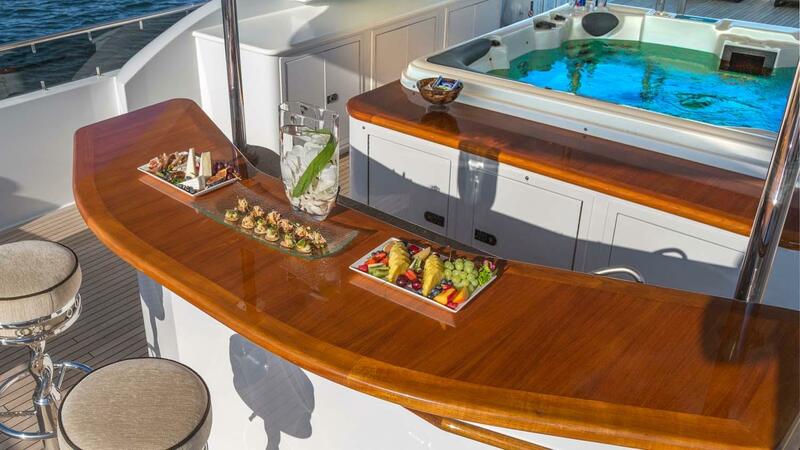 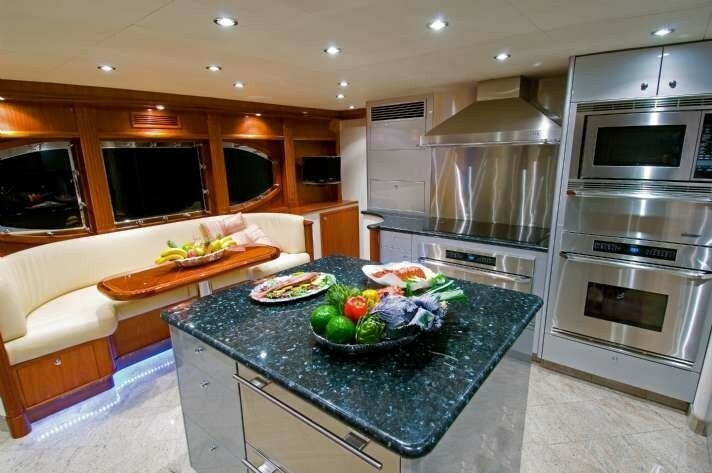 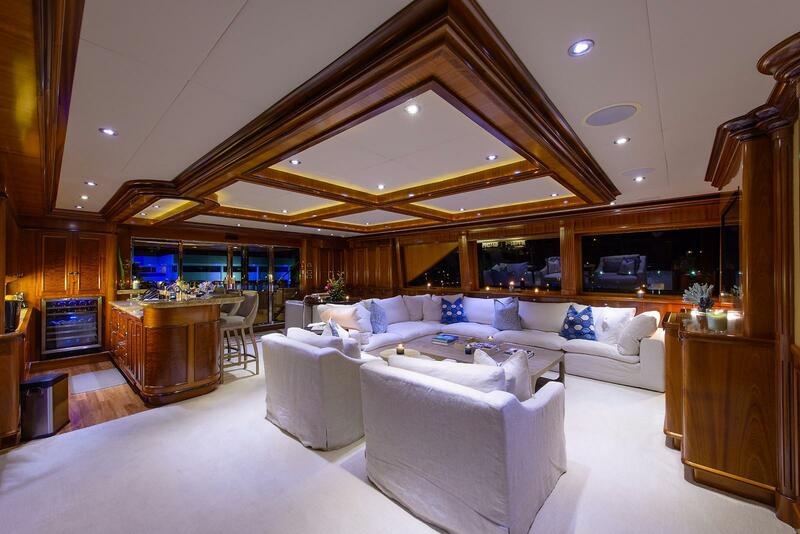 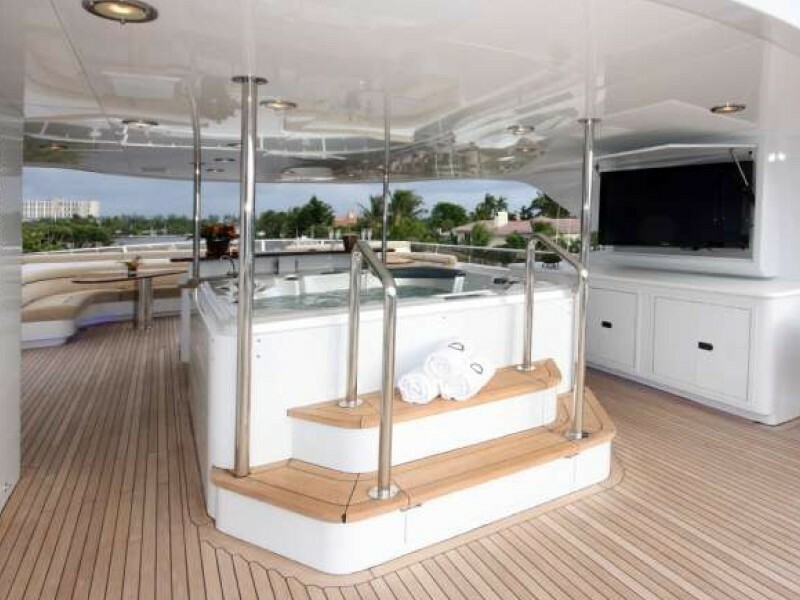 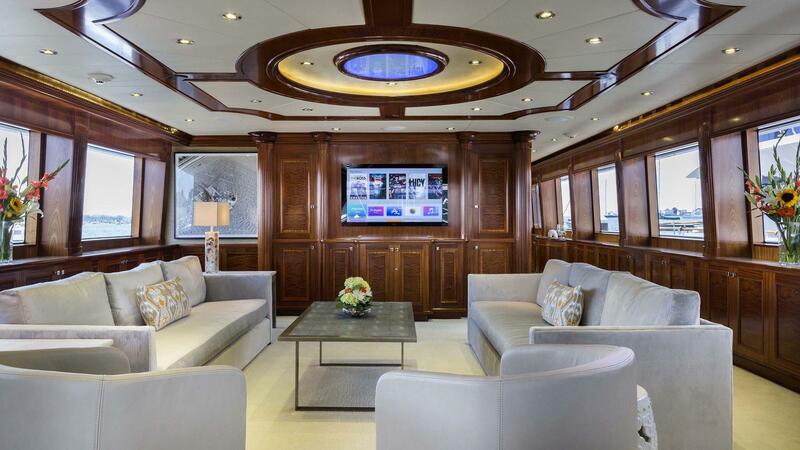 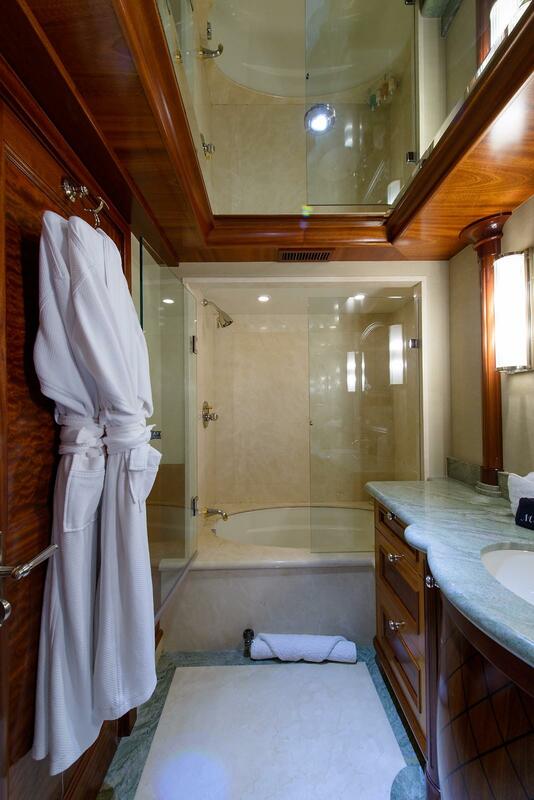 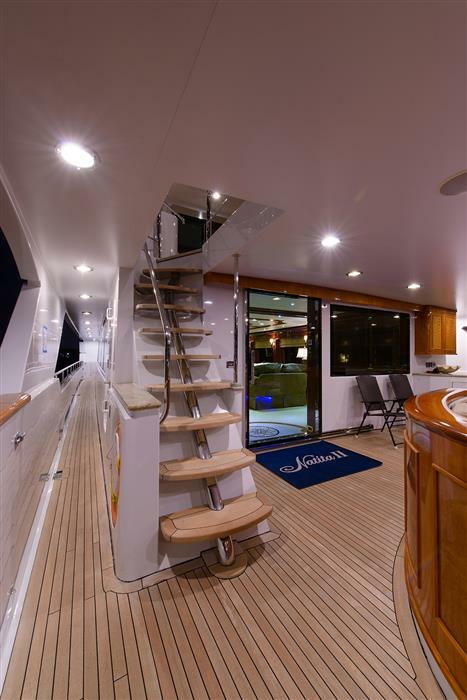 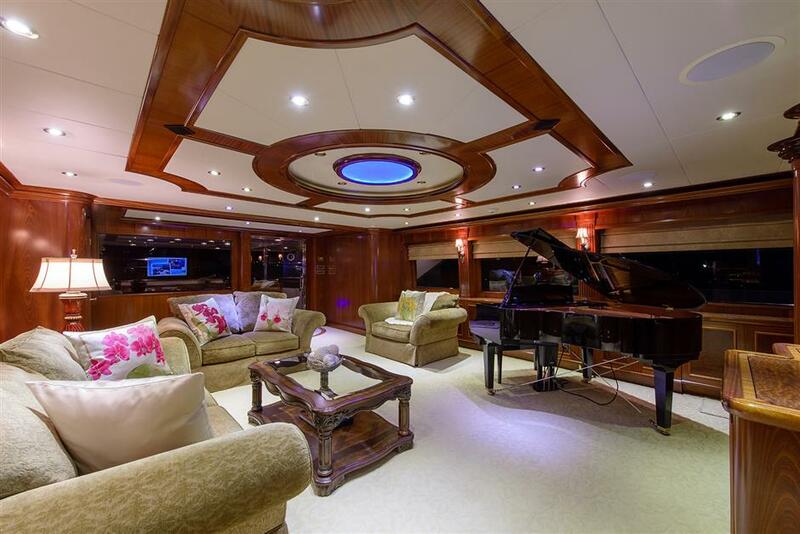 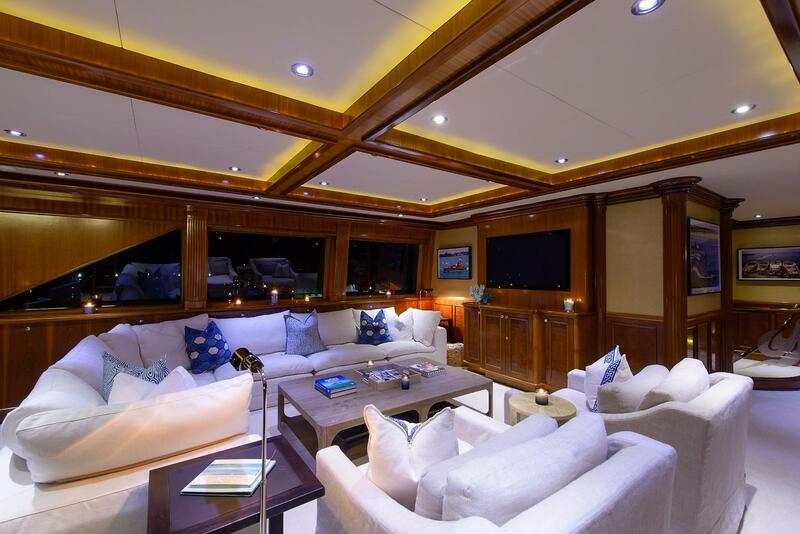 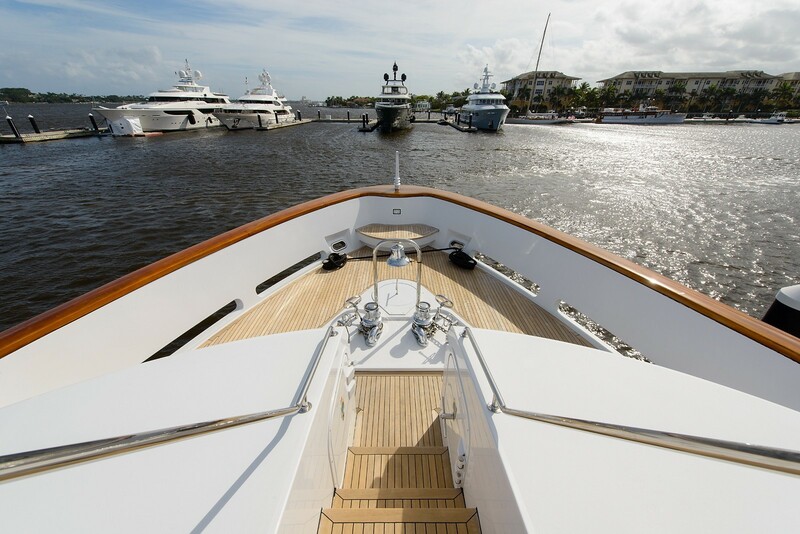 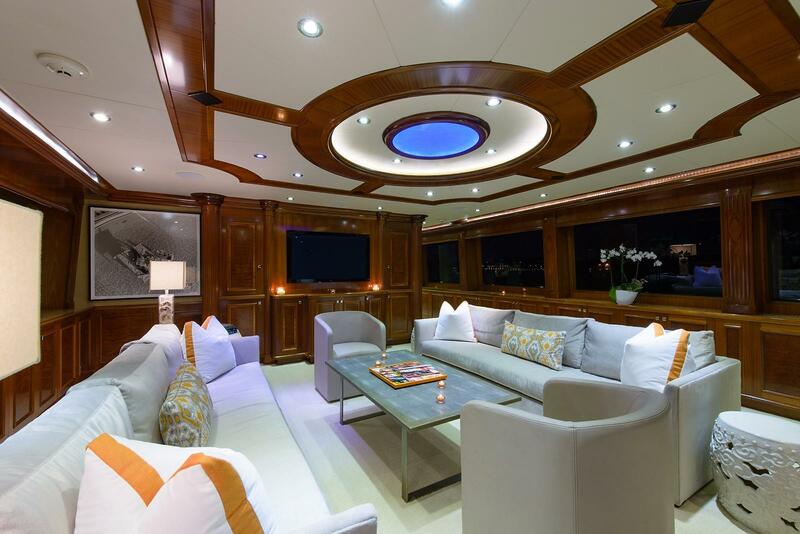 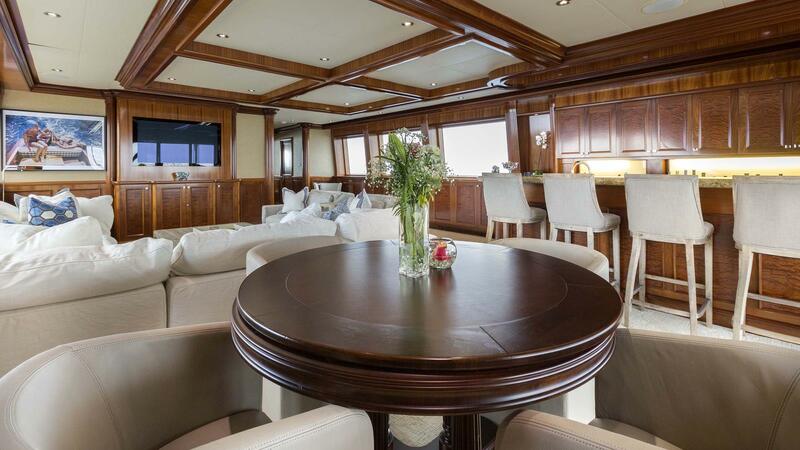 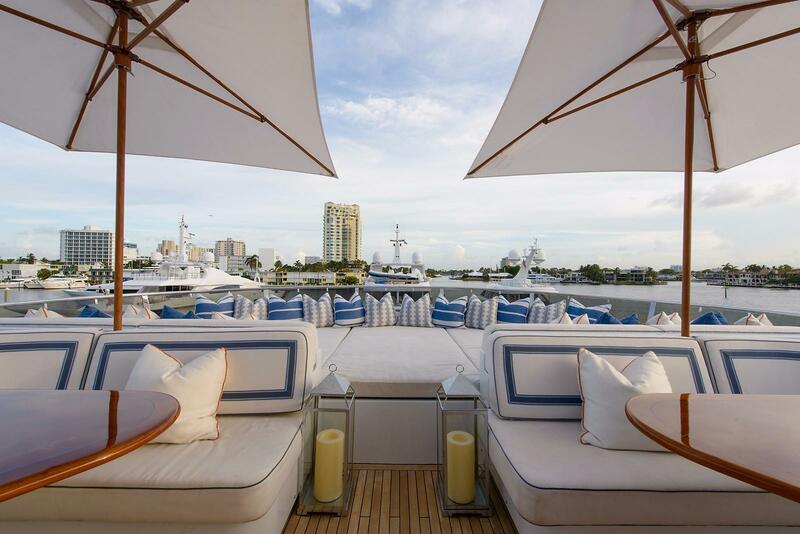 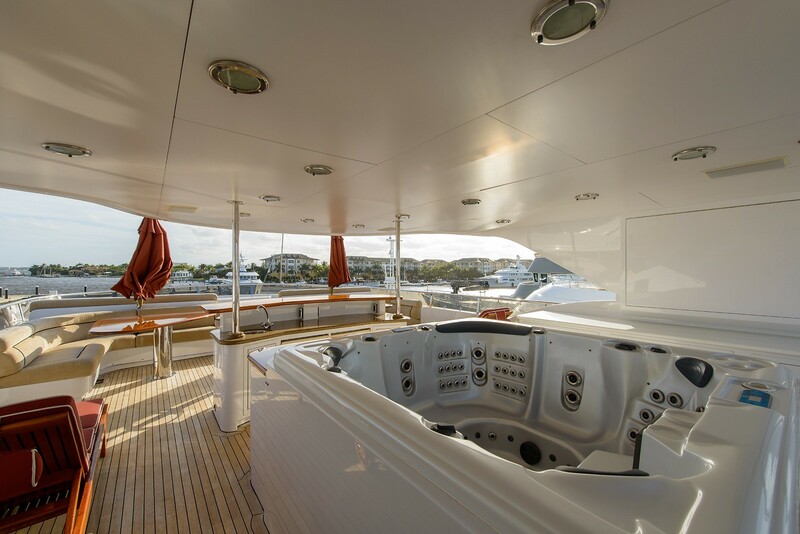 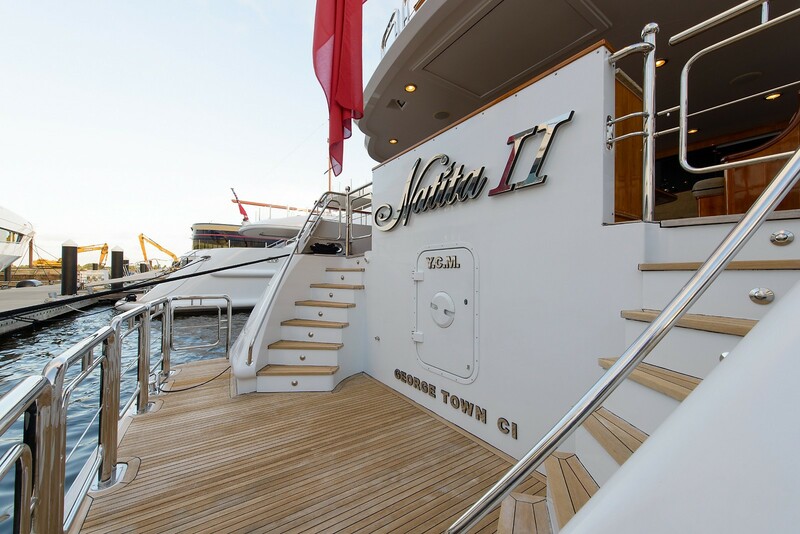 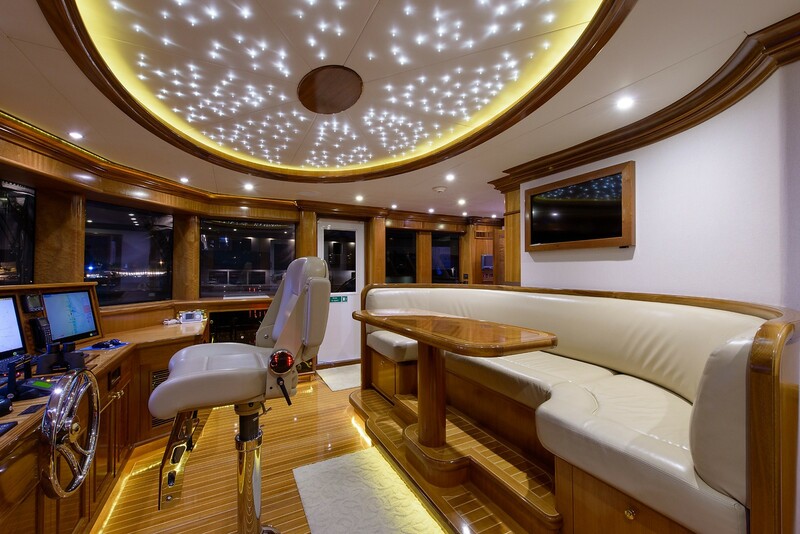 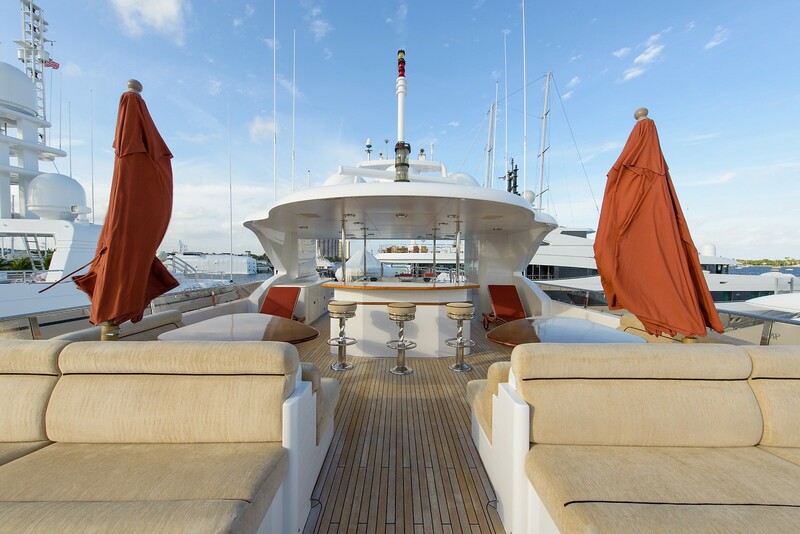 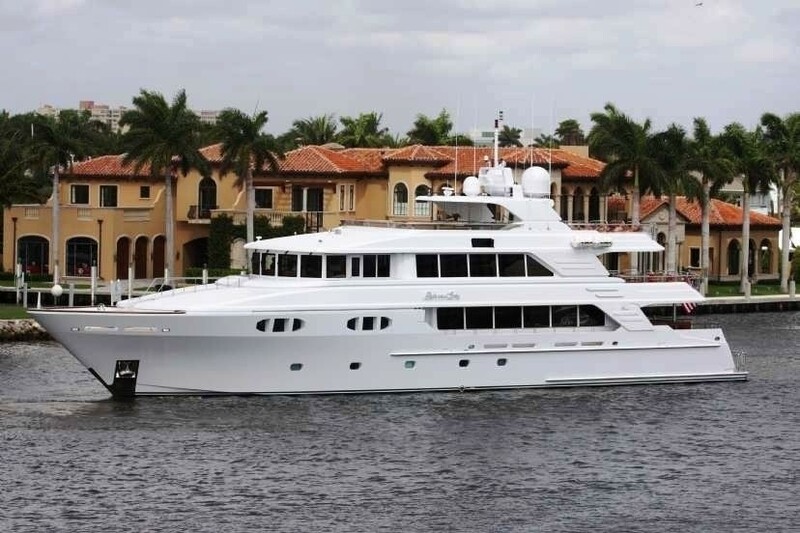 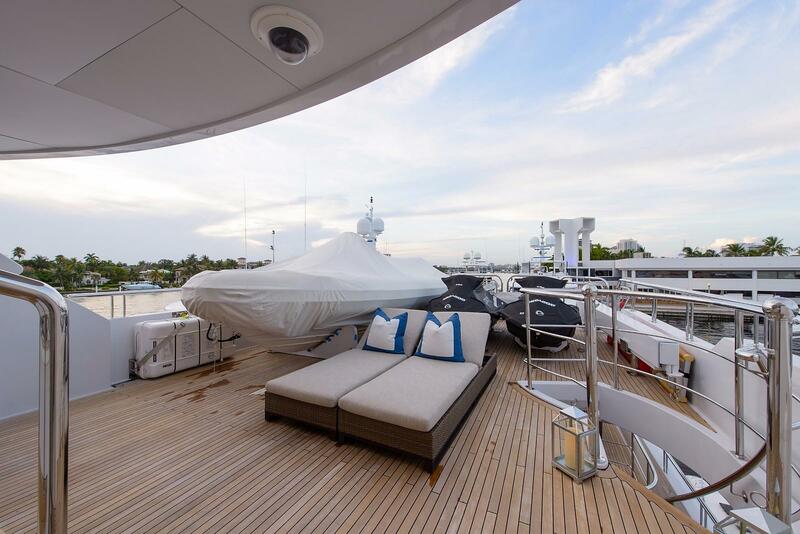 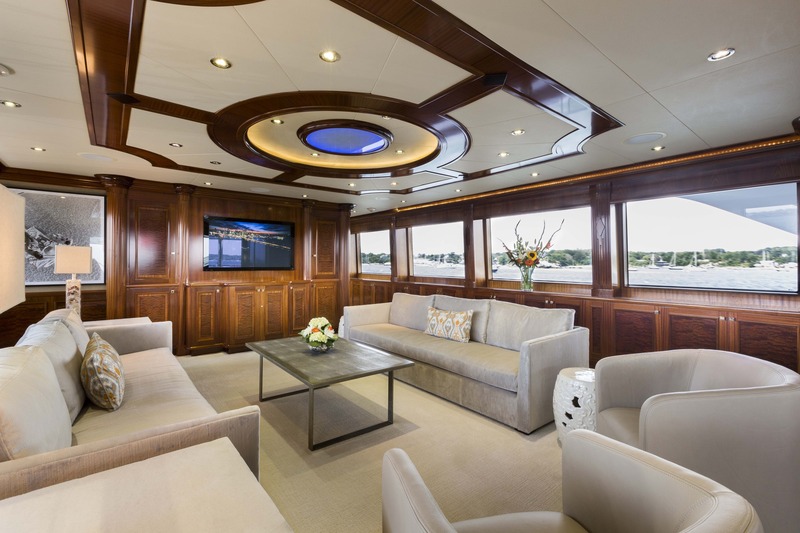 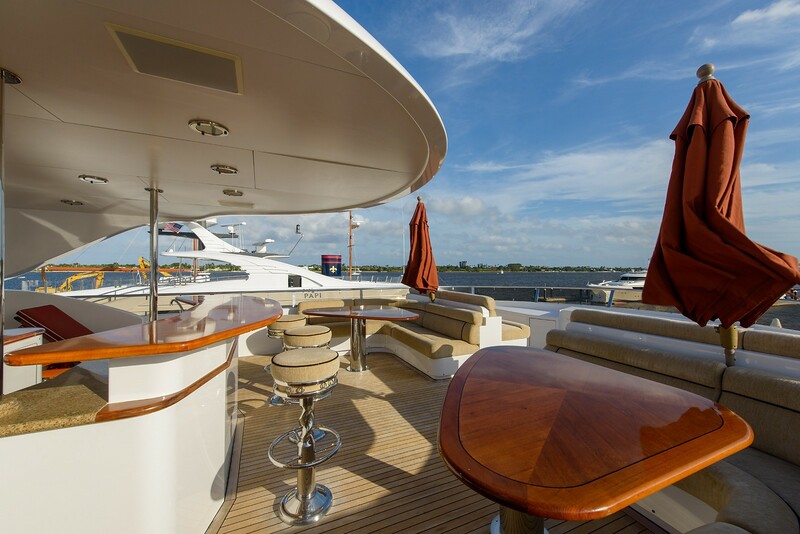 Included on the aft deck is a custom teak and granite topped full-service wet bar and flip-down 50" LCD TV. 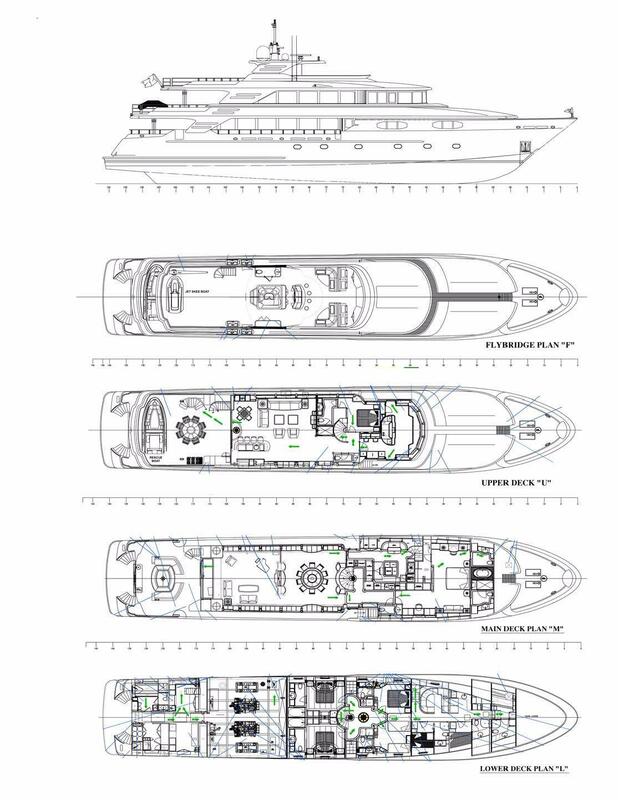 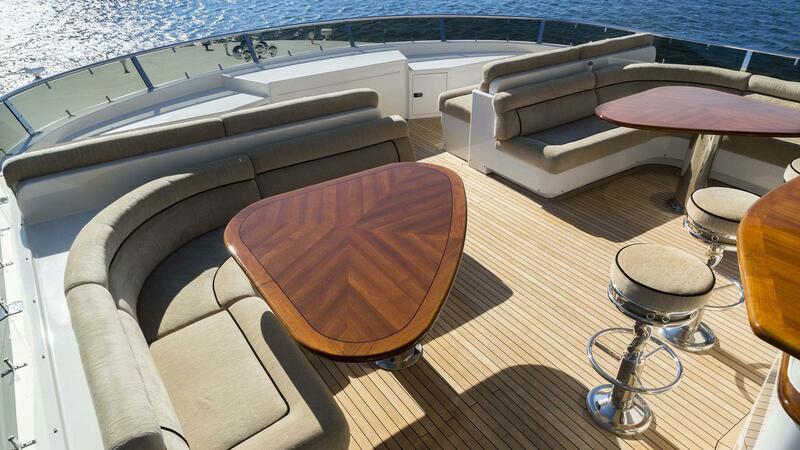 The aft deck gives way to the full beam extended swim platform and inviting teak beach. 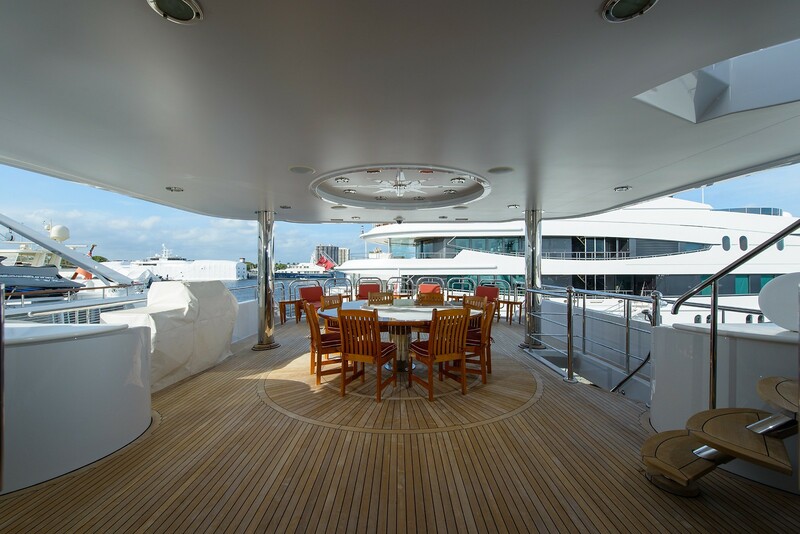 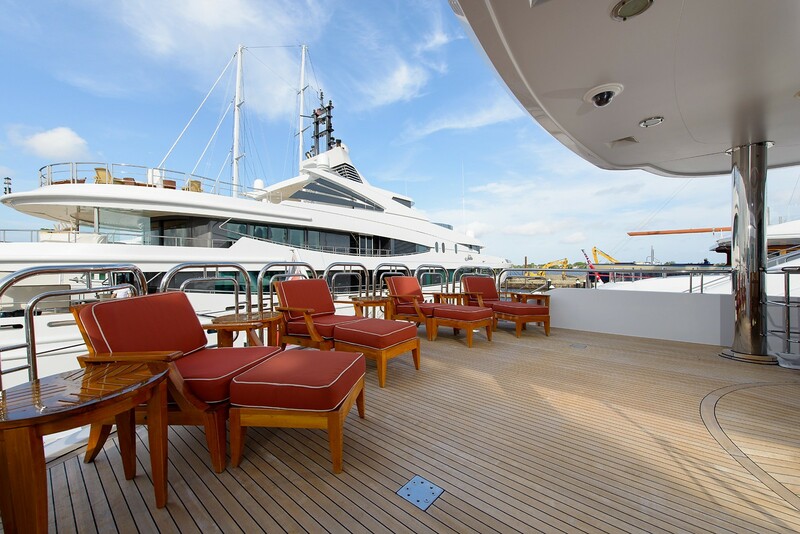 Aft of the sky lounge, the upper deck, features a teak table with a compass rose inlay that is also duplicated on the ceiling, seating ten guests. 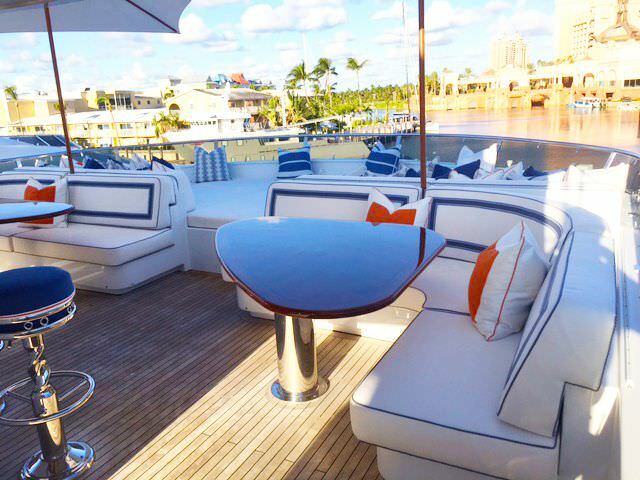 The aft deck has additional exterior lounge seating and coffee tables and is an excellent choice for entertaining and relaxing. 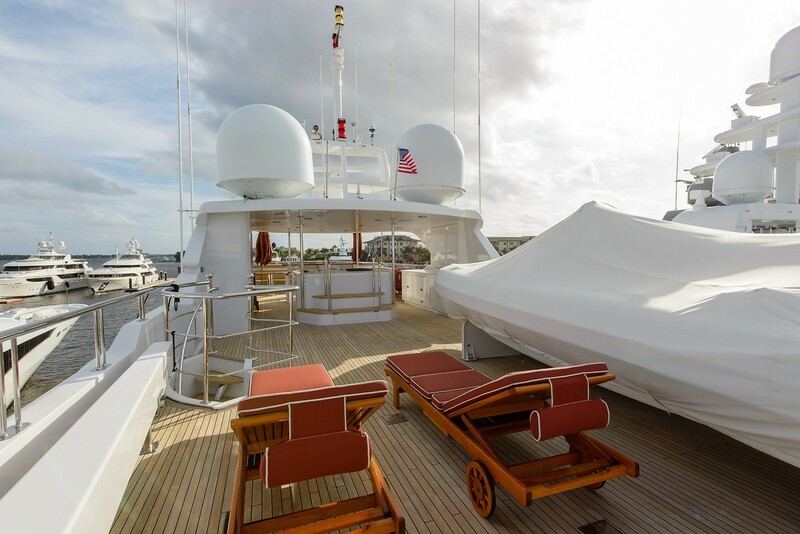 The Sundeck boasts a half-moon shaped wet bar wrapping around the Spa Pool hot tub, with four comfortable bar stools. 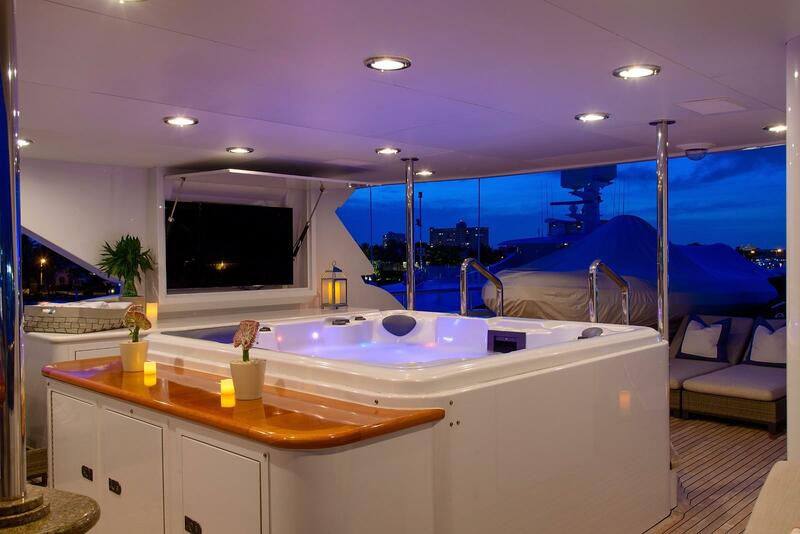 The large heated 60 Jet Spa Pool is built in under the arch section. 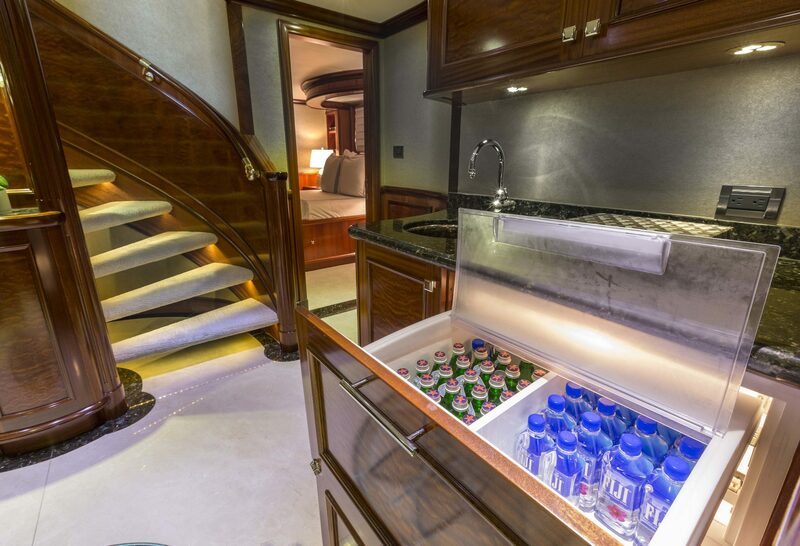 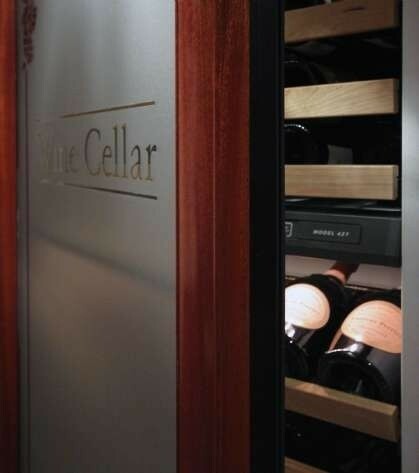 An air-conditioned day head is conveniently located for all guests. 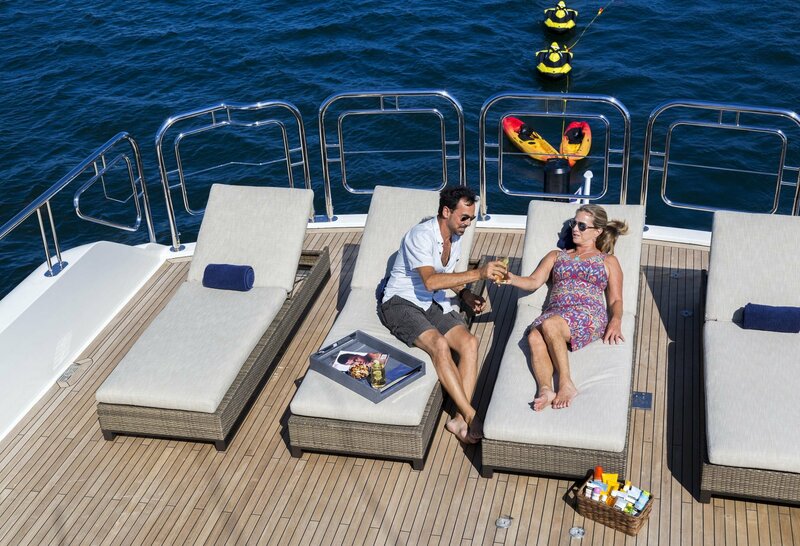 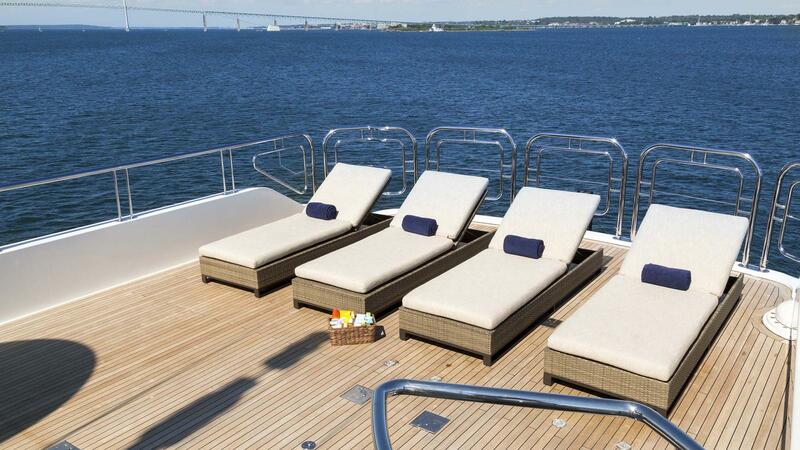 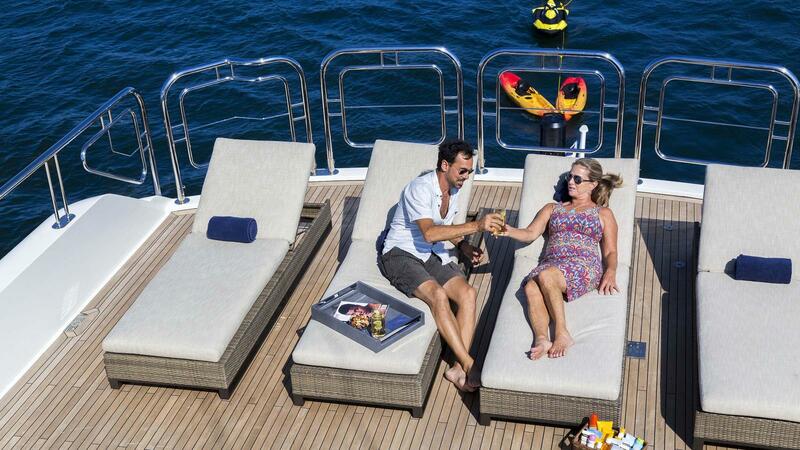 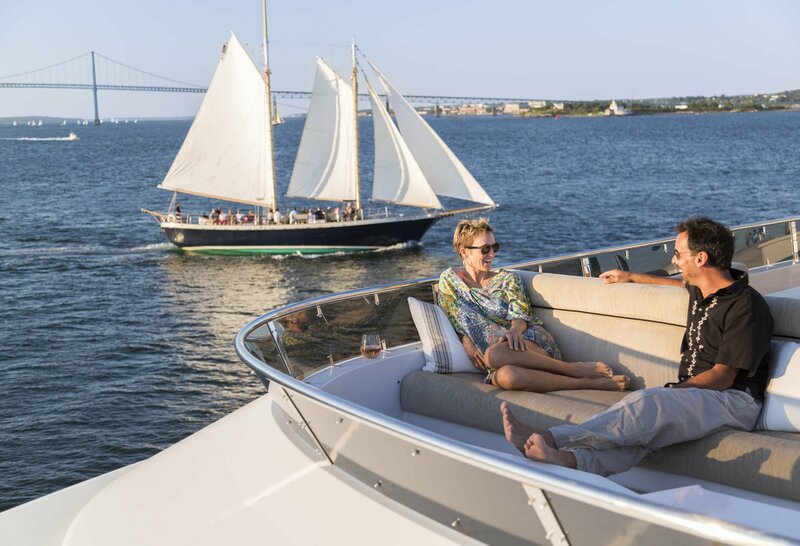 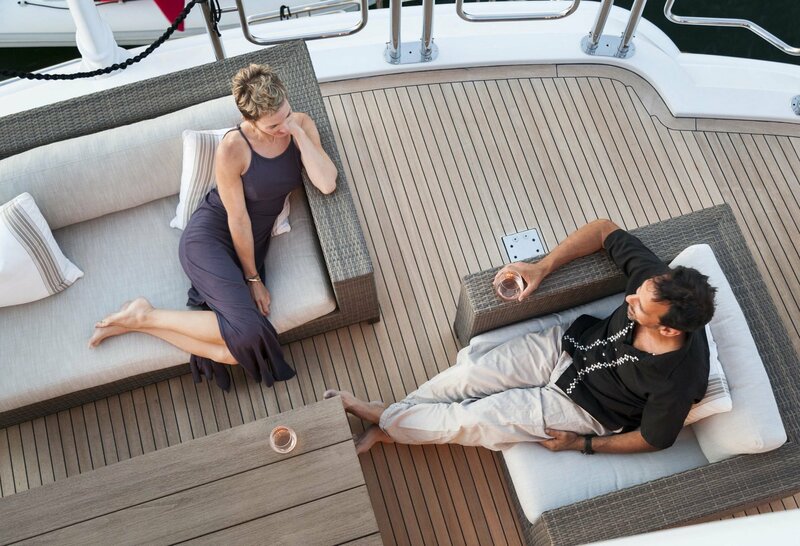 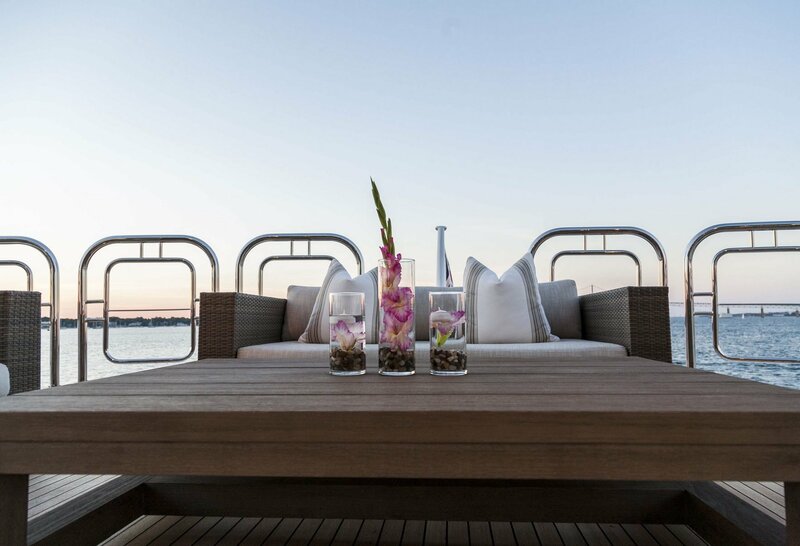 Further aft on the sundeck is four chaise lounge chairs, while forward are four large seating areas (two facing forward and two facing stern) with teak tables and custom umbrellas. 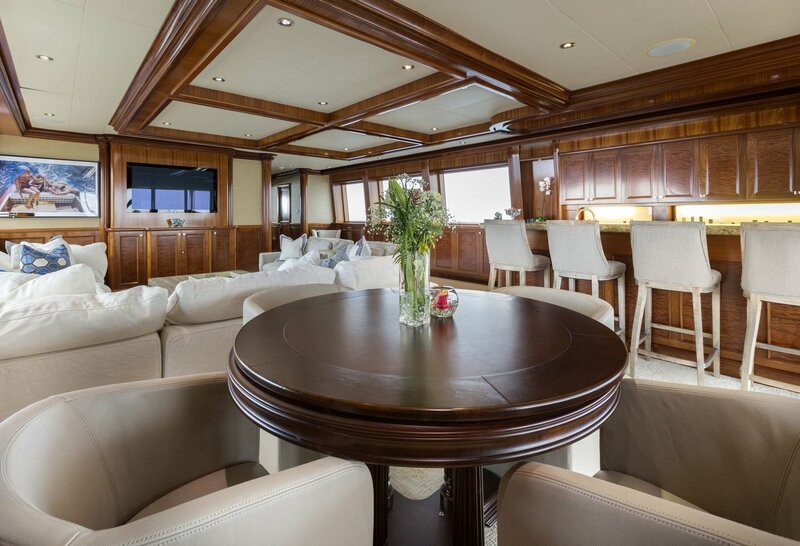 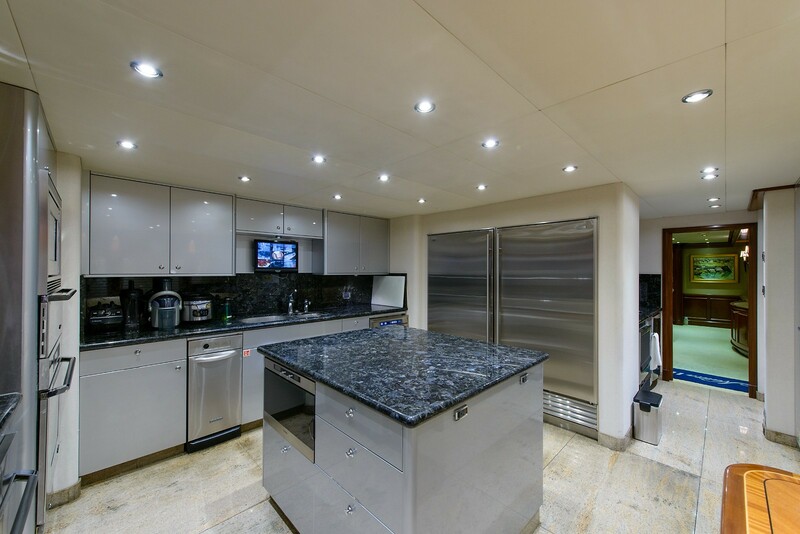 A full entertainment system on the sundeck offers a 50' plasma TV which is fully remote controlled and can display all ship systems, radar displays, chart plotter, DVD or Satellite TV with full surround sound. 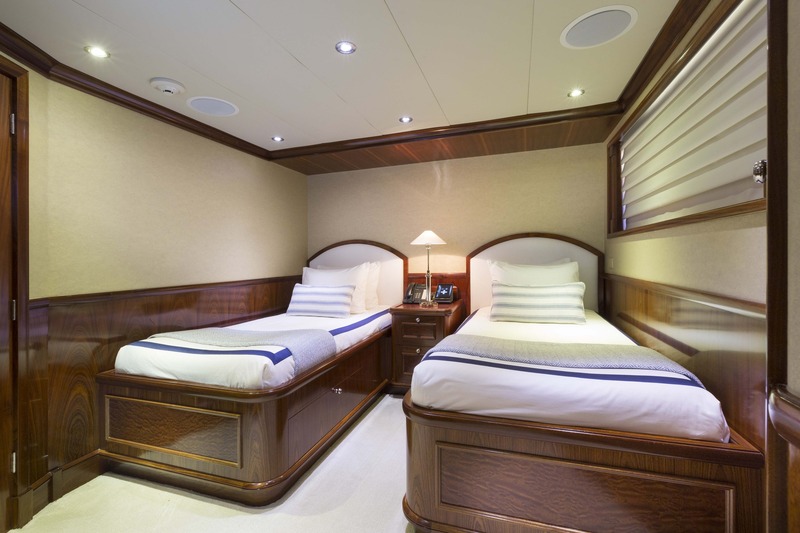 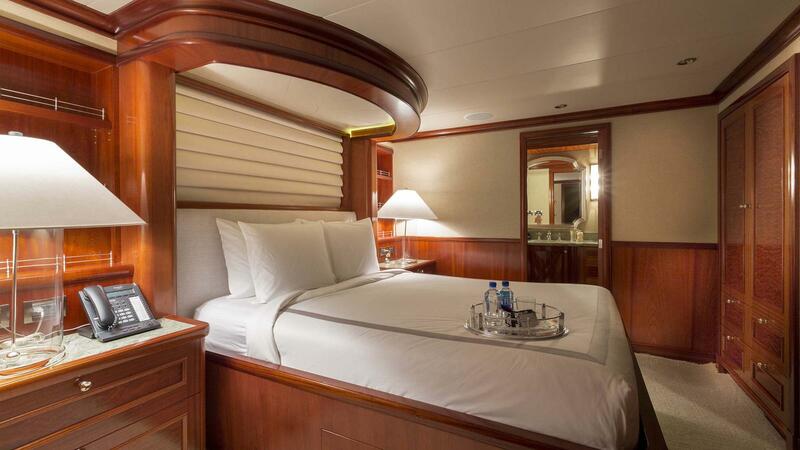 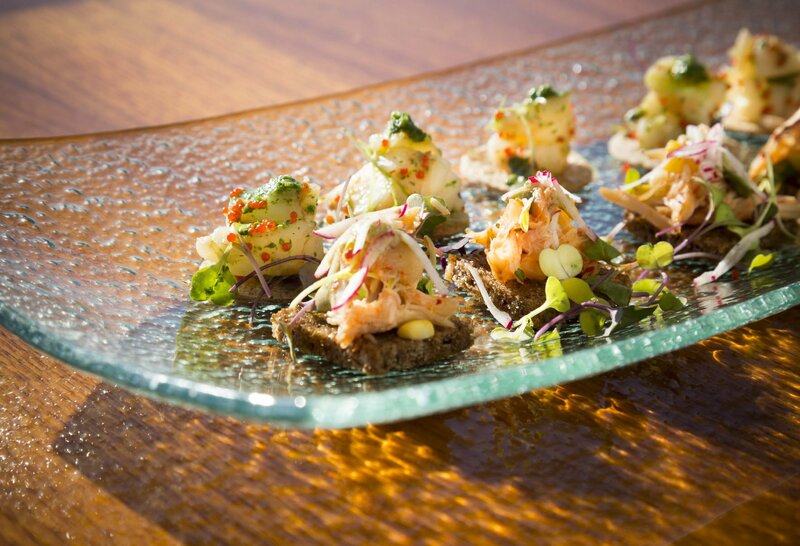 Accommodation is in 5 cabins, for up to 10 charter guests. 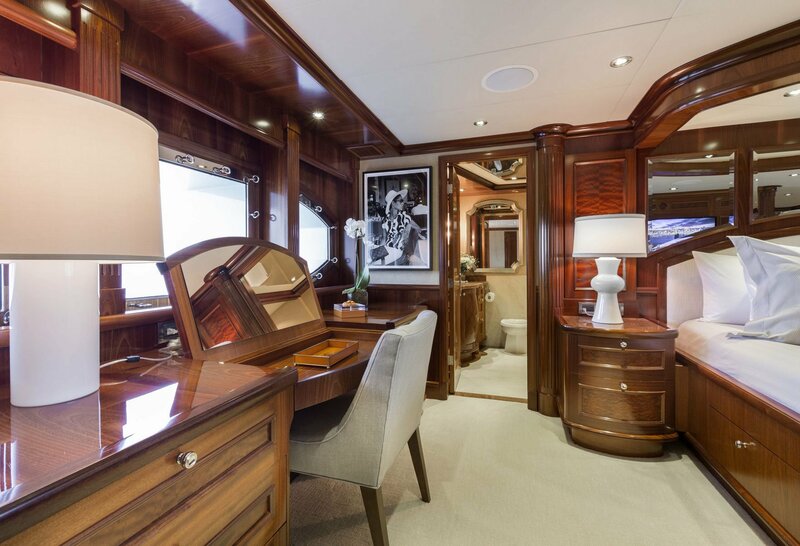 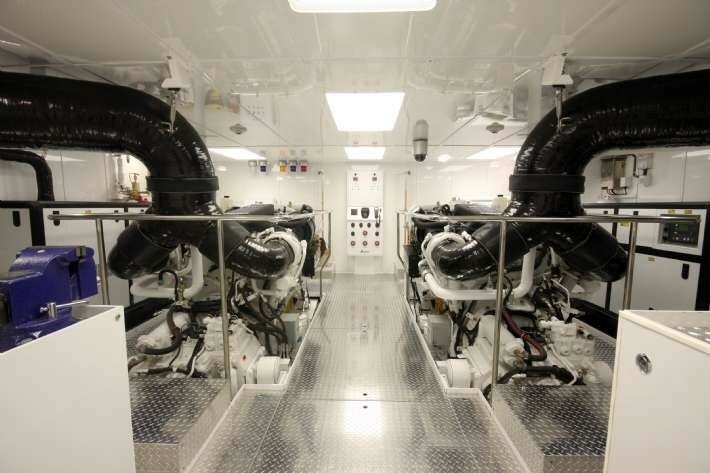 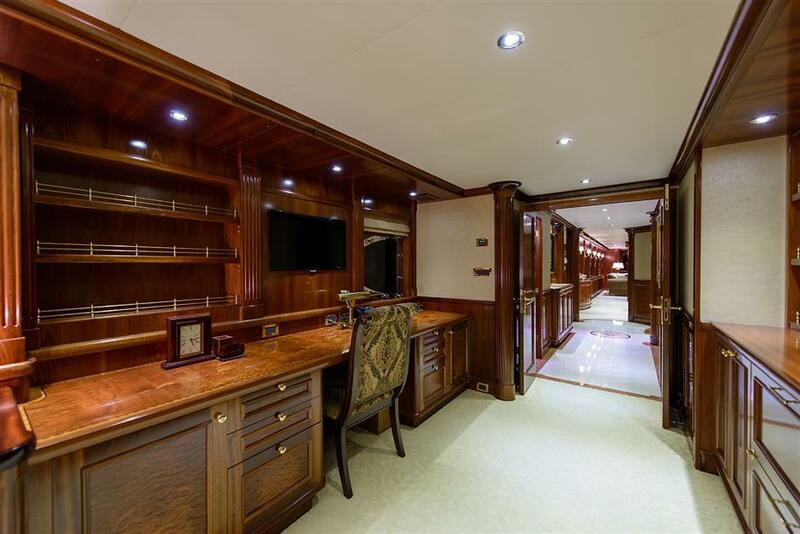 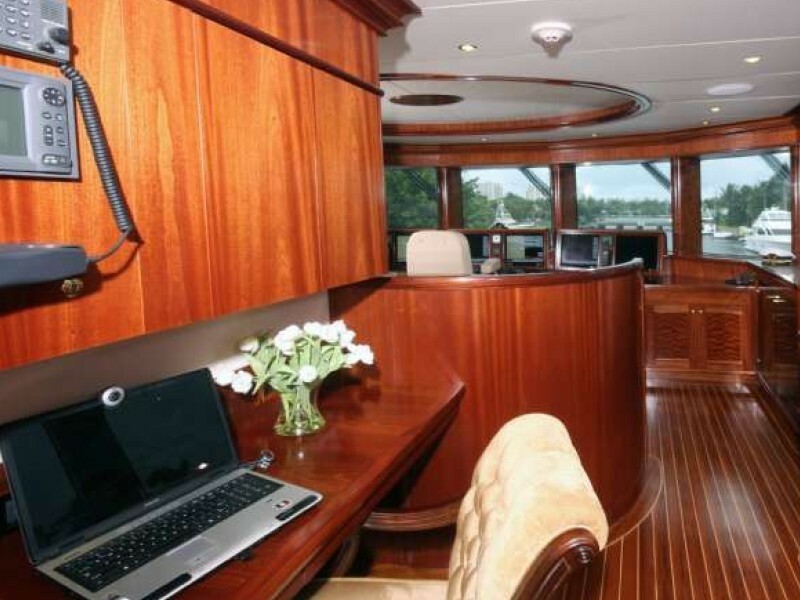 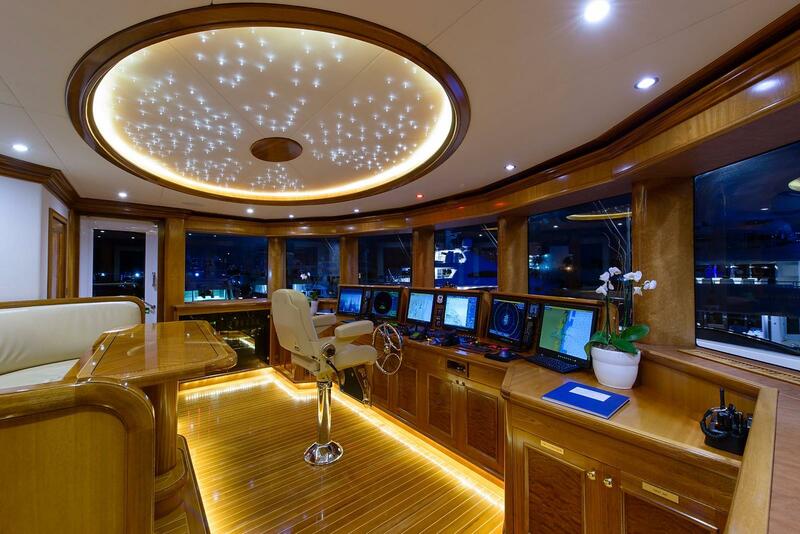 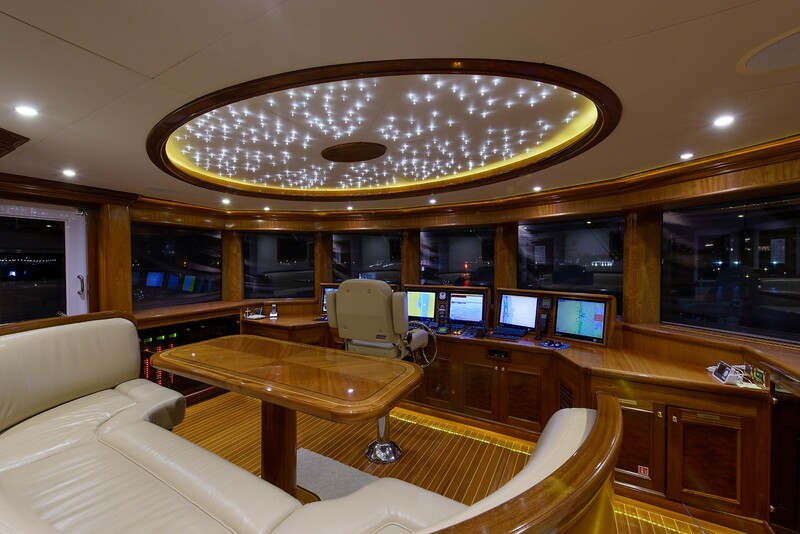 This includes a full beam Master suite located on main deck with King Sized bed, built in desk and bookshelf/office area with computer center and a Subzero 2 drawer refreshment center. 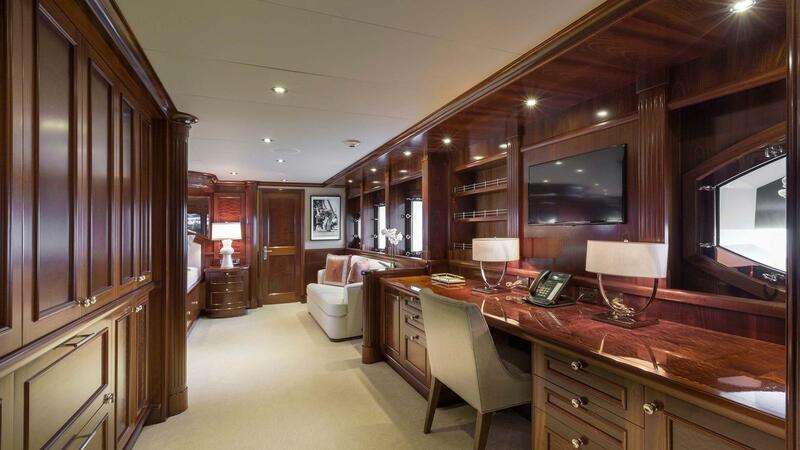 There is lounge on the starboard side and dresser with vanity on port and large walk in wardrobe. 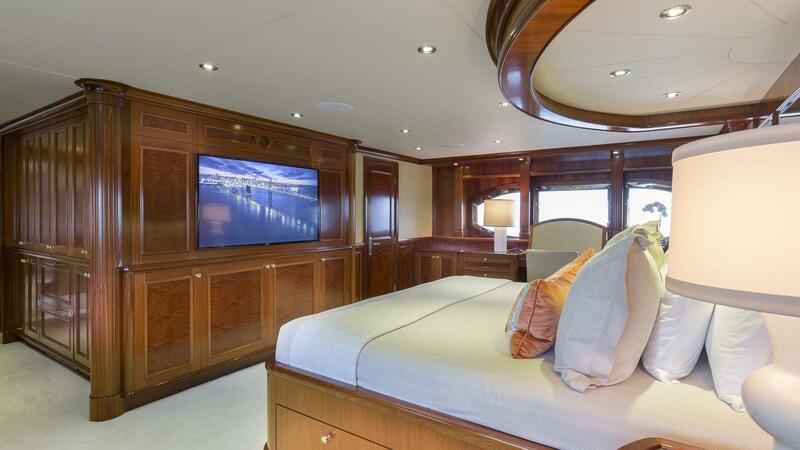 A full entertainment system is hidden in cabinetry opposite the bed. 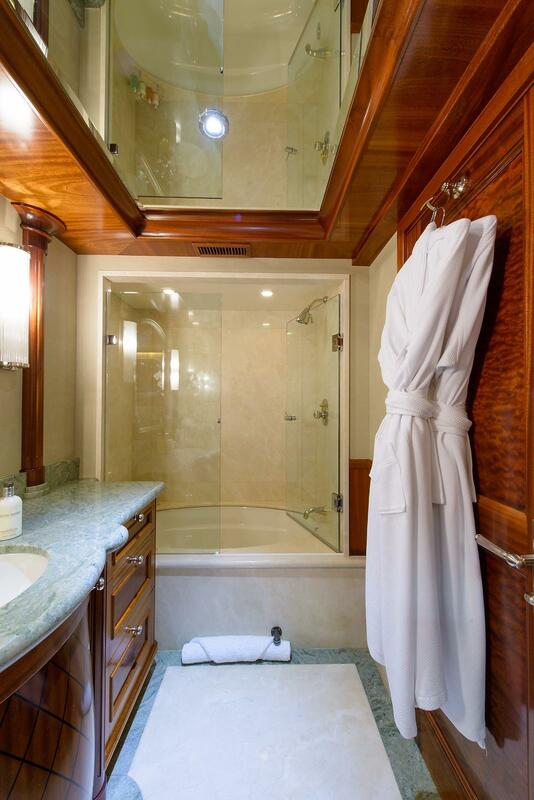 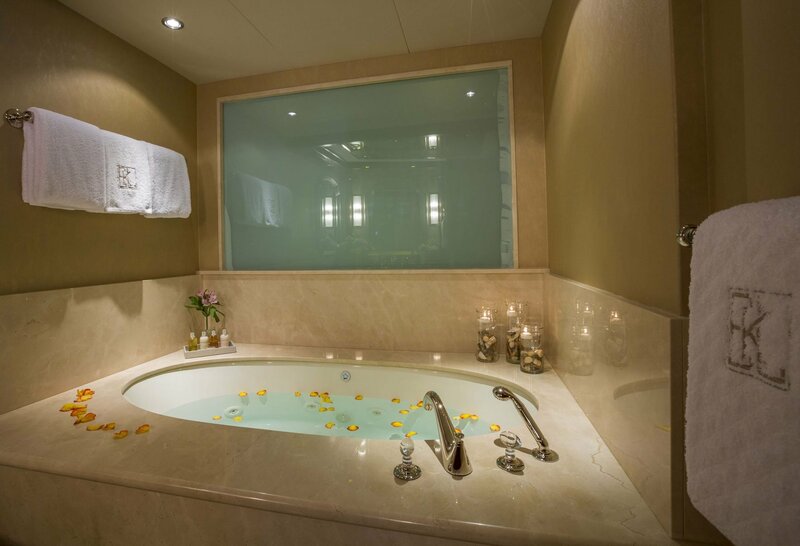 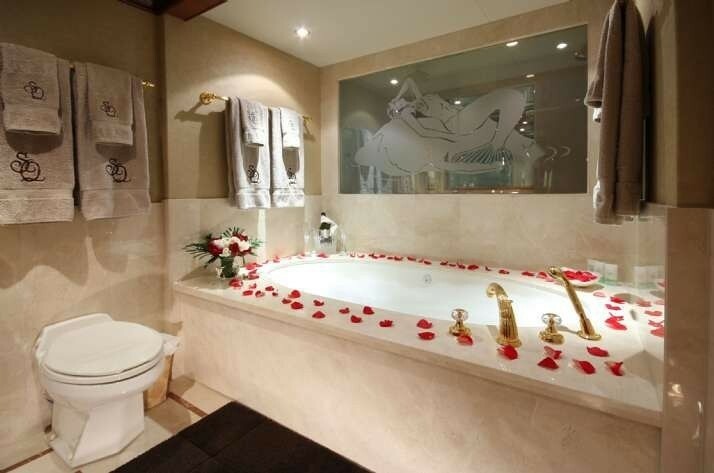 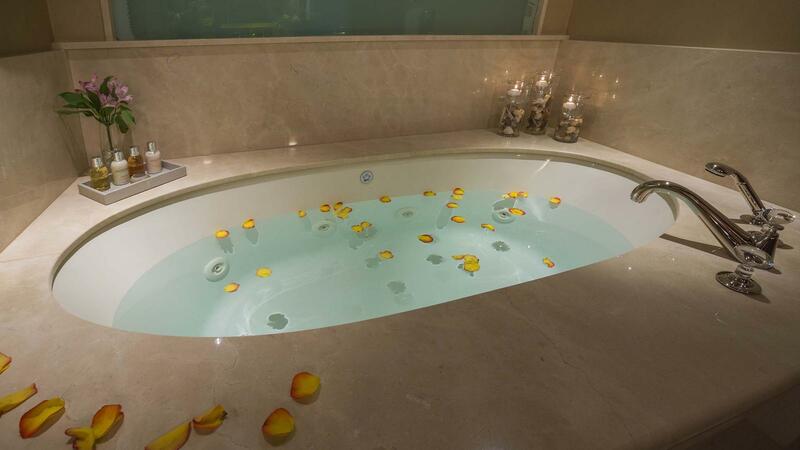 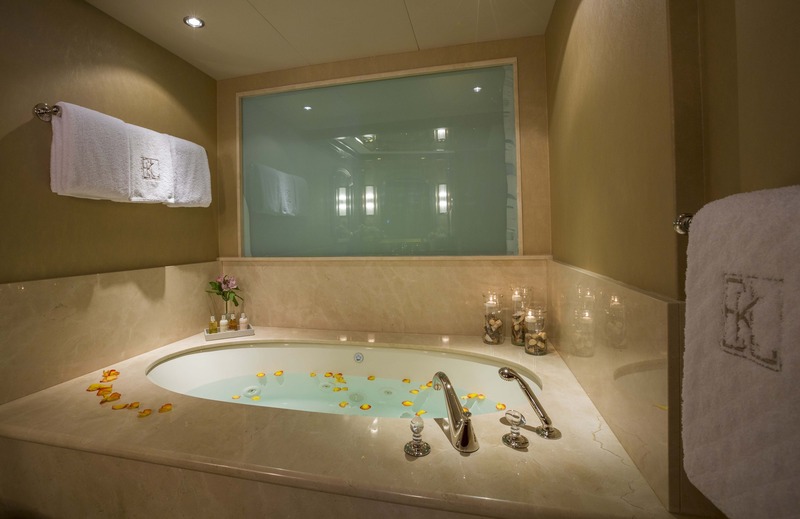 His and her bathrooms are located forward of the king size bed, his with dual head shower and steamer, hers with a large Spa Pool tub. 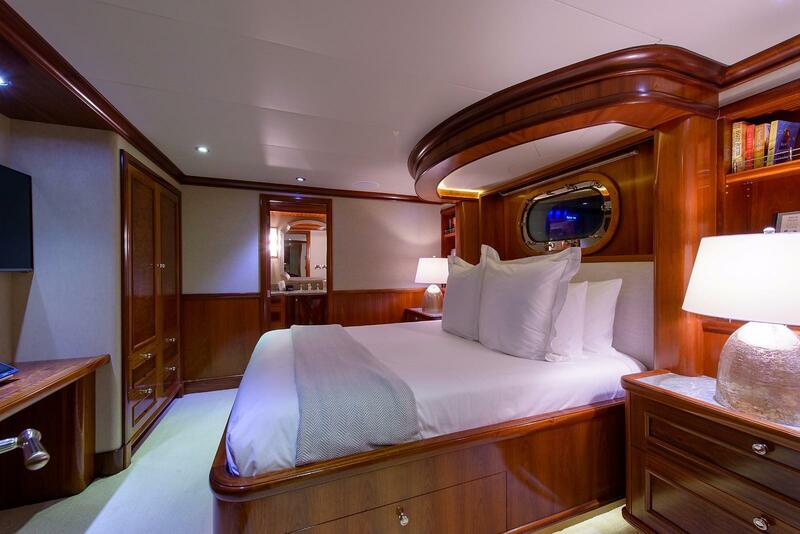 On the lower deck are 4 Guest cabins, 2 doubles with queen size beds, shower room and bathroom ensuite, 1 double with queen size bed and shower ensuite, plus 1 twin with shower room ensuite. 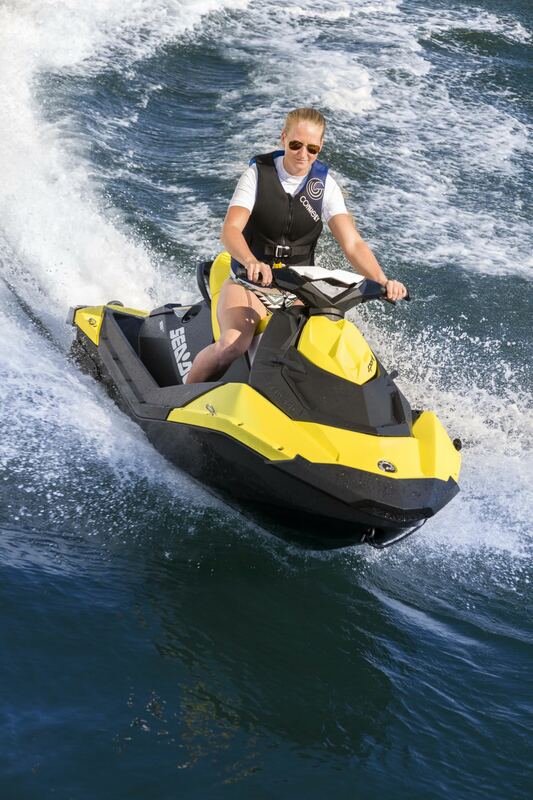 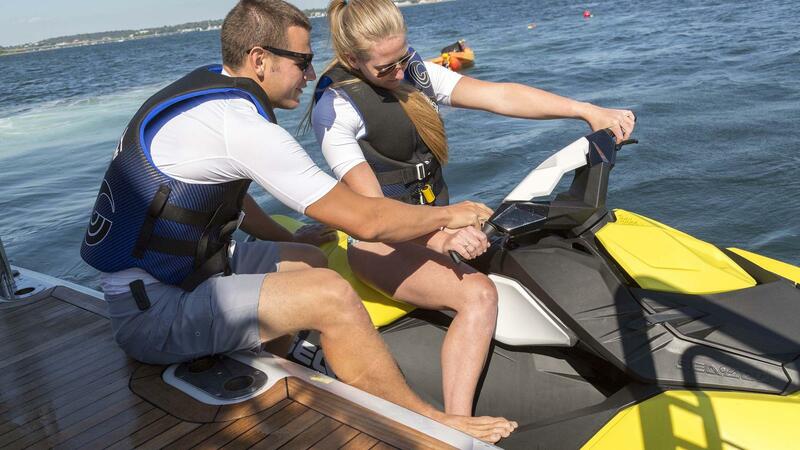 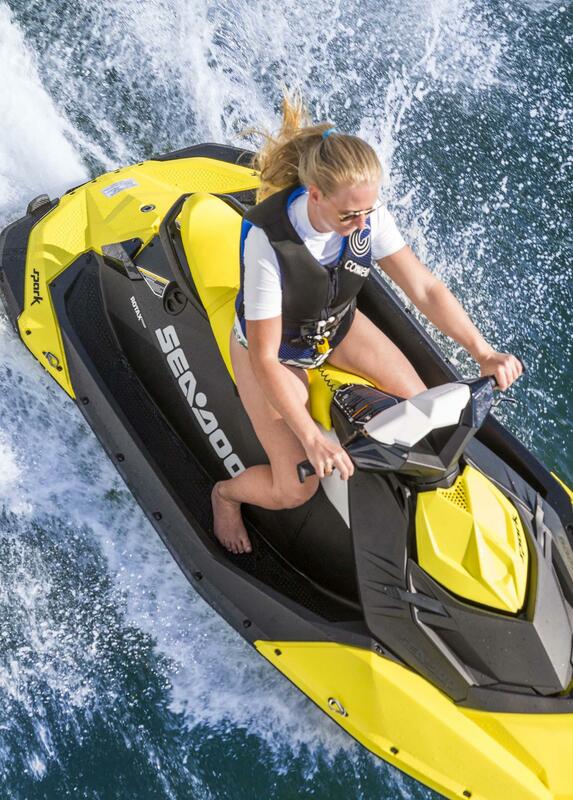 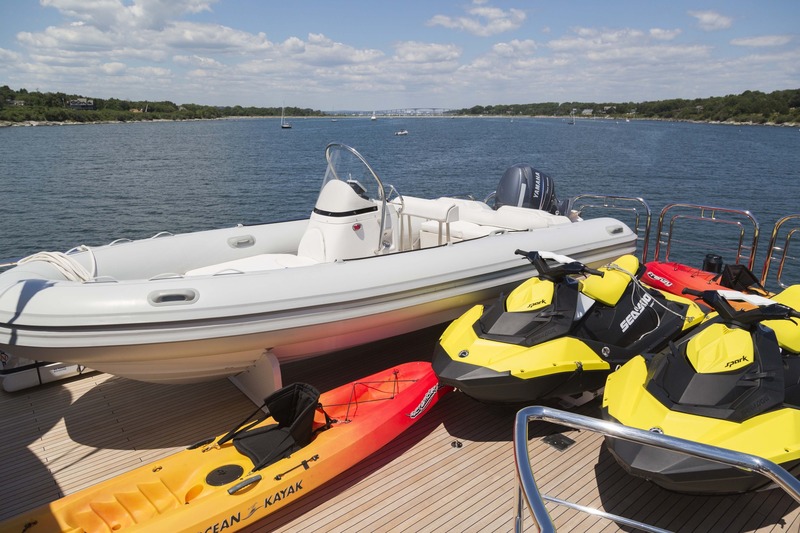 The charter yacht FAR FROM IT has the following extras onboard: Tenders & Toys: 33' Boston Whaler (NEW 2017) 18' (5.7m) RIB with 115 hp Yamaha (2) SeaDoo Spark Wave runners (2) SeaBobs Dive compressor Snorkel gear Wakeboard Towable Toys AUDIO & VISUAL EQUIPMENT Equipped with SONAS music system and Apple TV throughout the vessel. 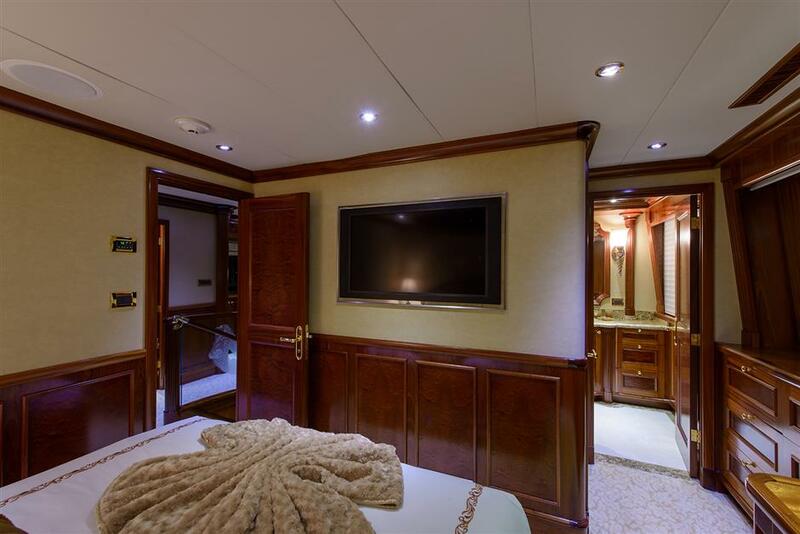 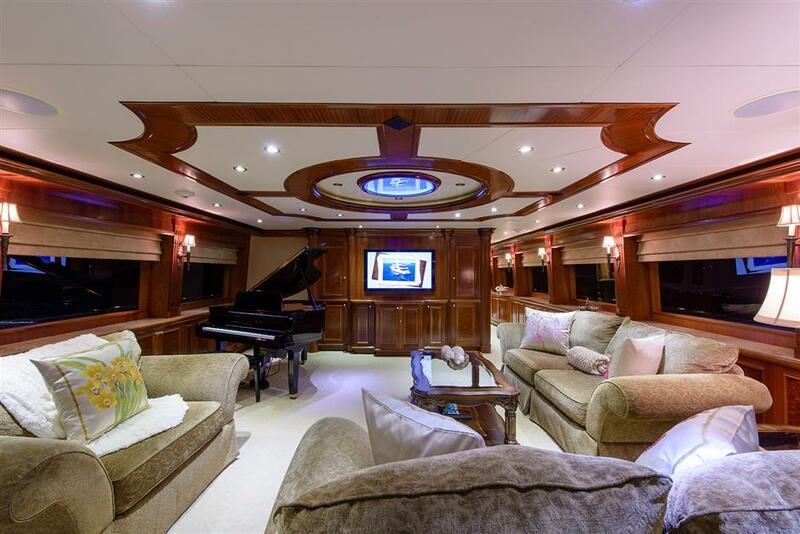 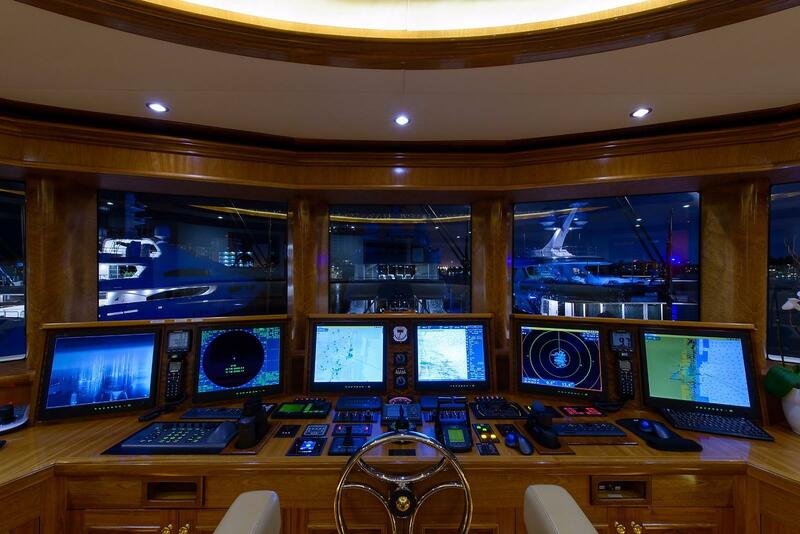 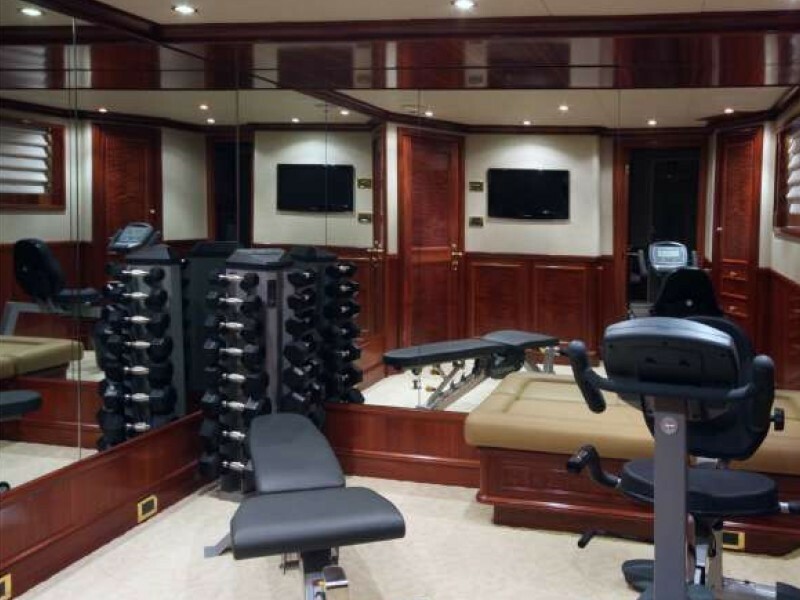 Every cabin has a TV, with four in the master suite, aft deck, upper aft deck, sky lounge and salon. 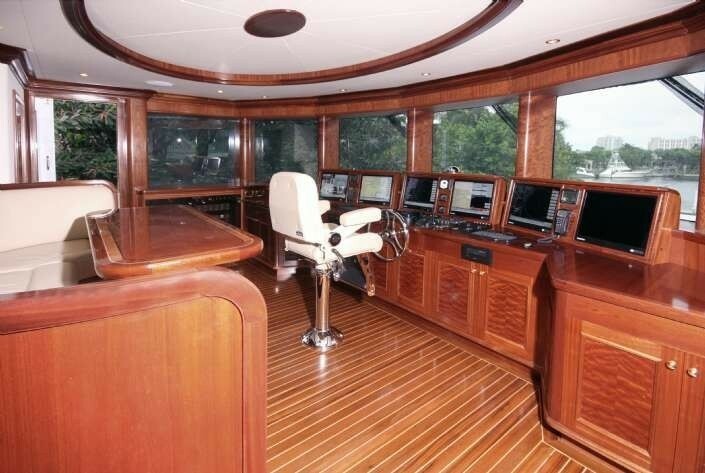 Audio Visual Equipment and Deck Facilities: All new AV equipment.SONAS music system and Apple TV throughout the vessel. 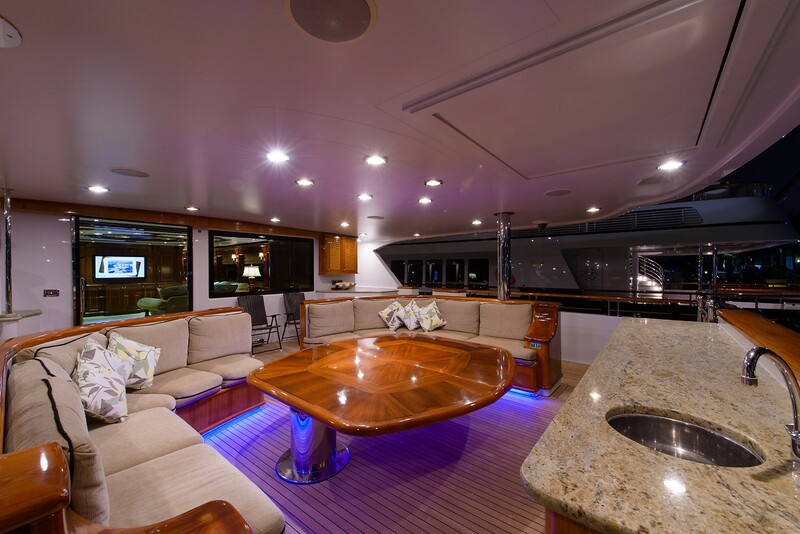 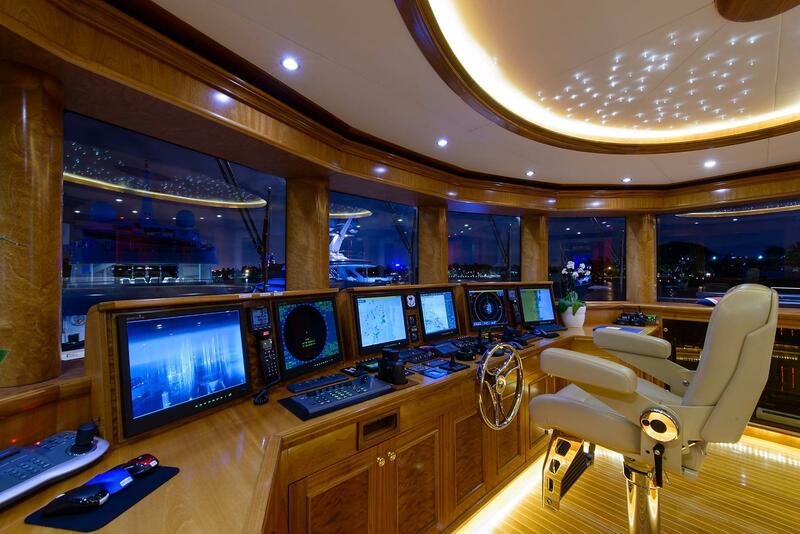 Every cabin has a TV, including, aft deck, upper aft deck, sky lounge and salon.